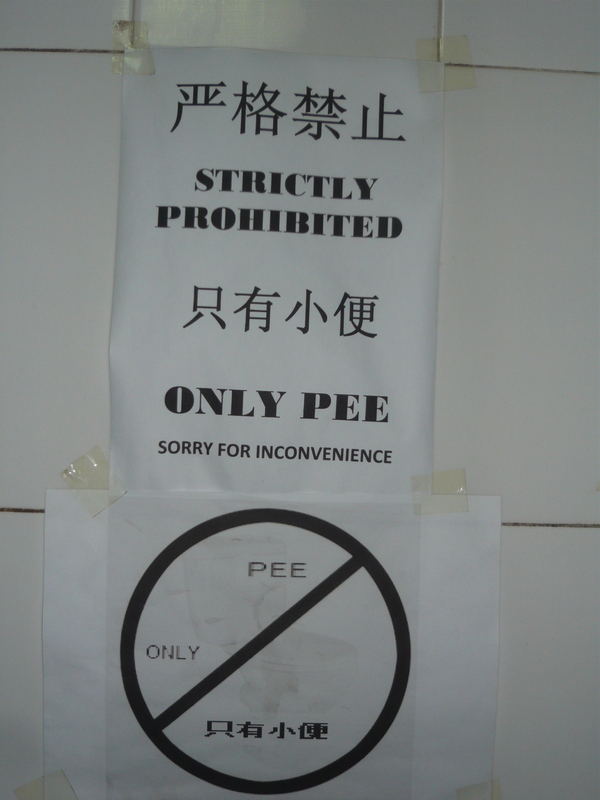 For anyone who has ever traveled in Asia, then you understand exactly what the title of this post is about. 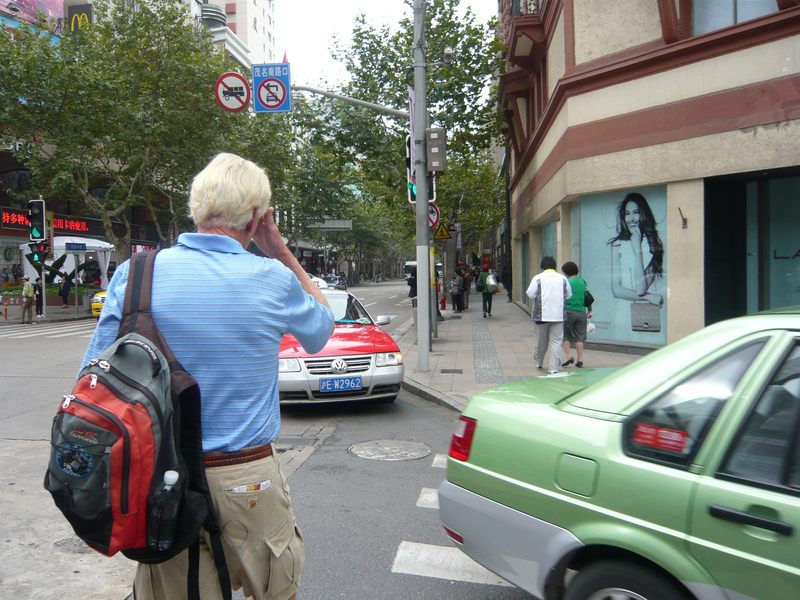 Walking anywhere in any big Asian city – whether it be Beijing, Shanghai, Kathmandu, Bangkok or Delhi – requires a certain kind of expertise, guts and street smarts. 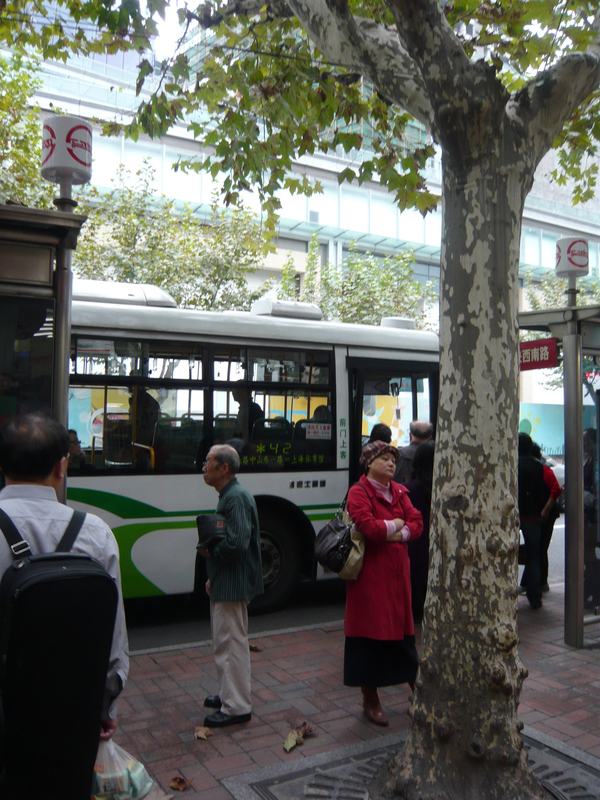 In these large urban jungles, traffic comes in all shapes and sizes and is massive, loud, aggressive and sometimes uncaring about human life. You make a mistake once by stepping out into the street without looking and you could be dead. 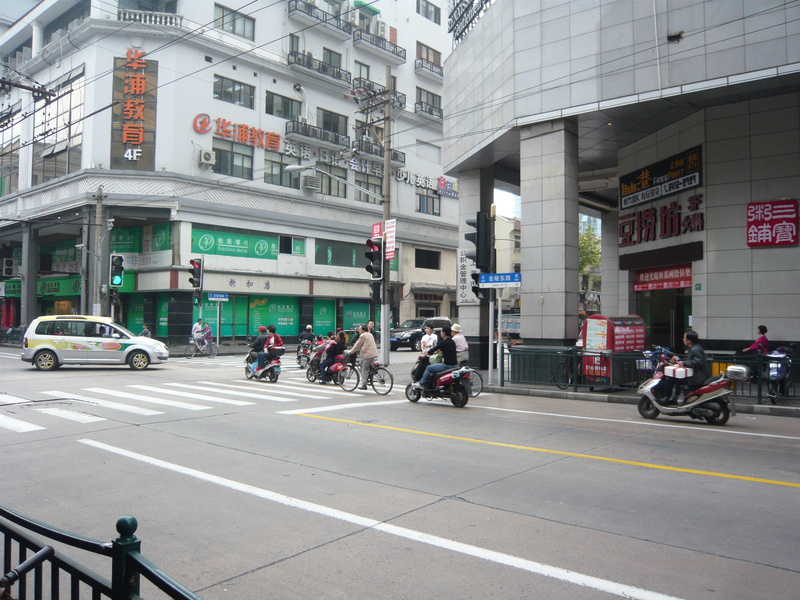 The intimidating street: Crossing the street in Shanghai can be a dangerous thing. I discovered this frightening fact the first time I was in Kathmandu and New Delhi. I had read about it before so was thankfully somewhat prepared and aware that there are real dangers involved in crossing the street and even walking down the sidewalk. I grimaced when I heard the tales of the unexpected tourist who looked the wrong way and got smashed by oncoming traffic. I was prepared, or so I thought. 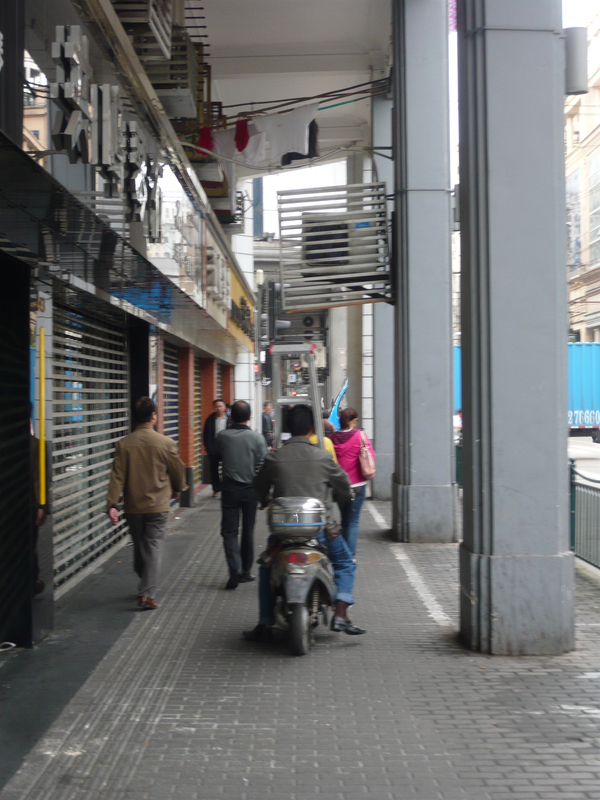 I was shocked and horrified once I actually stepped onto these very streets for the first time and realized that you’ve got to truly pay attention whenever you are walking anywhere in a large Asian City. For human life is not always valued the same in a big city where there are millions of people fighting to survive and get around (ok, this is a little harsh but sometimes I really did feel this way, especially when the cars, trucks and buses came right at me in the middle of an intersection during a green walk sign!). 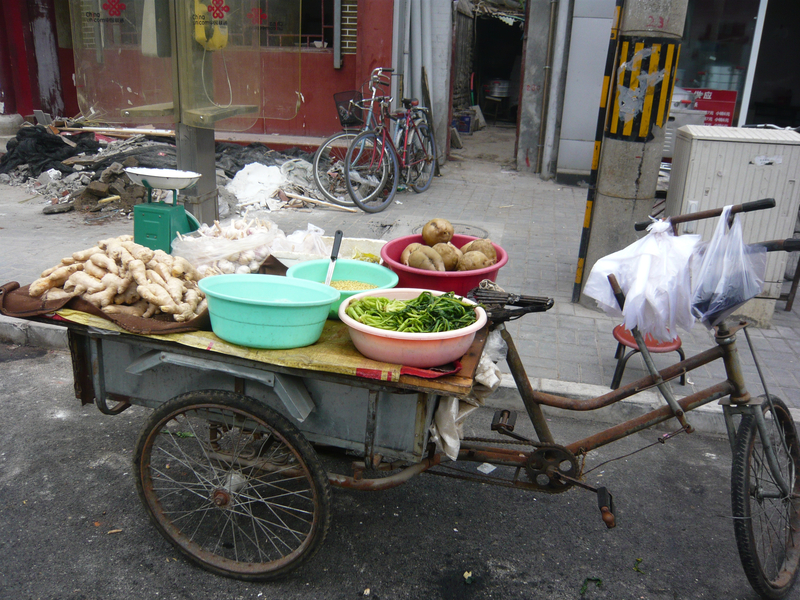 Never before had I felt so threatened when walking the streets than when I first arrived in Beijing. 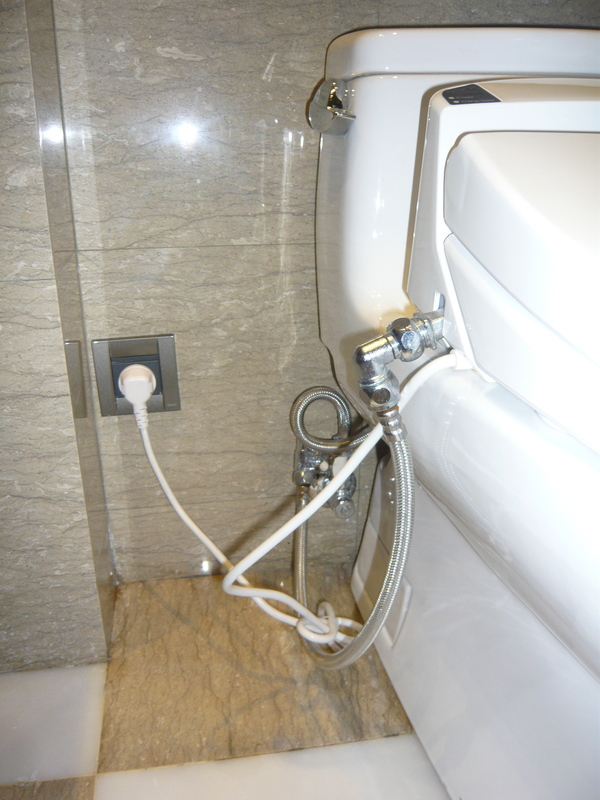 There were many close calls, especially when we first got there and were so jet lagged. Yet, after a few days we figured it out and here are the main things we discovered. 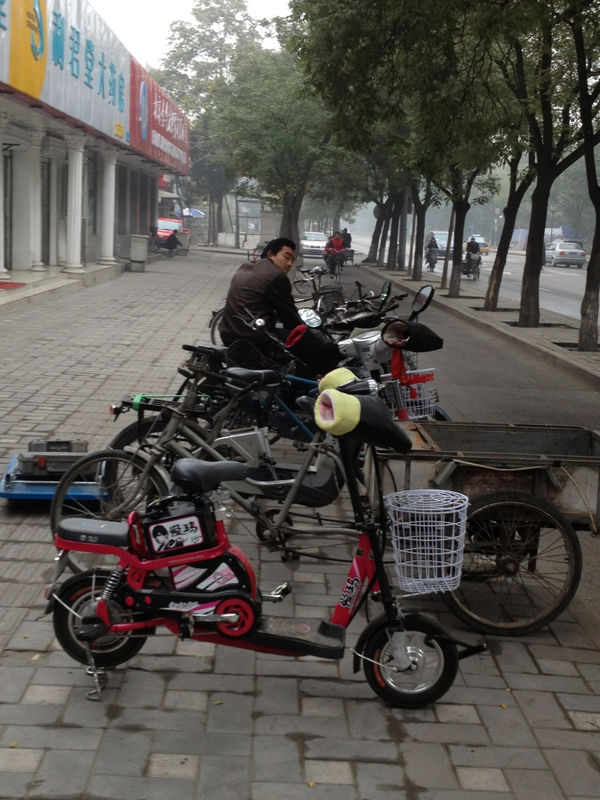 Street Survival 101: How to get around urban China without getting flattened. 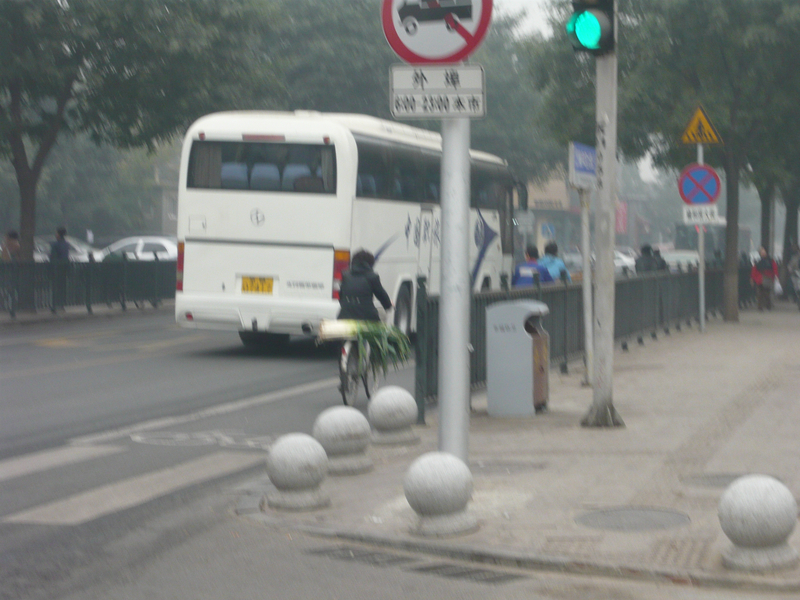 First of all, there is no regard whatsoever for the “green” walk signs. 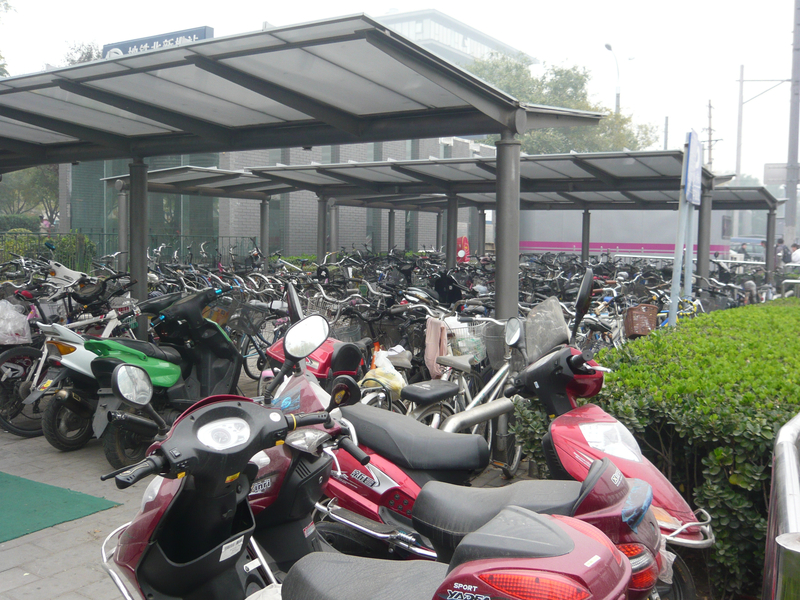 Cars, trucks, mopeds, buses, you name it, all come charging through the intersection honking their horn in warning as the pedestrians scurry across. 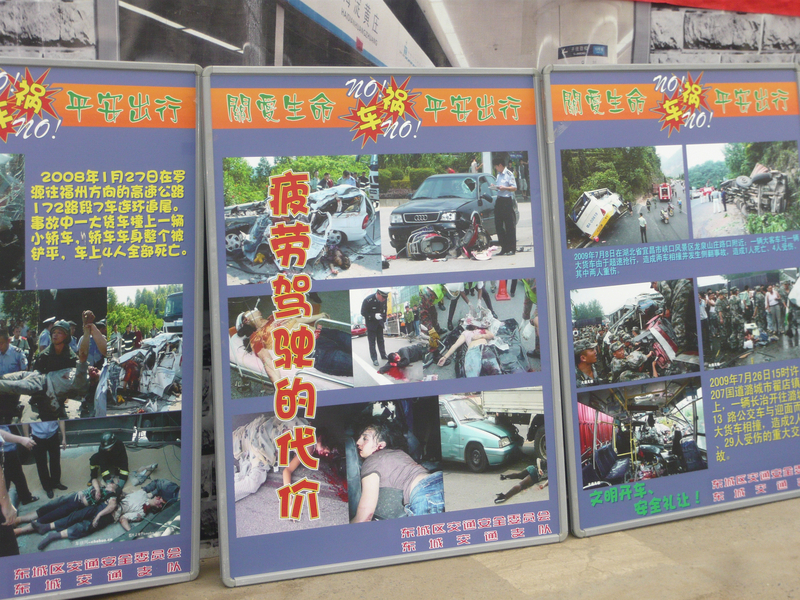 There were many times when I feared either I or someone else would be struck dead. 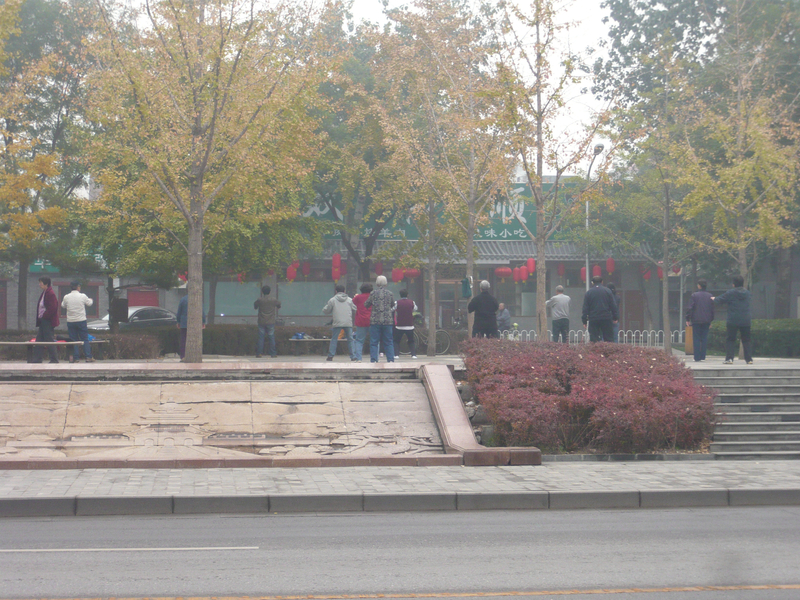 I especially got nervous when the elderly were wobbling across. There were many close calls. I probably shouldn’t have taken this photo and have been more concerned about my safety and my dad’s, yet this just shows how cars really don’t care if you are in their path. You’ve got to get out of the way fast or else, well…. 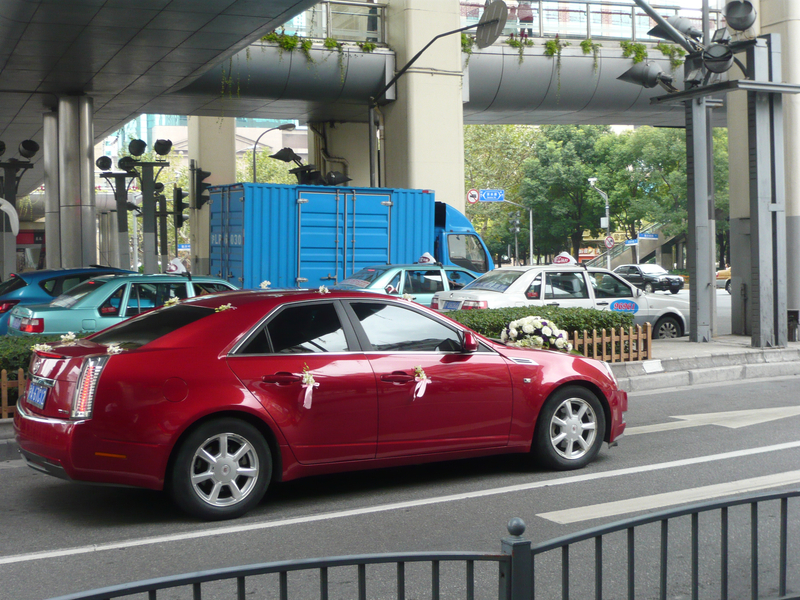 Second of all, vehicles love to run red lights. 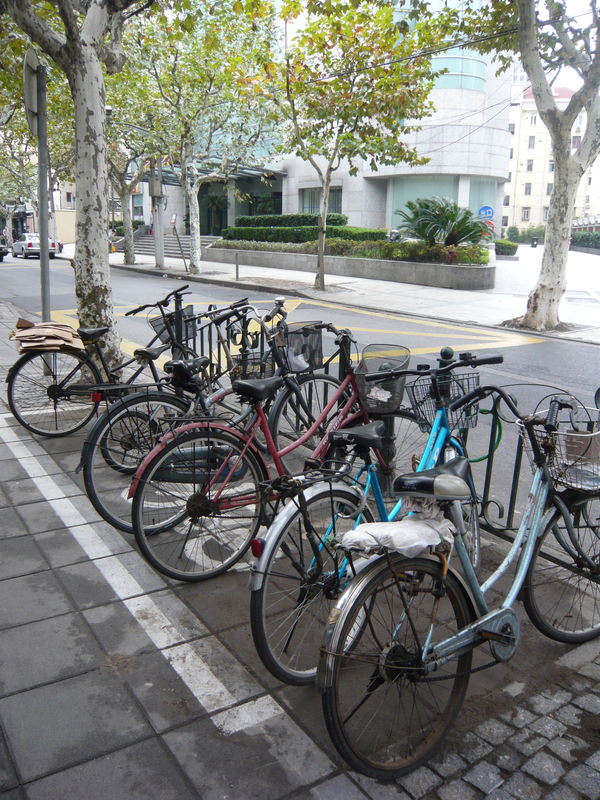 It is extremely important that before you step out into the street you look ALL ways. 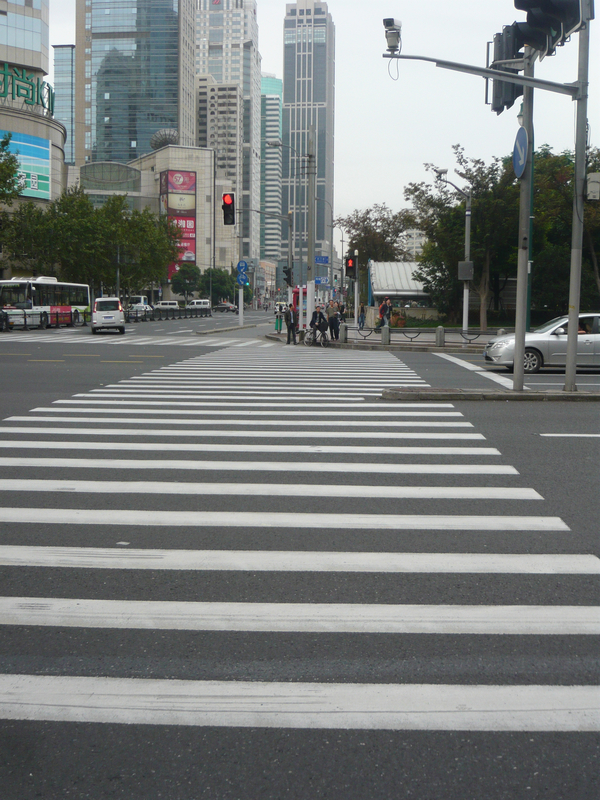 Do a 360 degree look around before moving forward no matter what color the street light or walk sign indicates. Four times out of five, there will be something coming. I found the bike lane to be the worst offender. 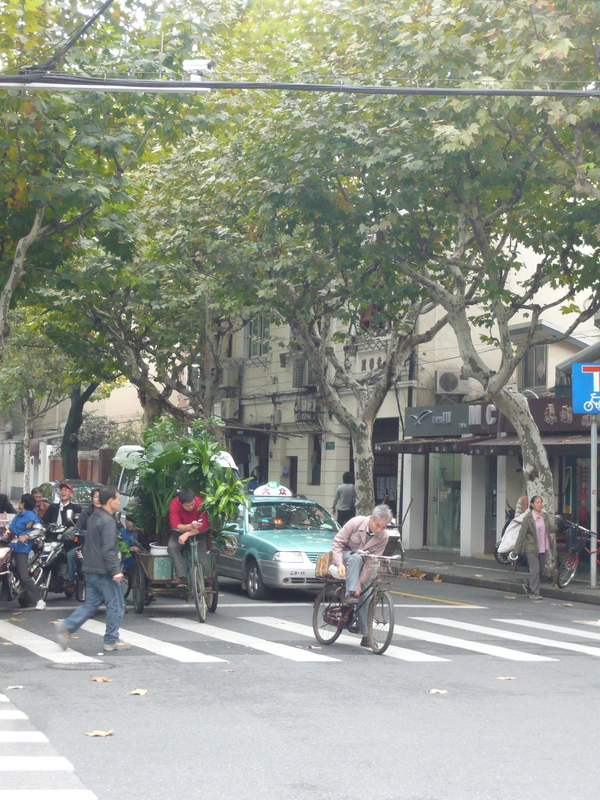 Many times bikes, mopeds, electric scooters and carts hardly stopped at all and kept going regardless of the red light. 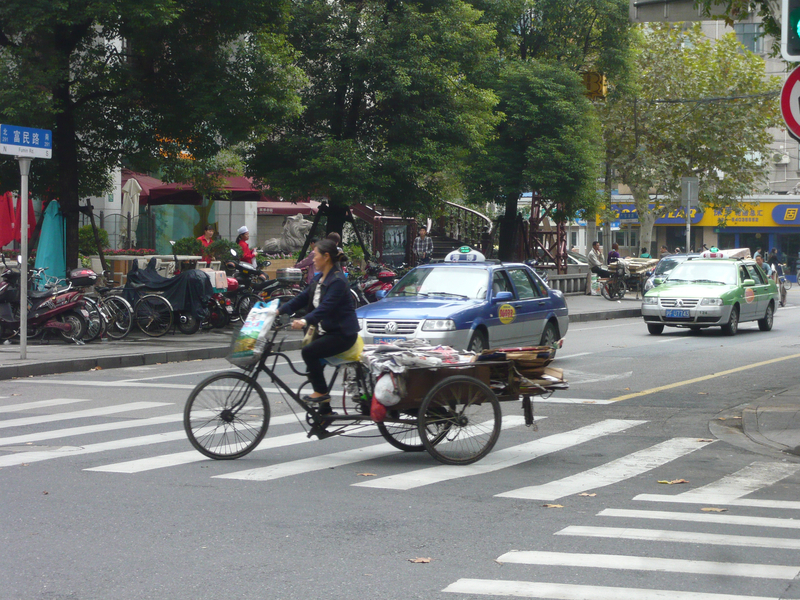 Intersections in China can be a free for all—cars, bikes, motorcycles, trucks and people included! Beware! Third of all, whenever you cross a street you just have to keep looking and do your best to get safely across as fast as possible. Vehicles can come out of nowhere and of course they won’t slow down or stop if you are in its path. 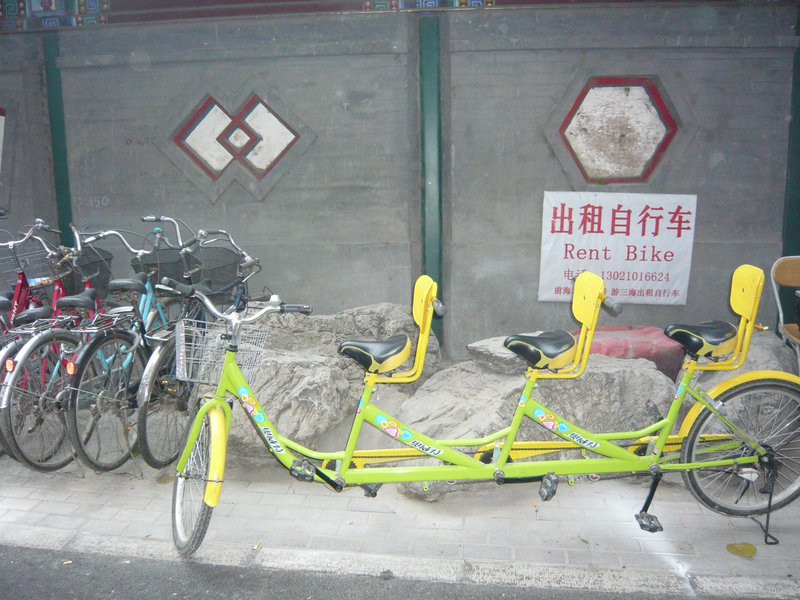 Getting around is a free for all. 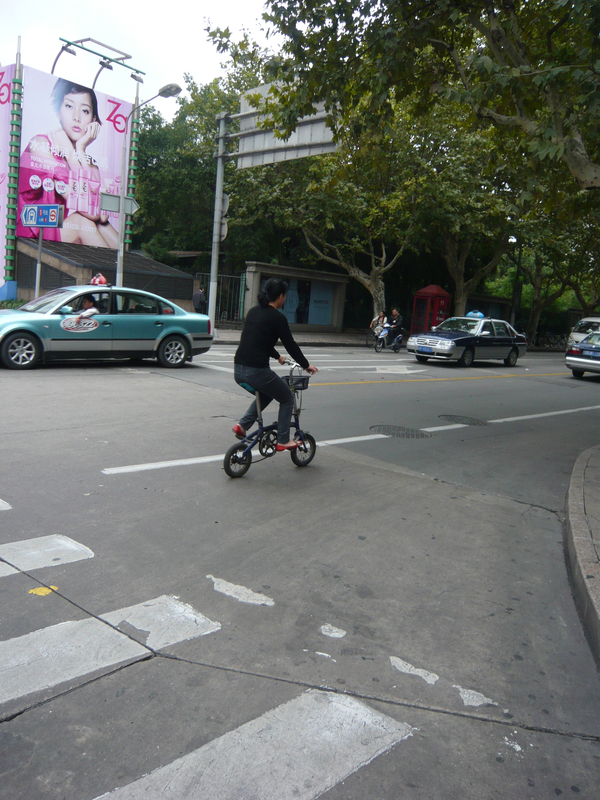 I witnessed many “almost accidents” such as this one between the bicyclist and the moped. 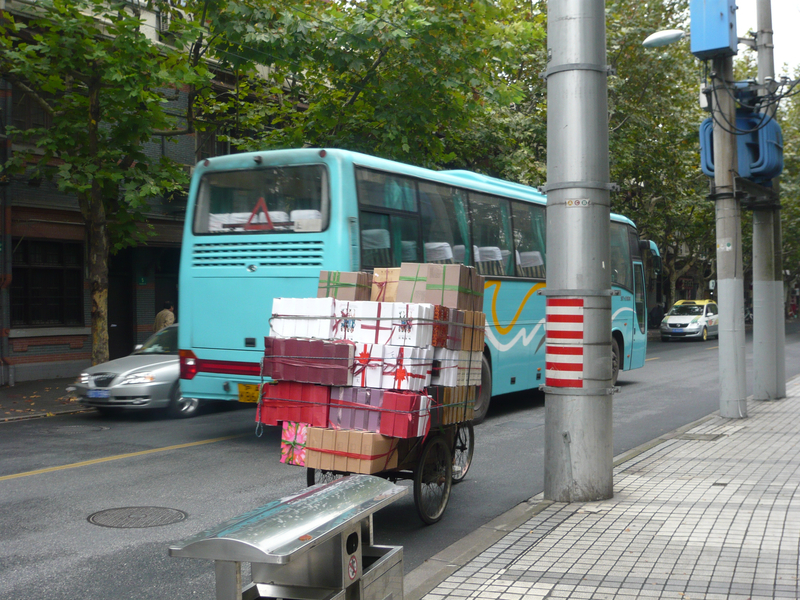 Finally, just because you are walking on a sidewalk does not mean you are safe. 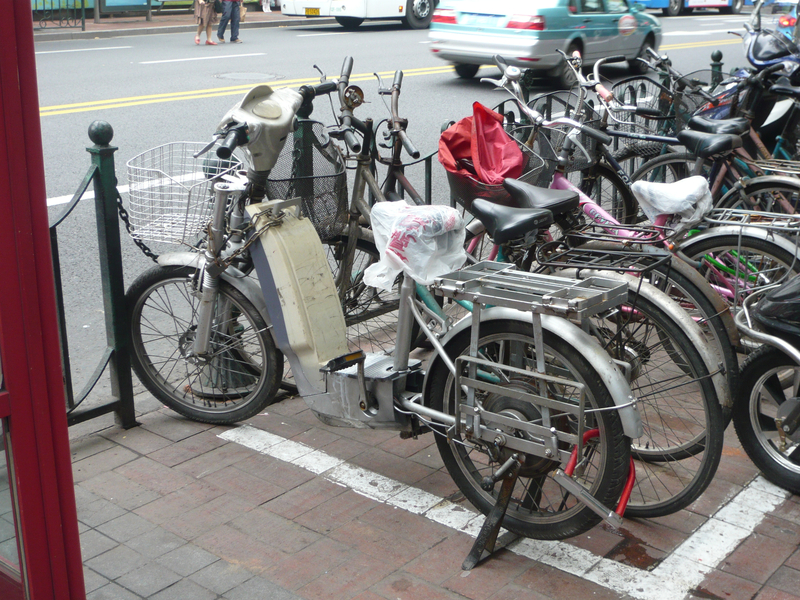 I’ve seen motorcycles, bicycles and even small cars driving either behind or right at you on the sidewalk. It would really hurt to get your foot run over! 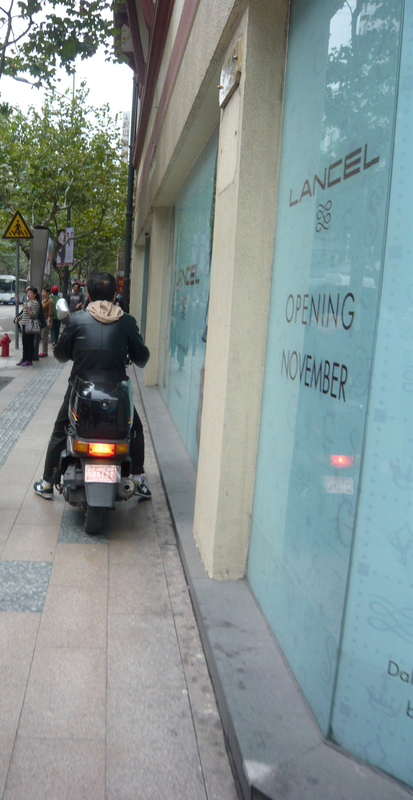 This guy passed me from behind…thankfully the sidewalk wasn’t too crowded. 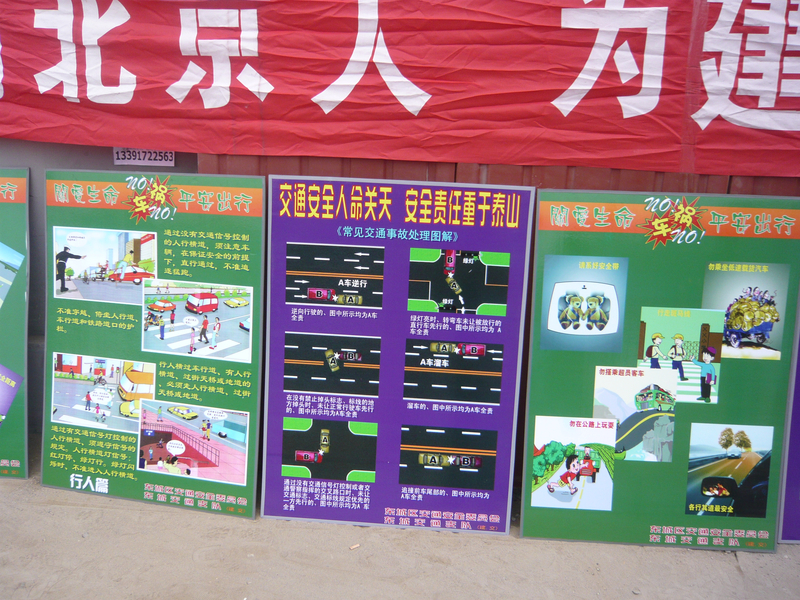 The good news is that the Chinese are aware of the dangers of crossing the street and have done some things to make it safer for pedestrians. 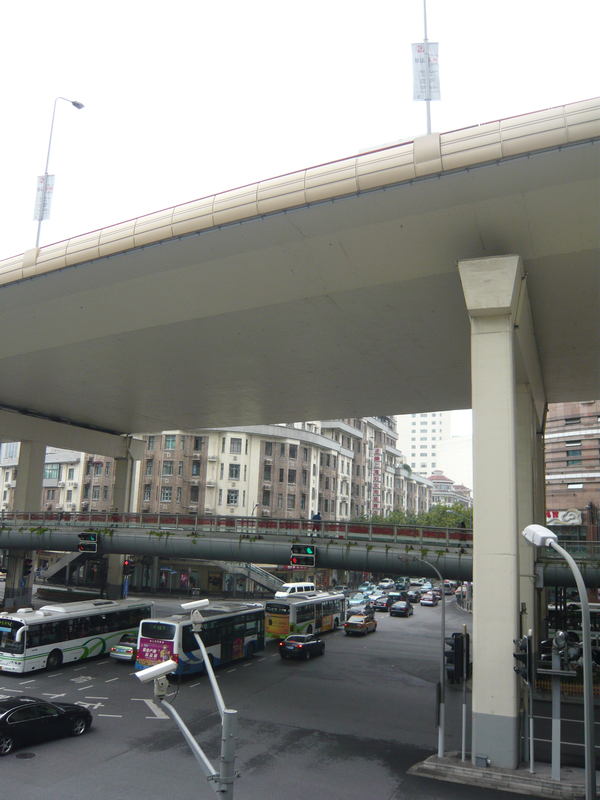 In Shanghai, one of the most difficult places to cross the street, I found huge above ground walkways over some of the major intersections such as this one (Note: In Beijing, these above ground sidewalks did not exist and I sure wish they had! 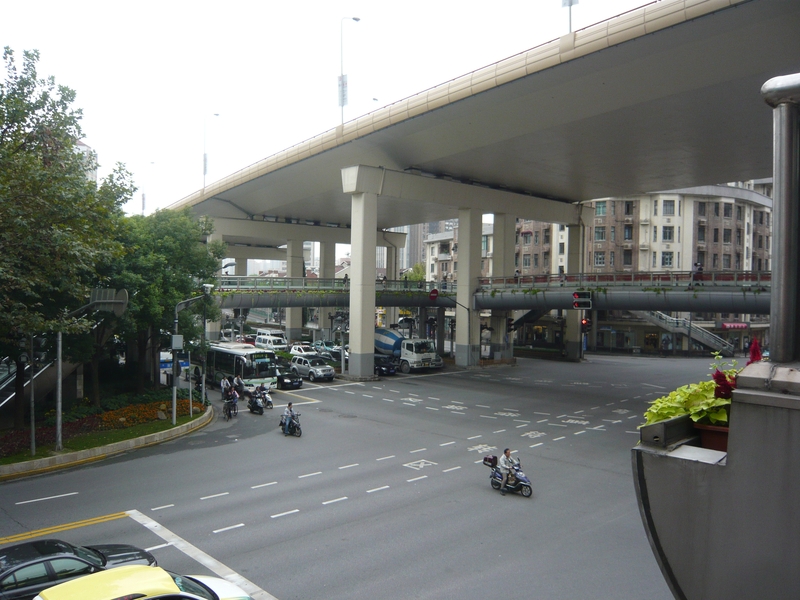 It was insane trying to cross some of the busy intersections there and I’m happy that there were no incidents!). 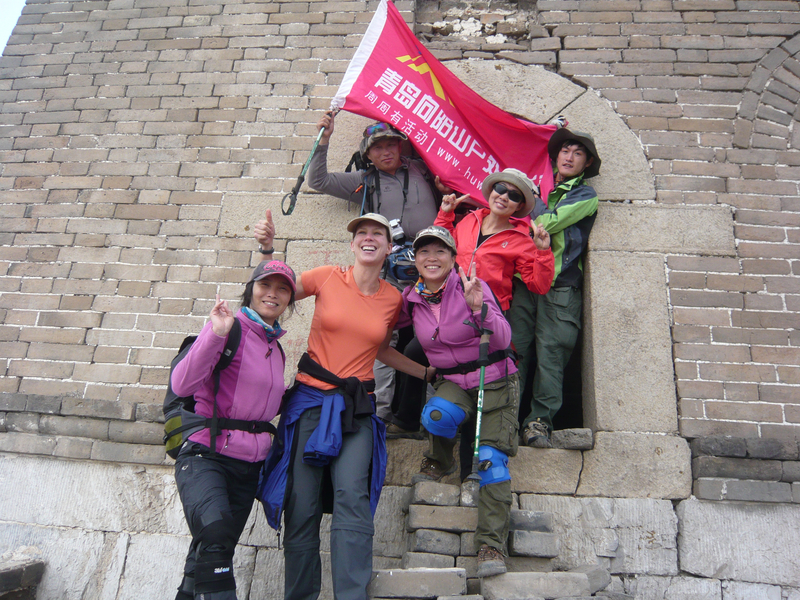 Climbing up out of harms way (thank you, Chinese Government!). I am much happier here than there down below! 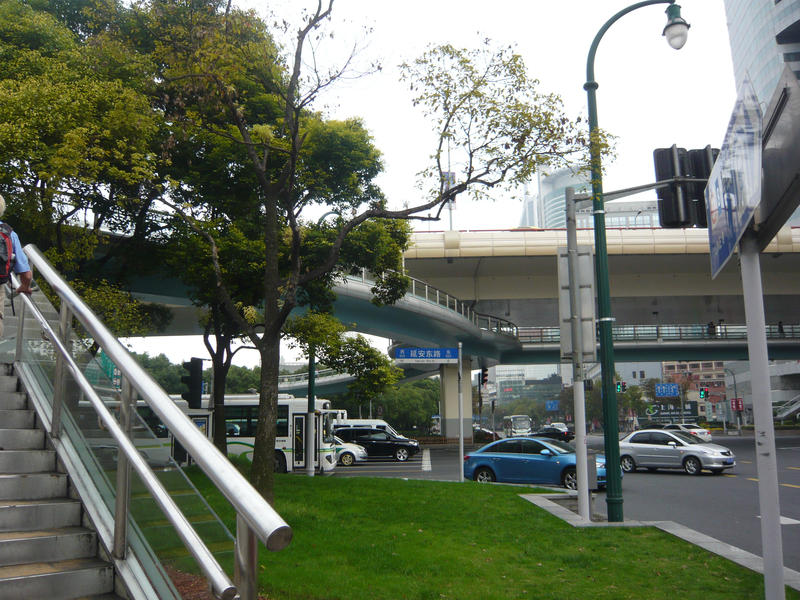 When Shanghai built this new highway a few years back, it was a welcome gift not only to the drivers but also to the walkers who received the above ground sidewalks. 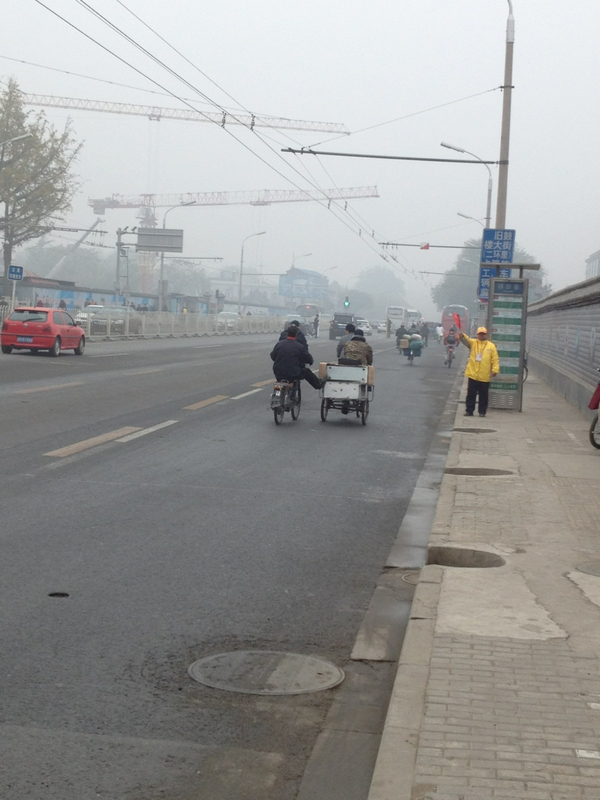 Because it sure beats trying to walk down there and be battling against that line of traffic. 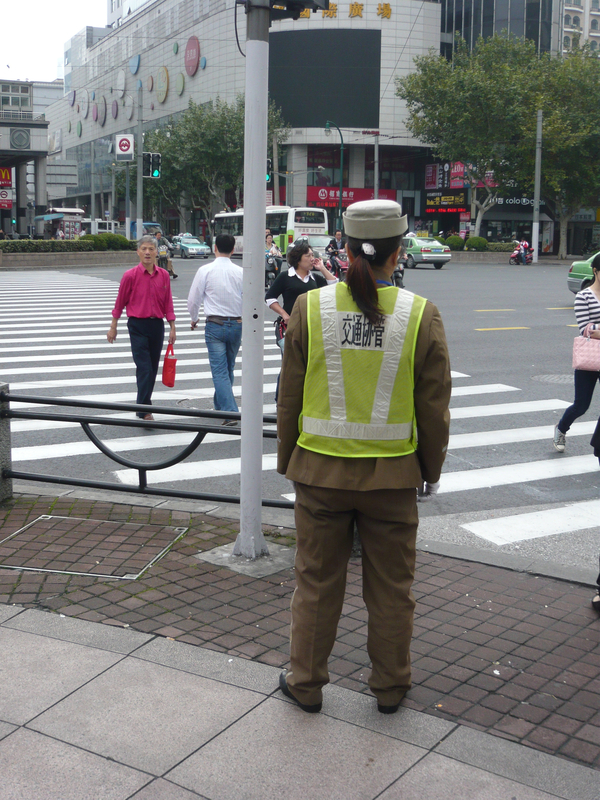 Shanghai also adopted the use of crossing guards on some of the busy streets near the high-end French Concession. 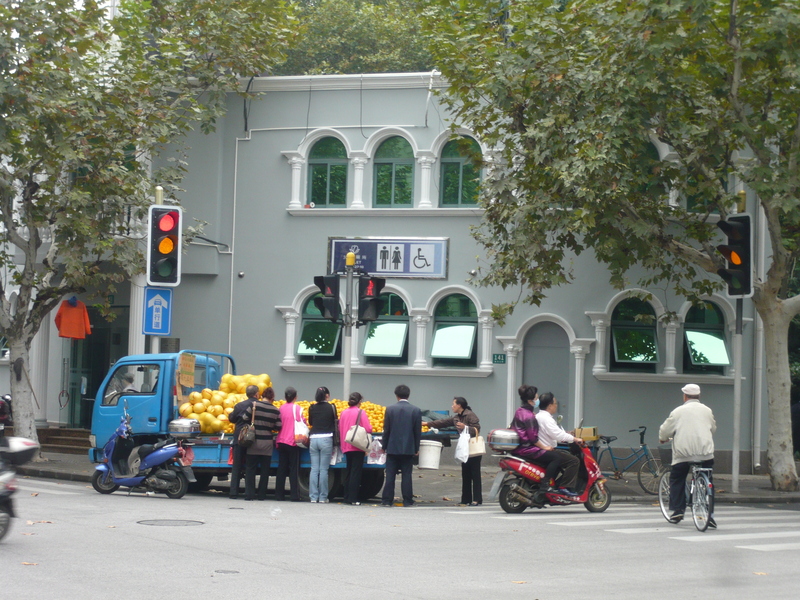 I had never seen these in other highly congested parts of Shanghai and certainly not in Beijing, which is notorious for having extremely dangerous crosswalks. Finally there was some help for the pedestrians! The crossing guard even blew here whistle loudly at aggressive drivers and stopped them from driving through the green walk signs. Phew! 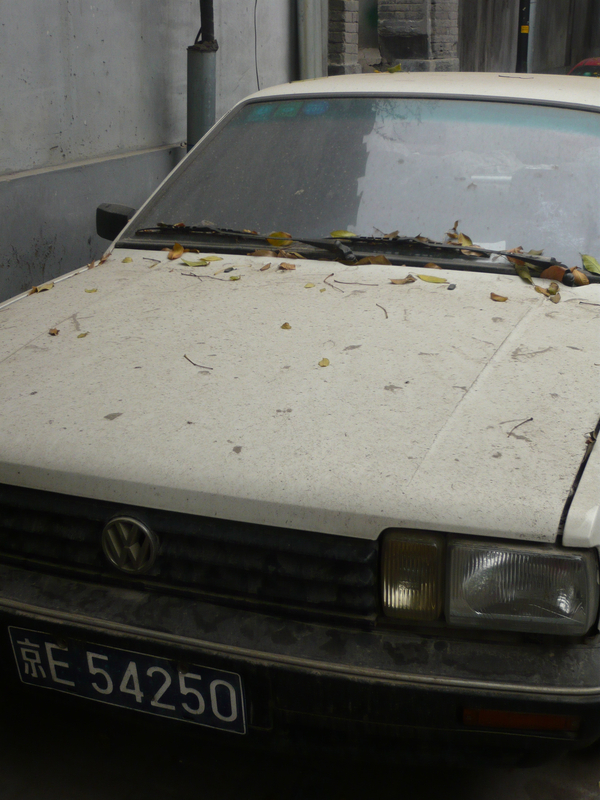 Rest assured….after a few days of walking like a local you’ll be fine! 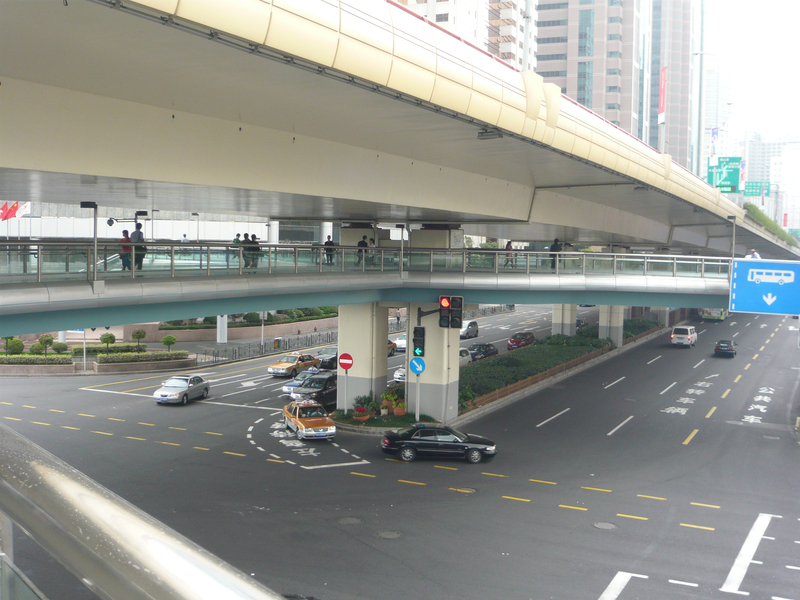 You will learn how to zigzag across traffic at extreme speed and expertise. You’ll remember to take a 360 degree look before stepping out into the street. And most of all, you’ll appreciate your streets back at home even more! 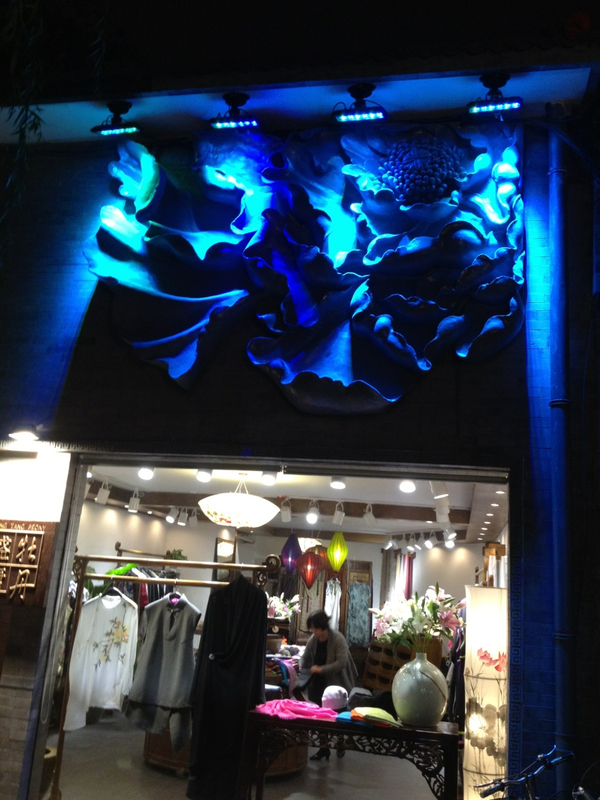 Stay tuned…more China coming soon! Thanks for reading and comments are always welcome and appreciated! 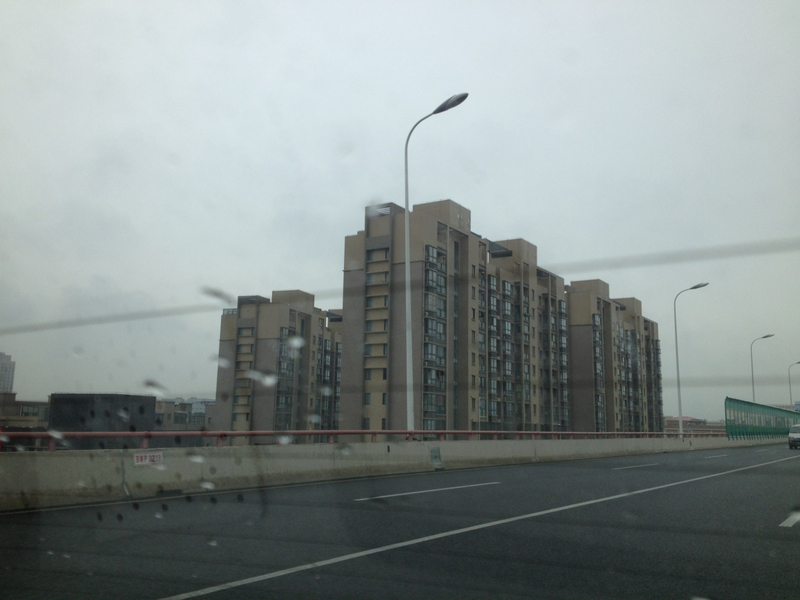 Leaving Beijing, we had our first taste of heavy traffic and wet rain. 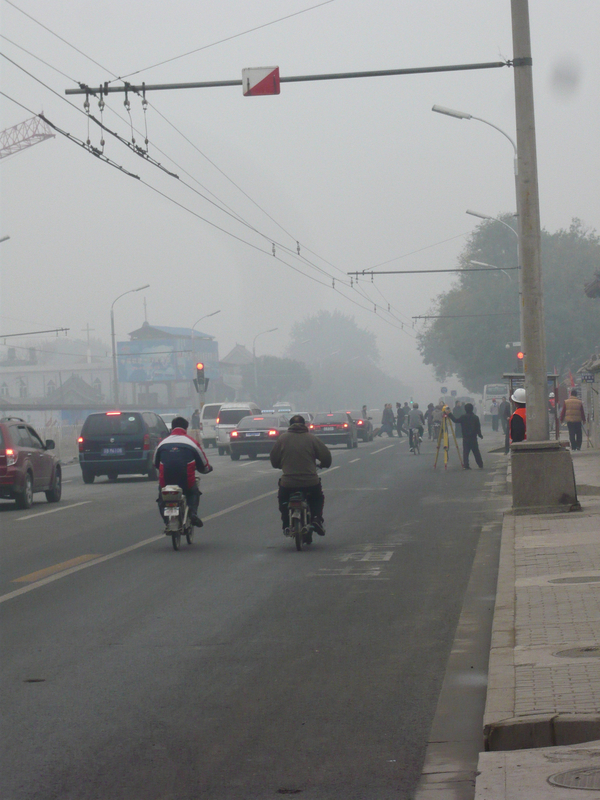 We were ready to leave the dreary weather (or so we hoped) and head south to Shanghai known as Beijing’s decadent little sister. 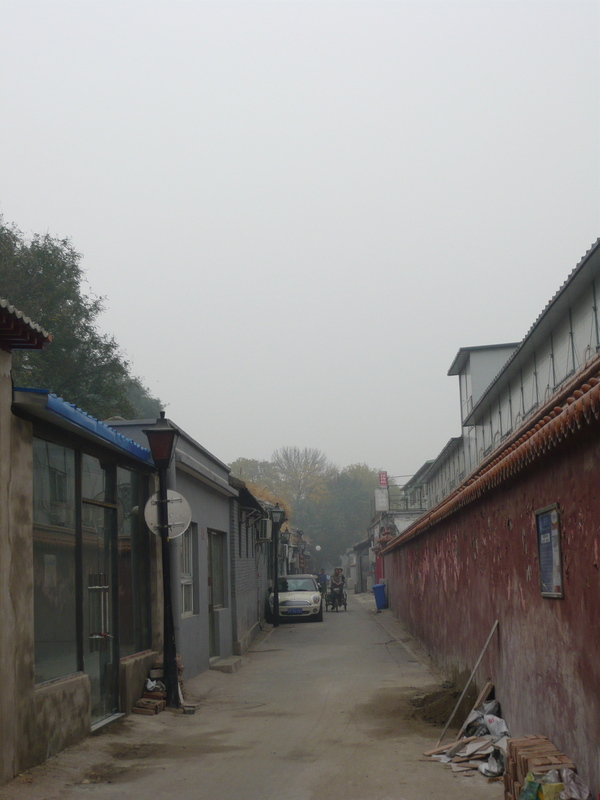 Although I truly enjoyed Beijing’s majestic Forbidden City, ancient hutongs and scattered parks, I really was getting tired of the smoggy, cold weather. 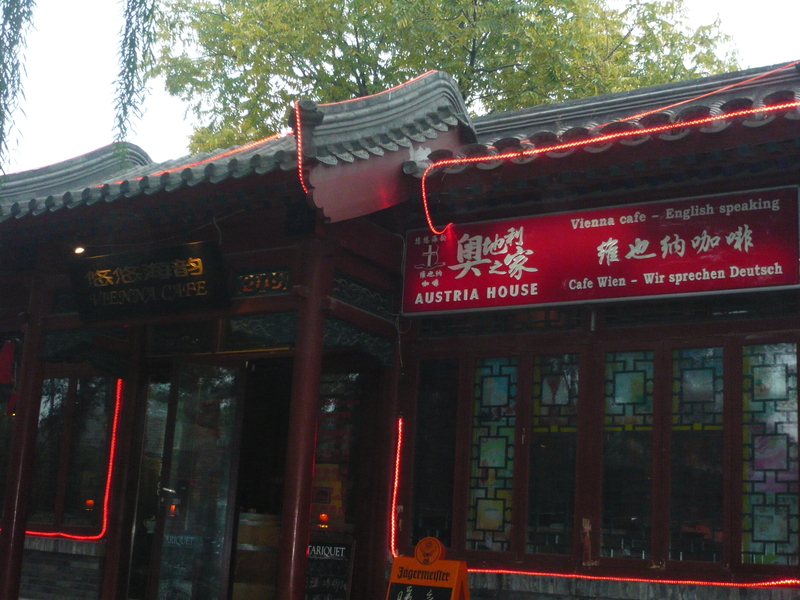 Plus the food options were becoming limiting (that happens when you don’t especially like Chinese food) and I knew that I would find much more variety and international fare in cosmopolitan Shanghai. It was time to leave. 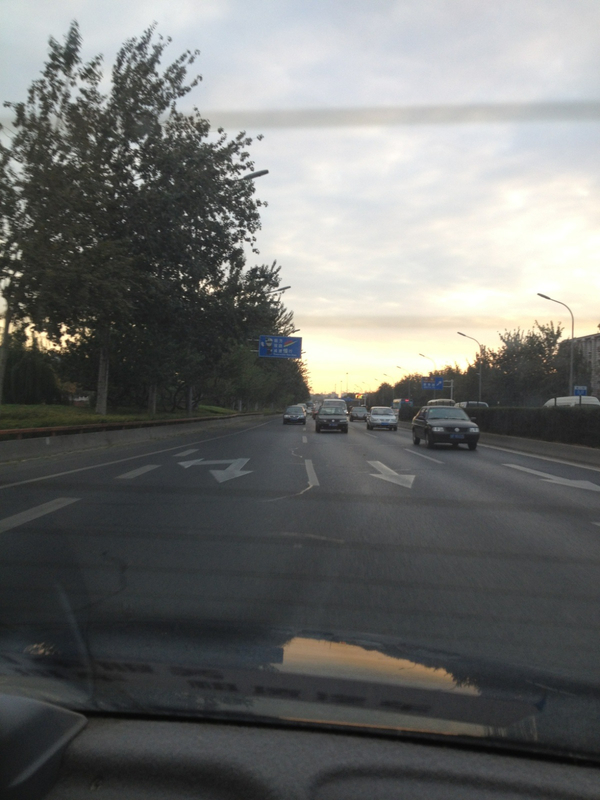 Photo below taken during our hour-long taxi ride to Beijing South Railway Station. 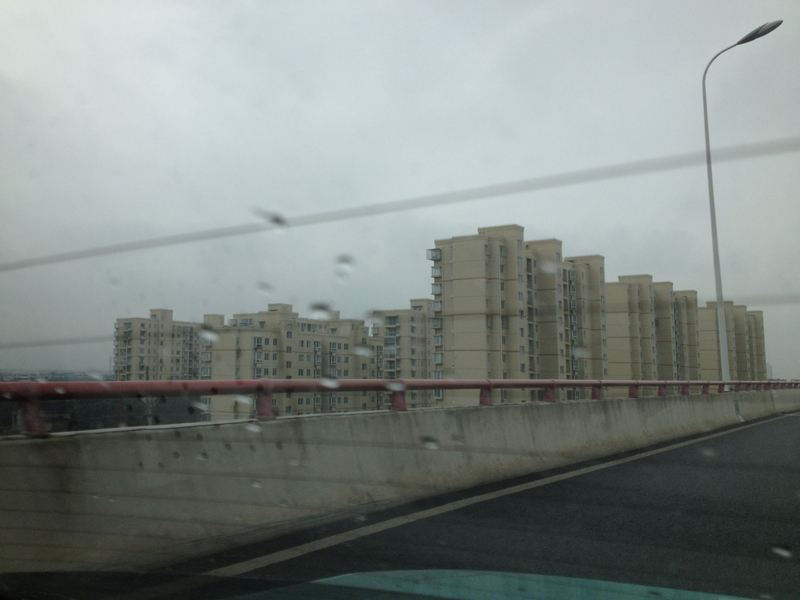 The further we got out off town and along the Ring Road, the more of these ugly Soviet-era apartment complexes there were. 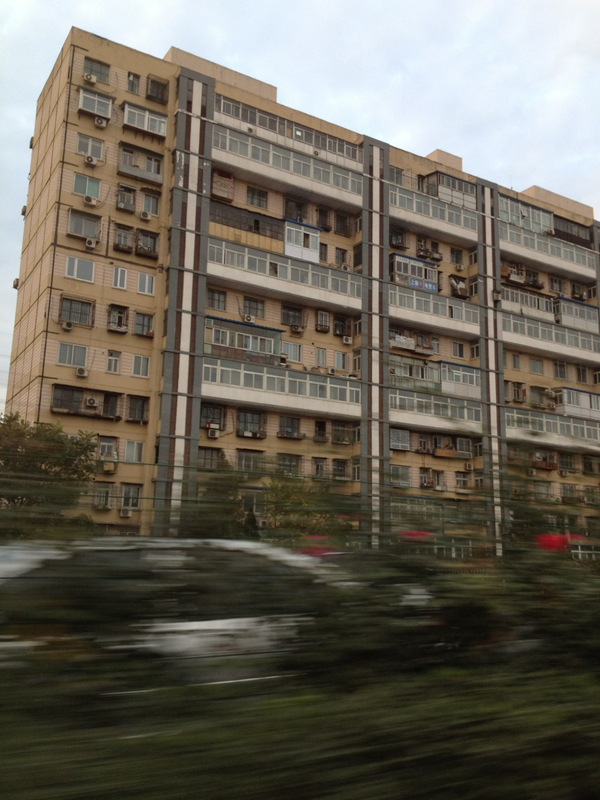 It made me realize just how insanely big Beijing is and how densely the people live. 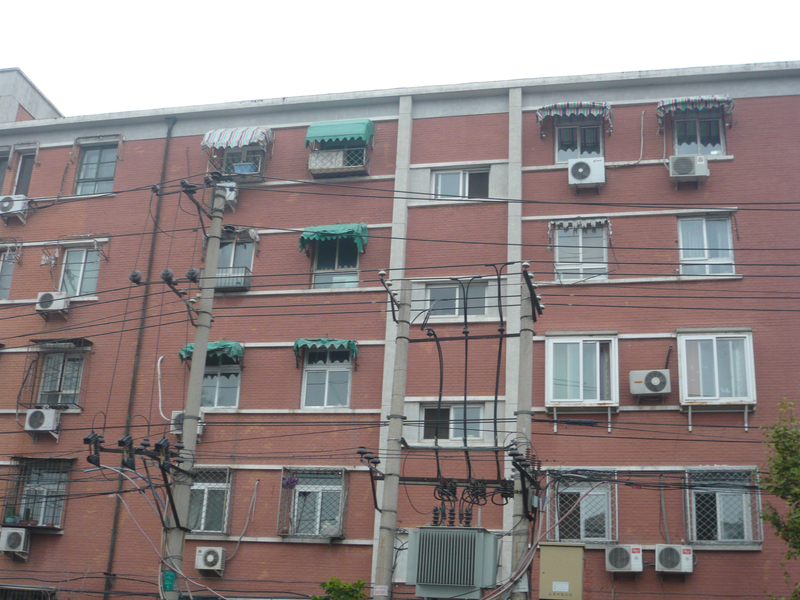 This represents one of hundreds if not thousands of these kinds of living complexes. 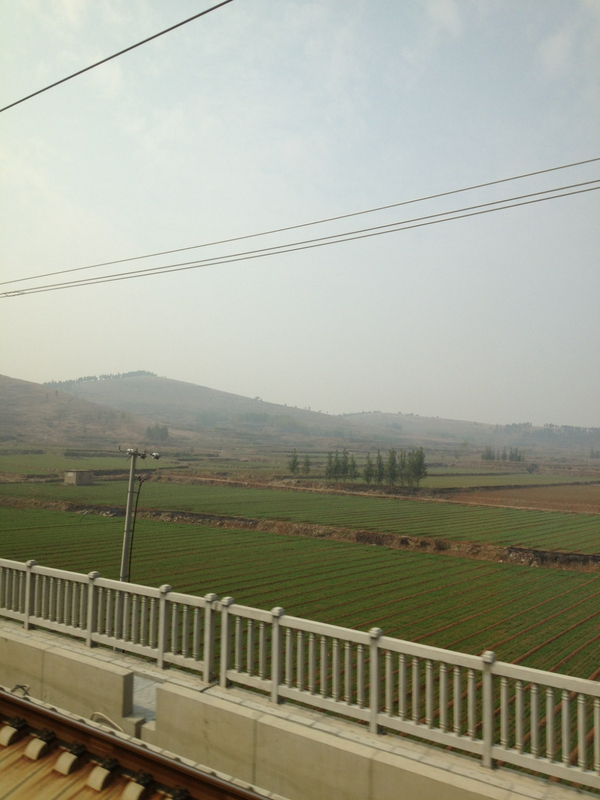 In my opinion, there is no better way to see some of the countryside and what is really going on in China than to travel by train. There is something nostalgic about train travel. 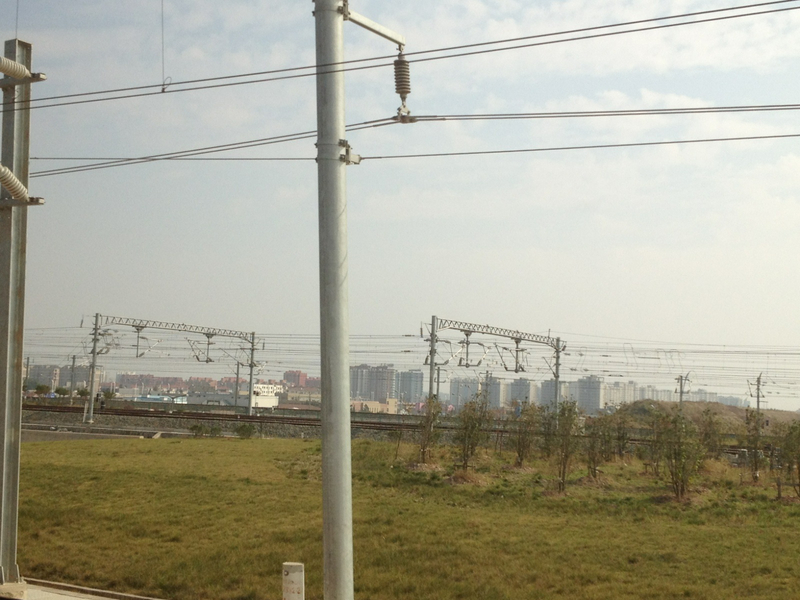 You can sit back, relax and watch the world go by or in the case of China’s high-speed G trains, watch the world scream by. 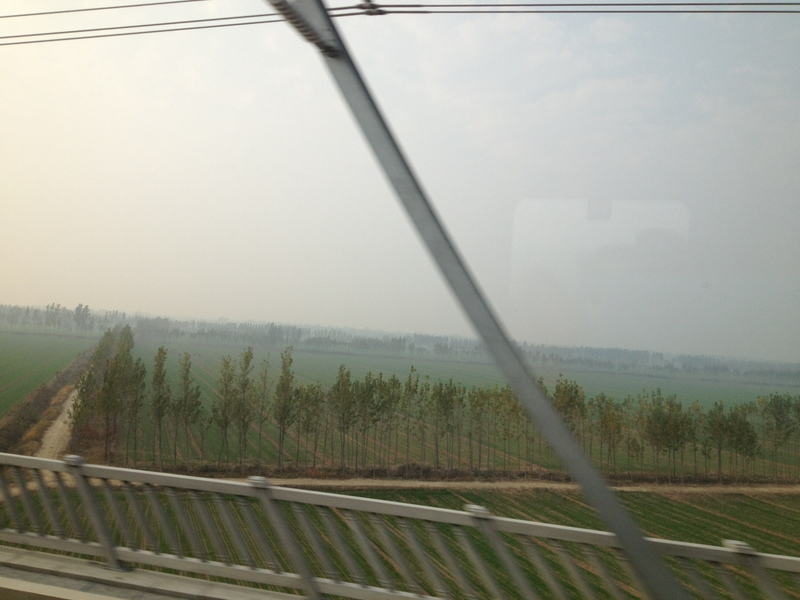 The Beijing-Shanghai G Train is one of the longest and highest quality high-speed railways in the world with a designed speed of 350 km per hour. 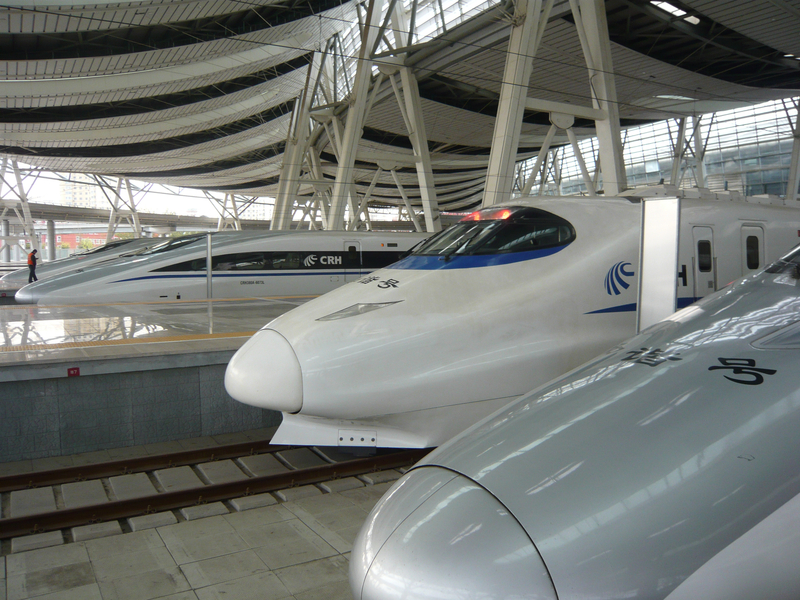 It makes the 1,318 km/819 mile long journey between Beijing and Shanghai take a mere 4 hours and 48 minutes with a brief stop at Nanjing. 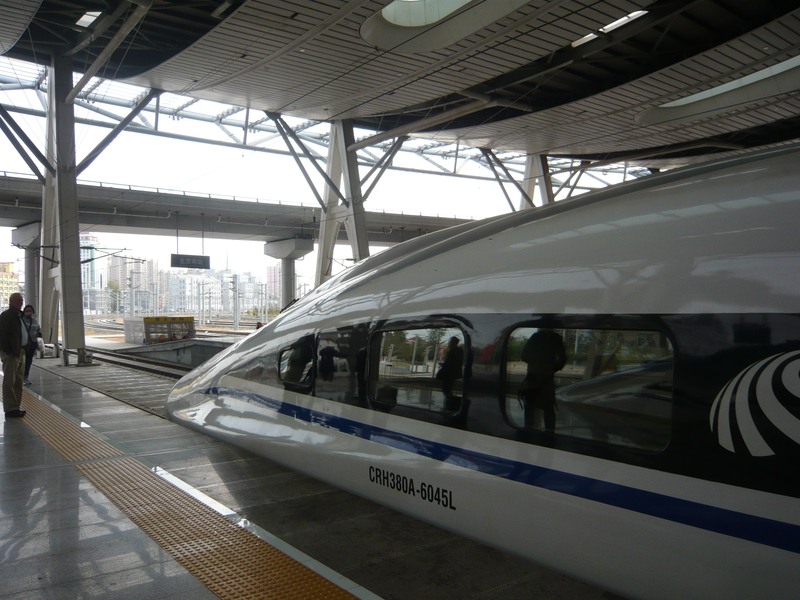 Launched in June of 2011, the railway was the first one designed for speeds up to 380 km/hour (236 miles/hour), making it the fastest train in the world. 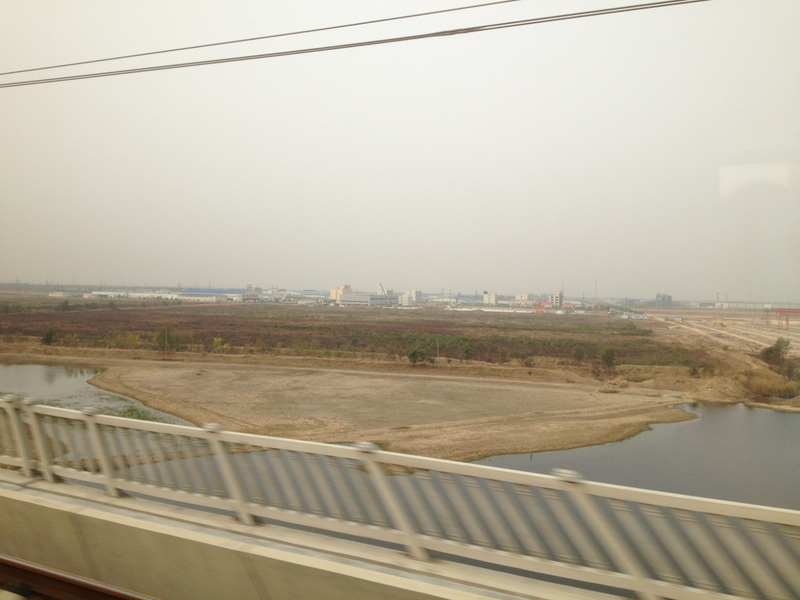 The journey from Beijing to Shanghai took 3 hours and 58 minutes compared to 9 hours and 49 minutes on parallel railways with conventional trains. However, after a few mishaps shortly after its launch, the train was slowed down to its current rate averaging 300 km per hour/186 miles per hour. 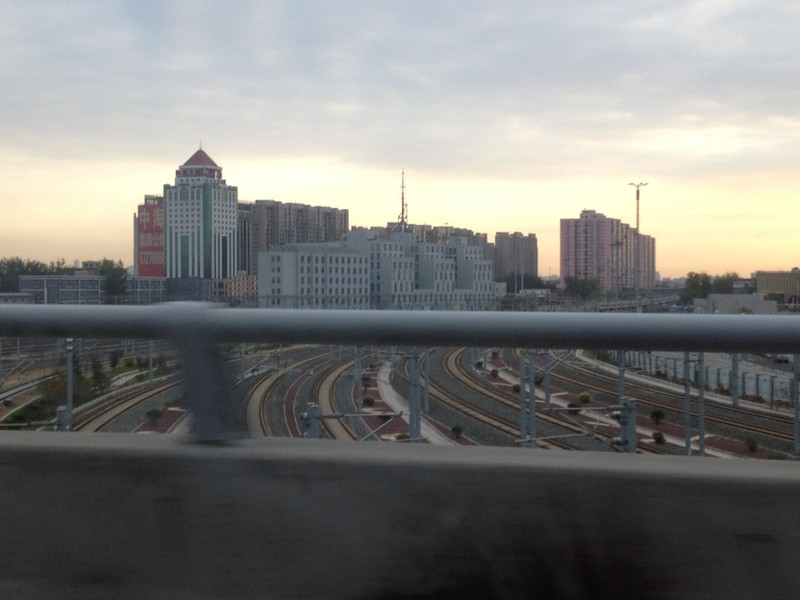 Photo below: Pulling up into the Beijing train station I am amazed by its modernity and vastness. There are railways everywhere. 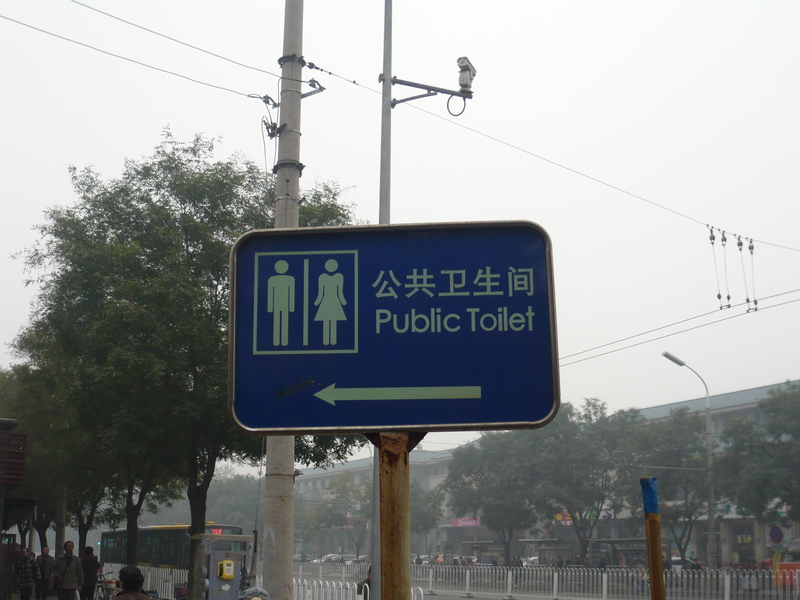 Entering Beijing’s train station which is extremely modern (except for the bathrooms: Squat toilets of course). Security was tight and the place was packed. An up close look at a G Train. Impressive! There are rows and rows of G Trains waiting for its passengers to board. Each train has a “sightseeing” class with only four luxurious seats, one section of first-class seats (with about twenty-four seats) and 16 trains of regular coach seats. 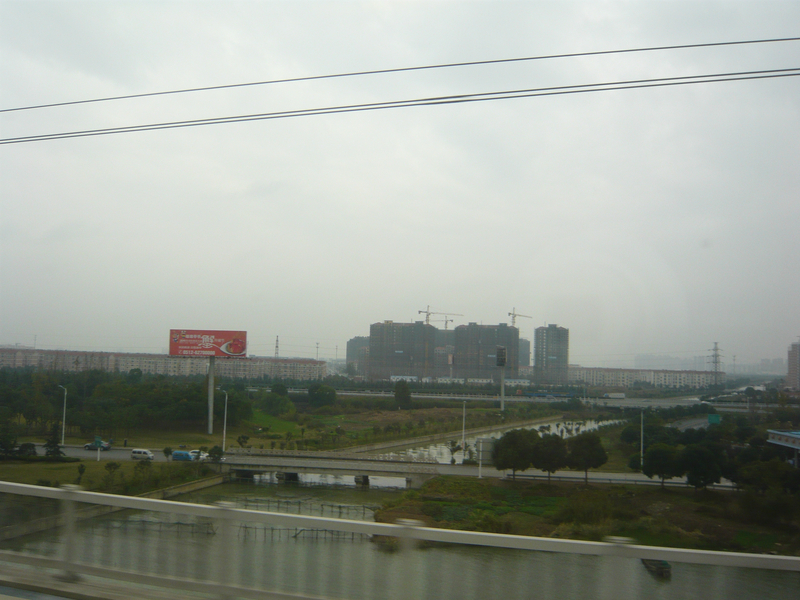 Leaving Beijing there are tons of buildings in the midst of construction. 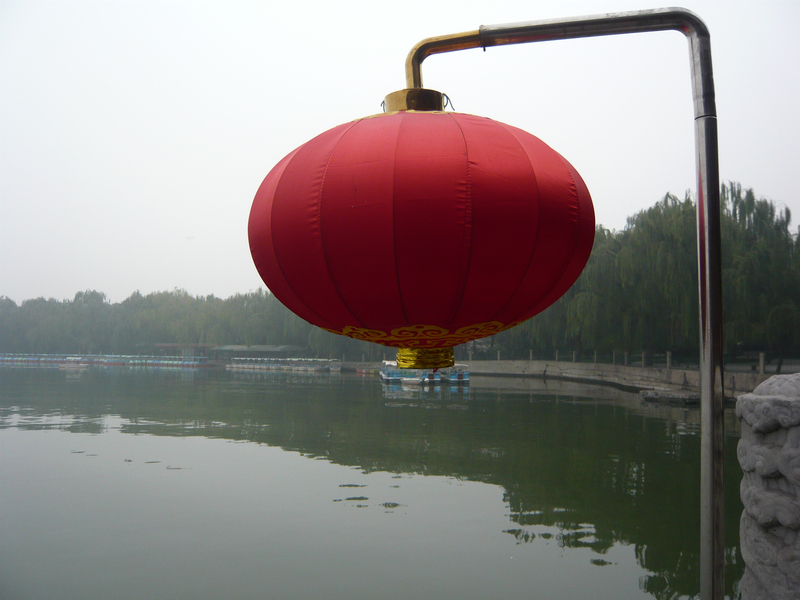 We made a joke that the national bird of China is the “Crane”. 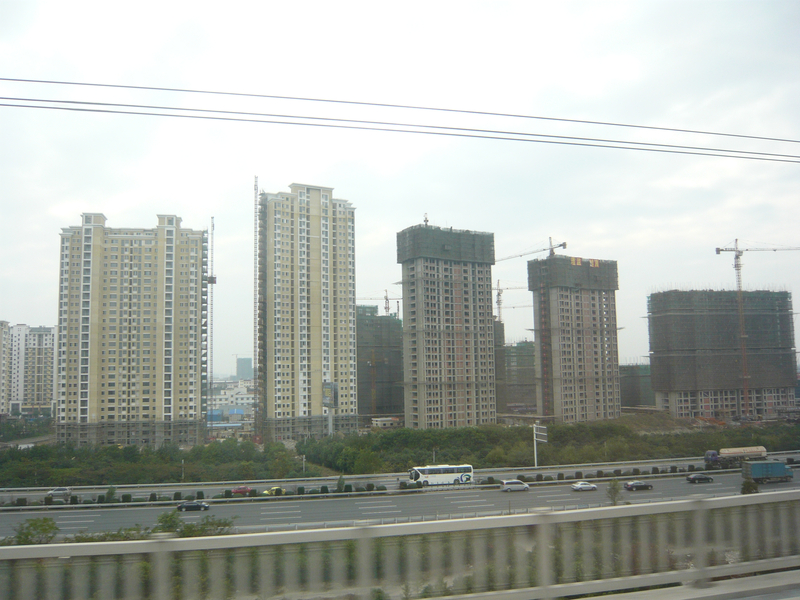 Per GMO (9/2011), “over 200 skyscrapers are under construction in China today. This is equivalent to the total number of skyscrapers in the U.S. today”. 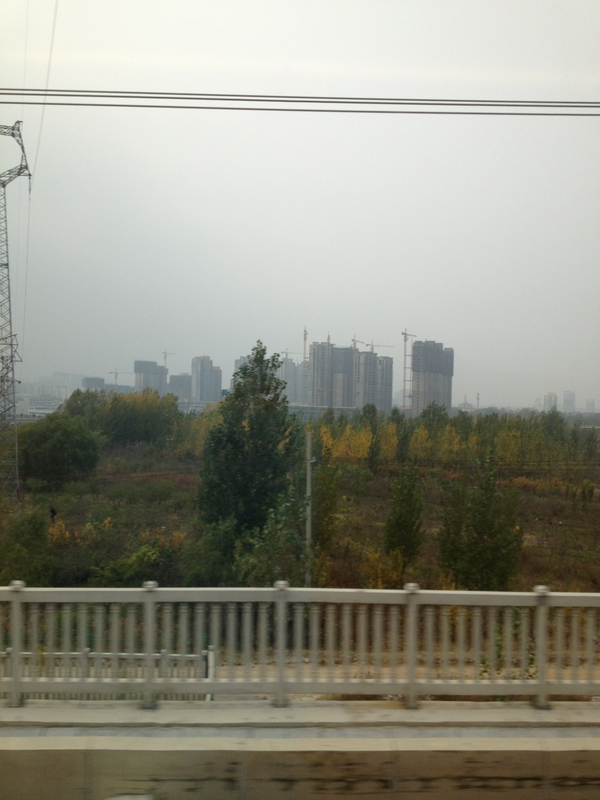 As the train slowly rolls out of Beijing, passing by one new building conglomerate after the other, it becomes evident what is really going on in China. 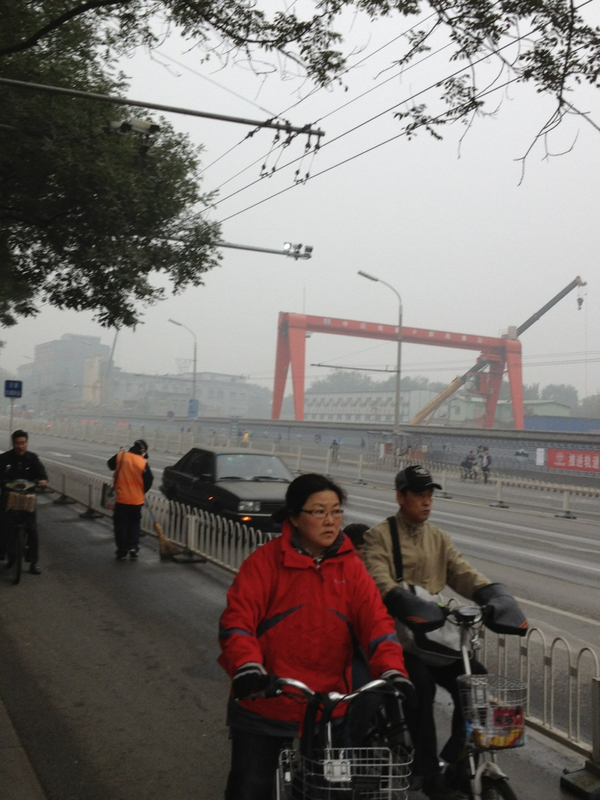 “A giant smog of unreality hangs over Chinese property. 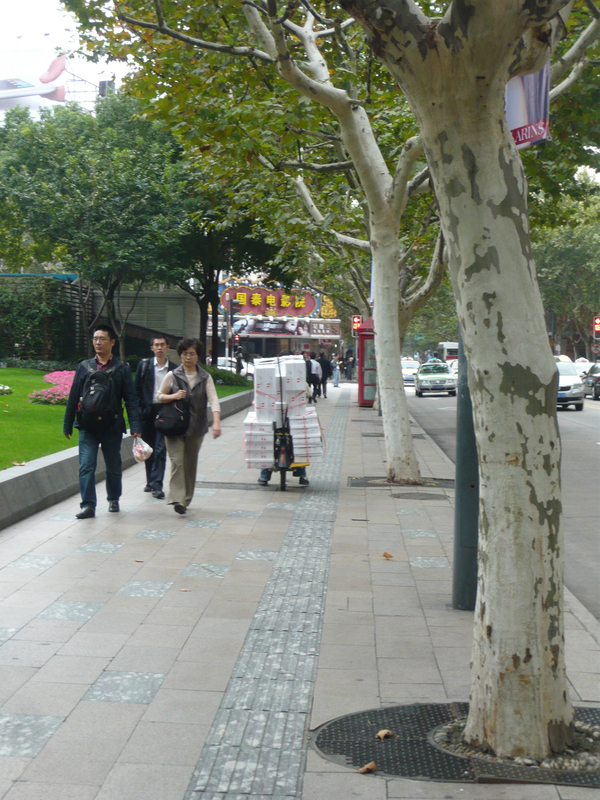 SocGen calculates that over the last decade, China has completed 16 billion square meters of floor space. This is equivalent to building Rome every two weeks” (SocGen, June 23, 2011)”. 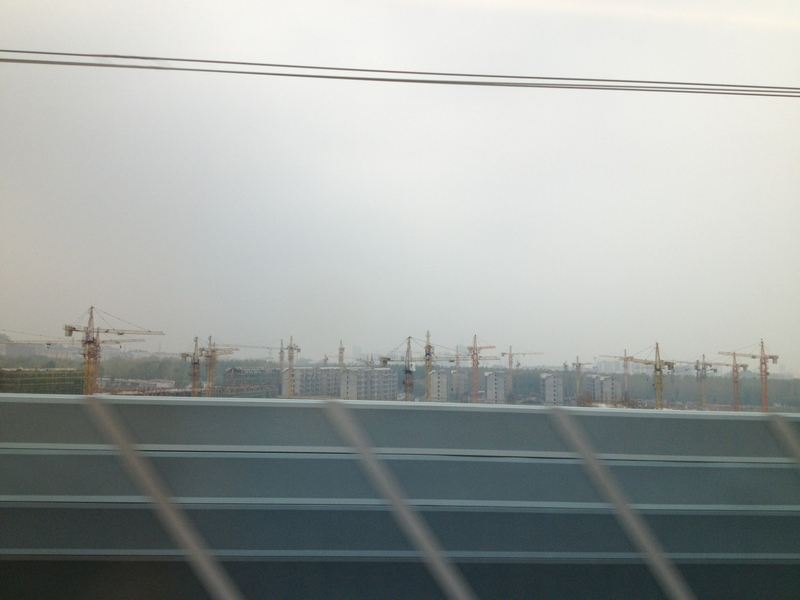 As we would soon witness during our five hour train ride, this construction boom has resulted in vast “Ghost cities” across China in which there are no inhabitants and the cranes cease to be working. 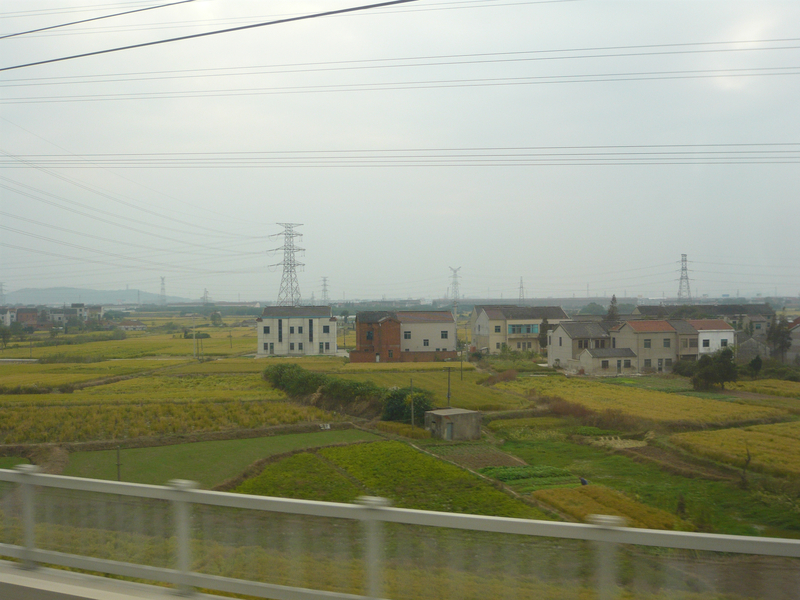 The China National Bureau of Statistics and GMO estimate that there will be up to 75 million new homes built this year. 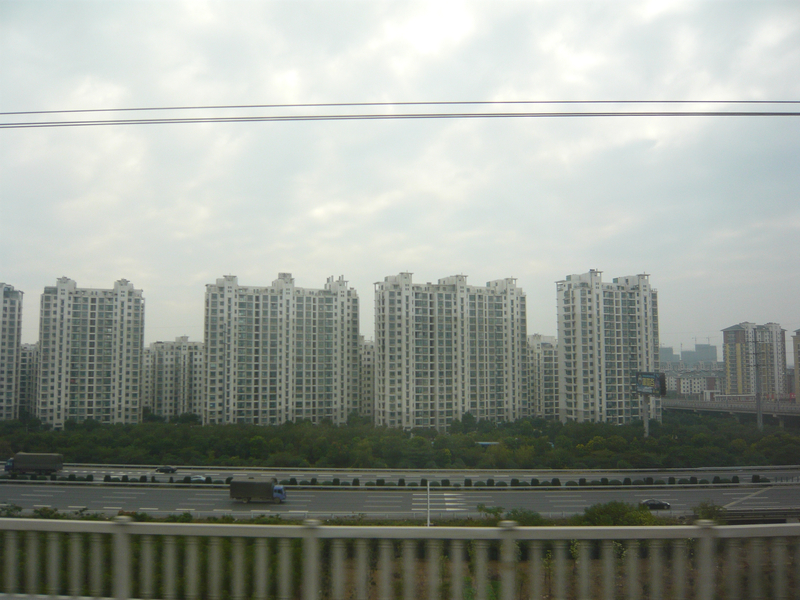 “After a decade of soaring prices, signs are that the world’s most populous nation faces its first real estate crash. 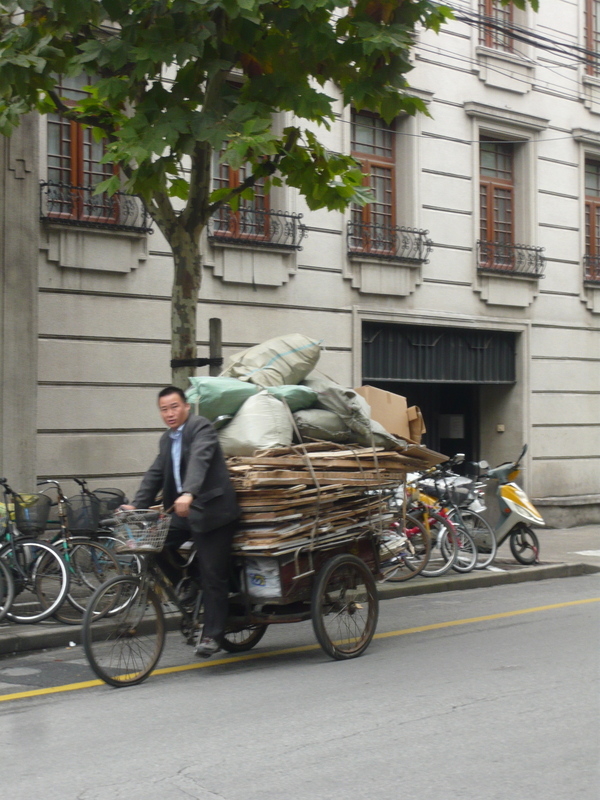 That would be dire for other countries that rely on China to fuel their own economic growth”. 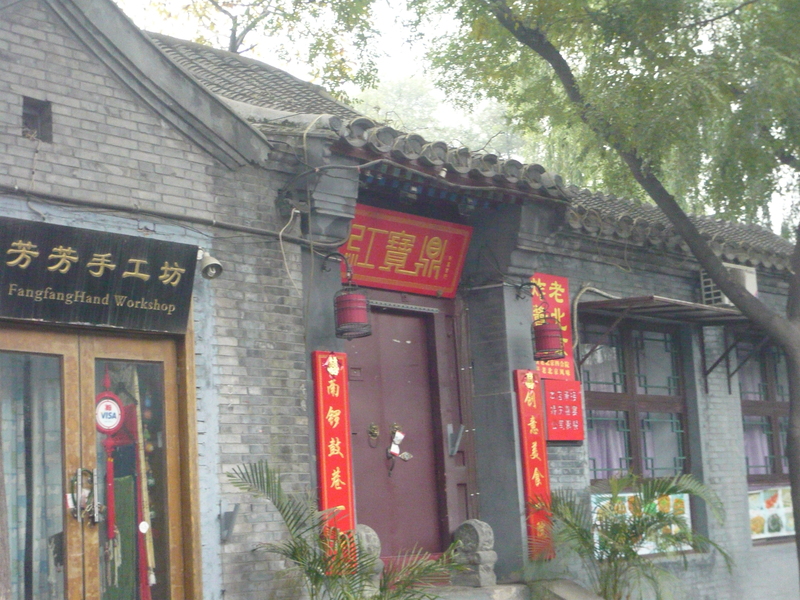 Home prices in Beijing have risen by about 150 percent in the past four years. 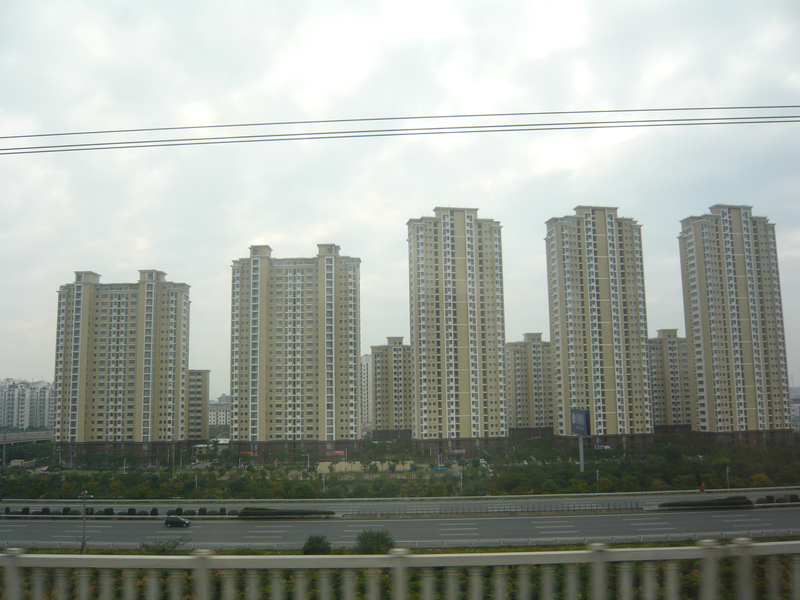 Residential transactions are down 11.6 percent from last year, all across China. 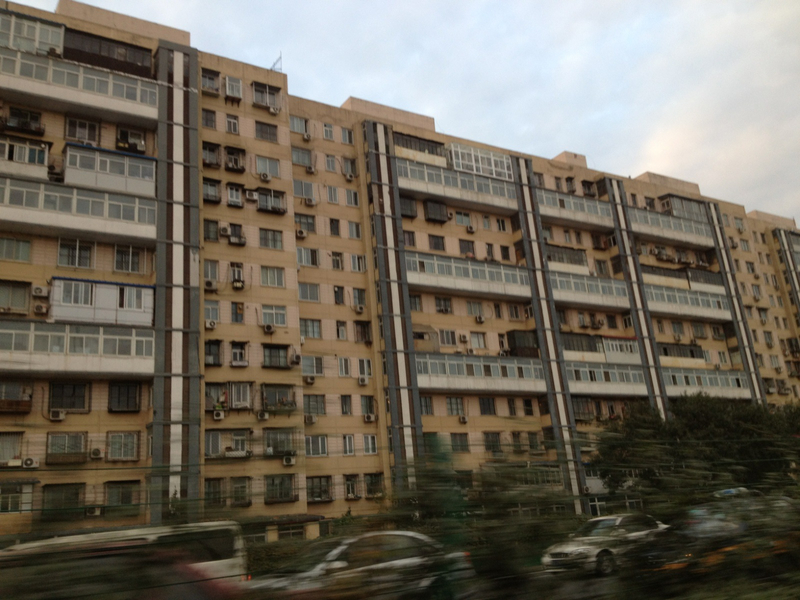 Analysts say an urban apartment costs 8-10 times the average annual income nationwide. 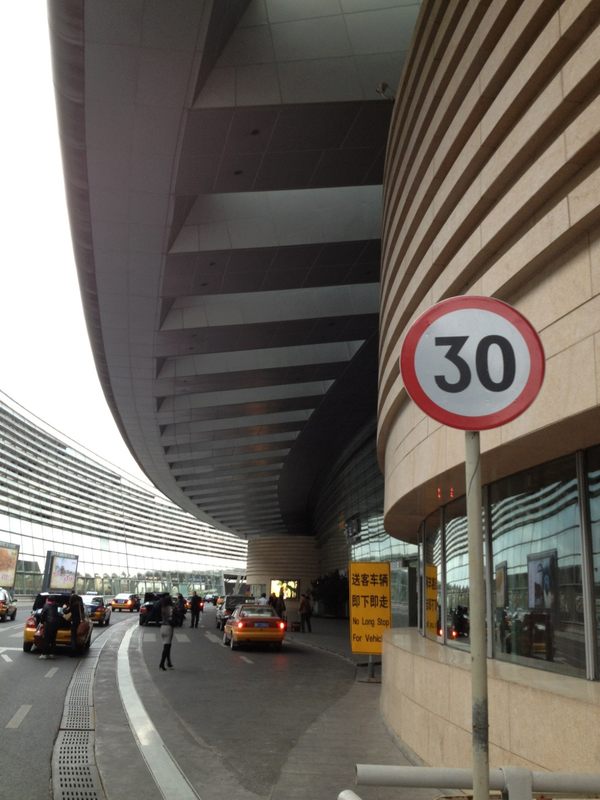 In Beijing and Shanghai the multiple is closer to 30. Construction accounts for 13 percent of the economy, one-quarter of all investment and 40 percent of steel use. *Source: Financial Times “A lofty ceiling reached” (12/14/2011 by Jamil Anderlini). 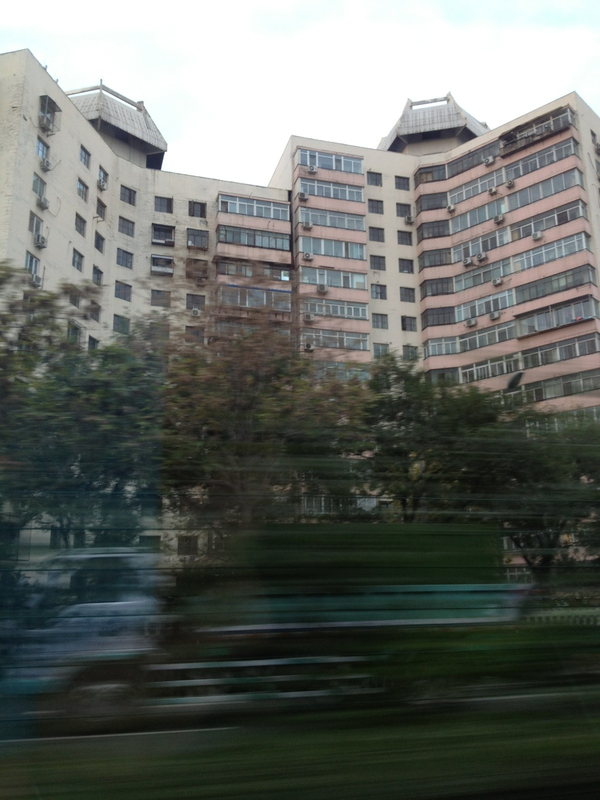 As we head out of Beijing, passing by all the look-a-like buildings and apartment complexes, the G Train finally starts to pick up speed reaching of dizzying 306 km/hr or 190 miles/hour. 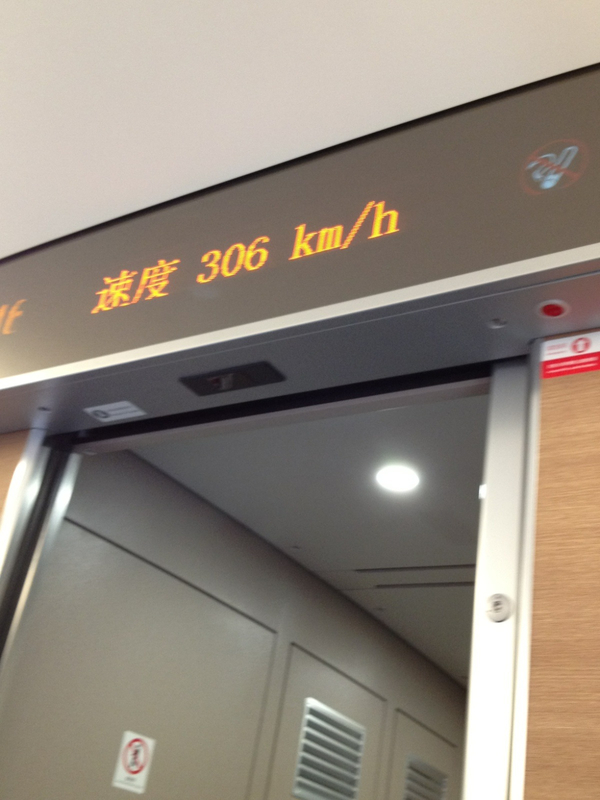 It is the fastest speed I’ve ever traveled by train and my stomach felt it. 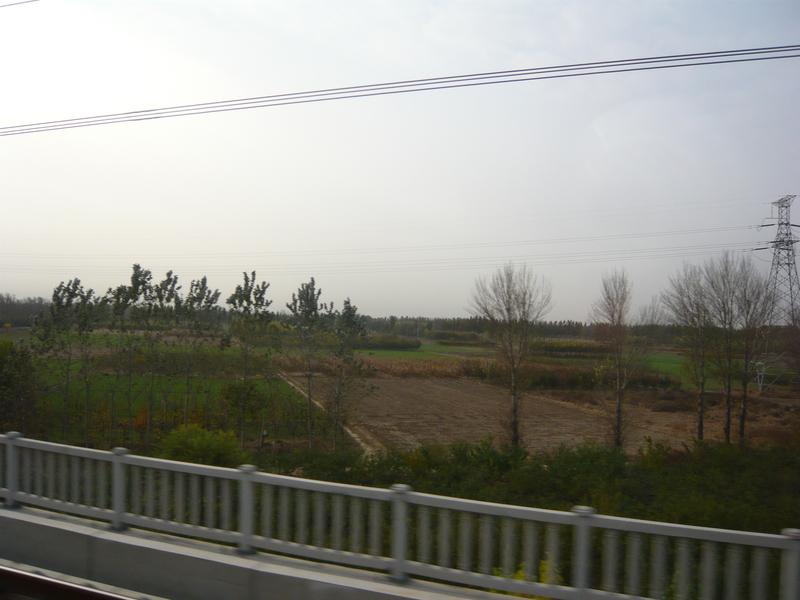 Finally we had left Beijing and were in the countryside and it was beautiful ….but not for long. 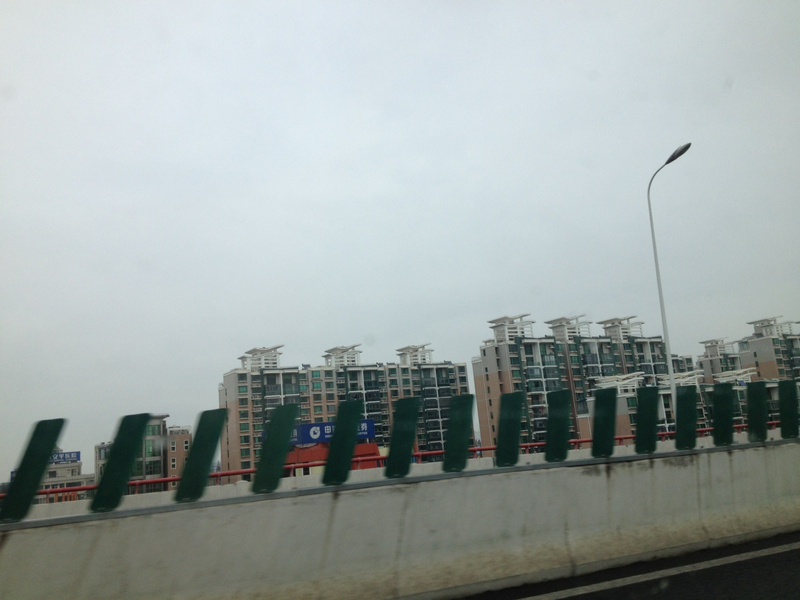 Ghost cities appeared in the distant horizon and it freaked me out….they were everywhere! This photo below spooked me the most. We were in the middle of nowhere and in the distance there was a gigantic “Ghost City” where everything had stopped in time, uncompleted. 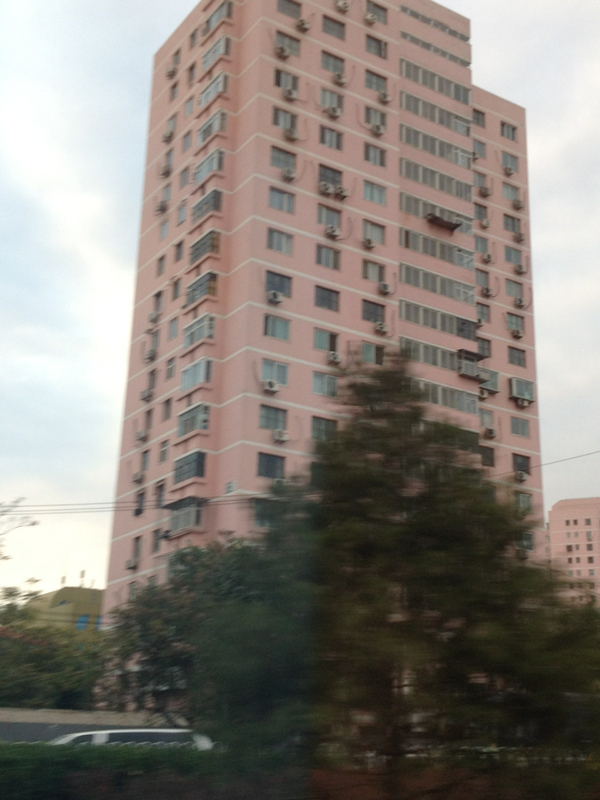 The initial belief of the Chinese government and real estate tycoons was “we will build and they will follow”. Not so sure if it is true. After almost five hours of passing ghost town after ghost town, I was fascinated and in shock. I have never seen such massive construction and building anywhere before. It is phenomenal. In a country where property construction accounts for an estimated 13% of GDP in the world’s second largest economy, what will happen when the real estate bubble comes to a half? 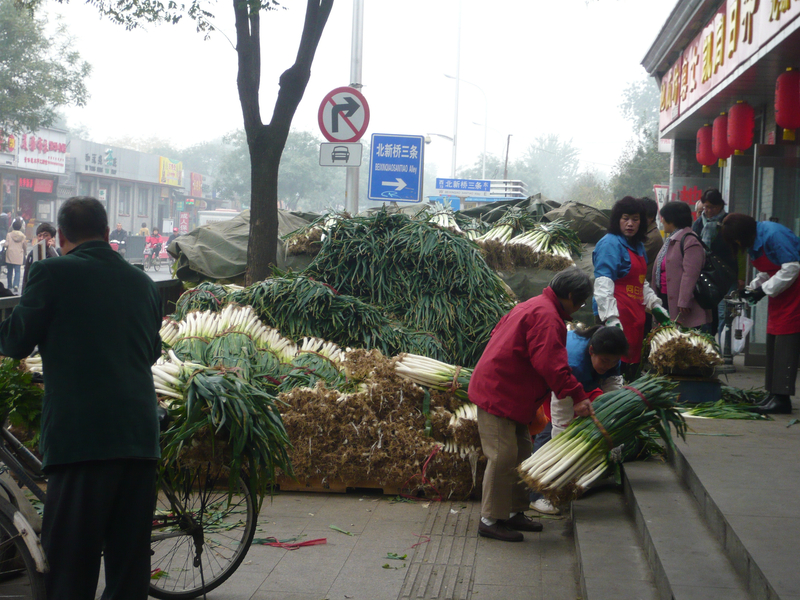 The economic ramifications for China, its people and the world are frightening. Let’s hope for a soft landing. 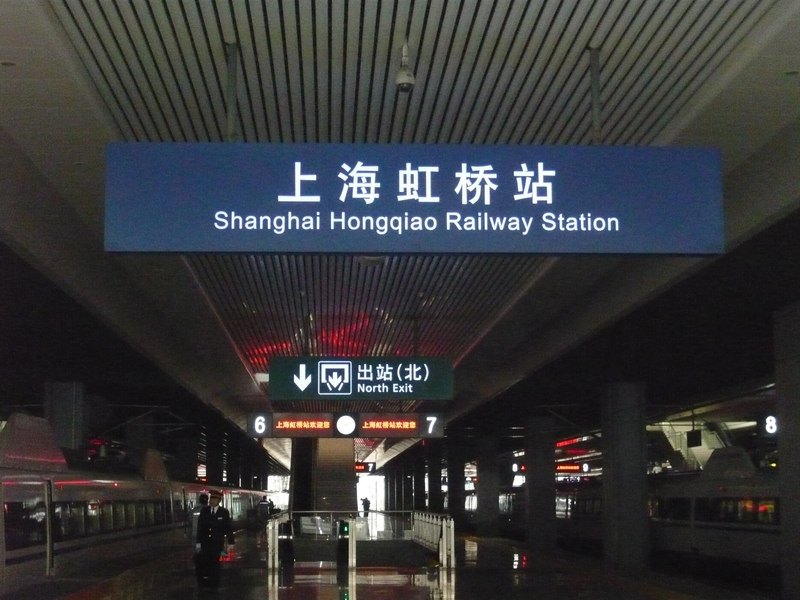 Arrival at Shanghai’s Rail Station…..and on to the next adventure. 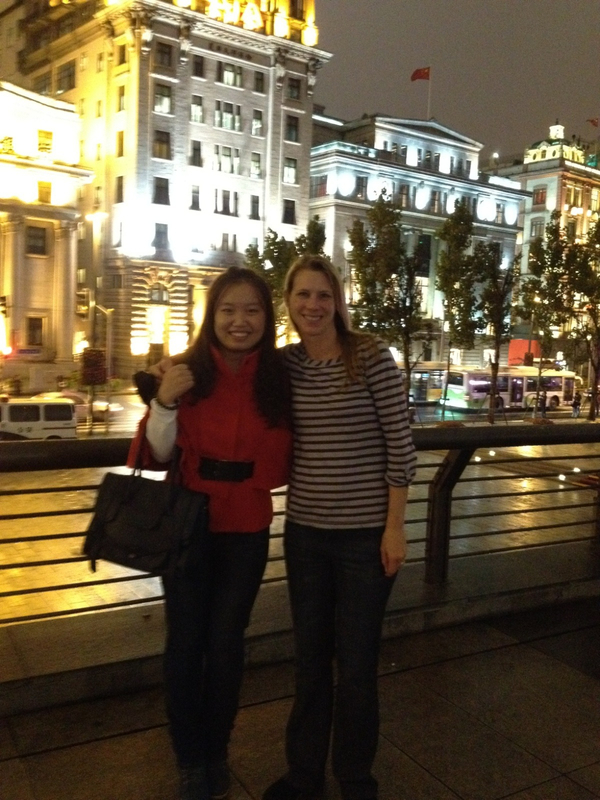 Stay Tuned…more Shanghai surprises coming soon! 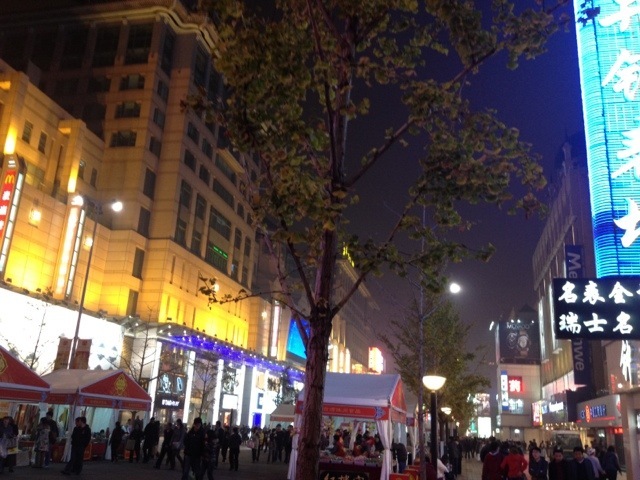 When you think of China’s city lights. your mind often rests on Shanghai and Hong Kong: Big cities, amazing skyscrapers and incredible lighting at night. These cities sometimes feel like Disneyland or Vegas, captivating your souls and imagination. There is an odd resemblance to Christmas, as the city lays aglow in uncanny lights. 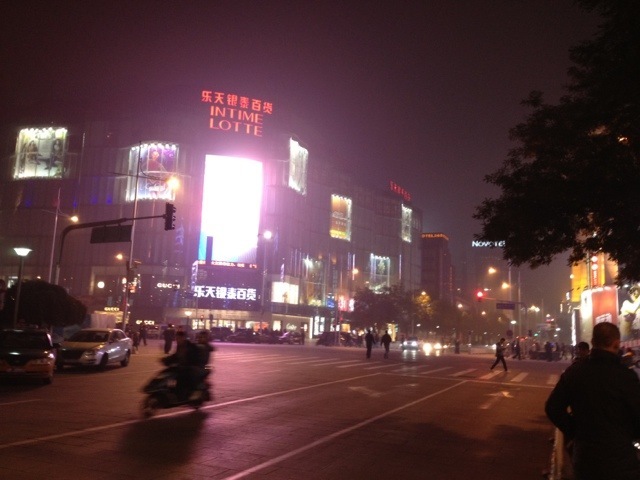 After visiting Shanghai I admit that the city’s evening lights are unbelievable and mesmerizing. I instantly fell in love with the city at night, and felt that Shanghai was almost right up there with Paris, the City of Lights (yet I prefer the older city atmosphere of Paris over the newly built, ultra modern Shanghai). 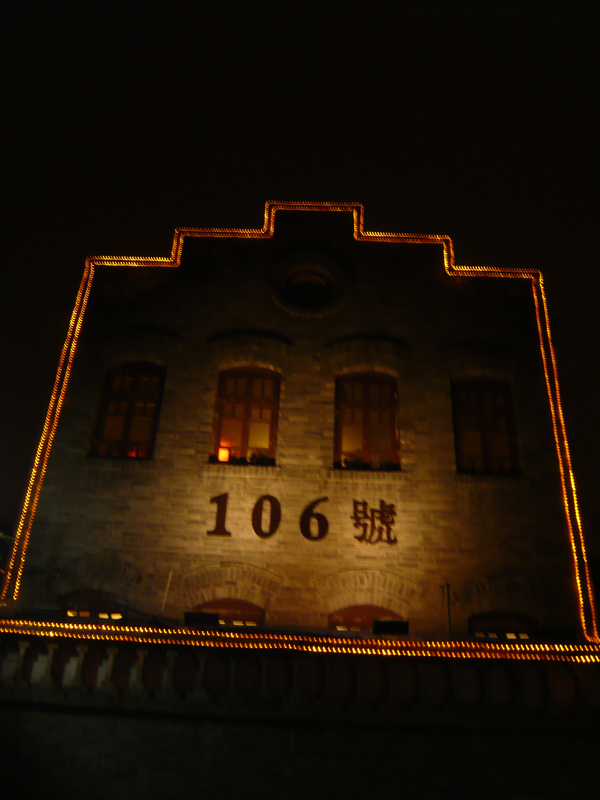 I could have sat there all night admiring the lights over the Bund and Pudong in Shanghai. 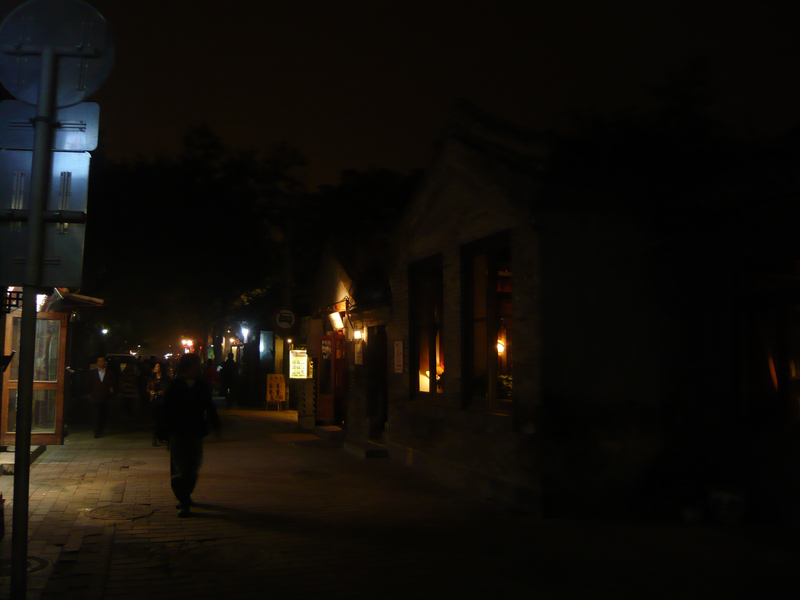 I had never seen anything quite like it before and I realized that the night in Shanghai was by far more beautiful than the day time when the city was awash in pollution, traffic and noise. 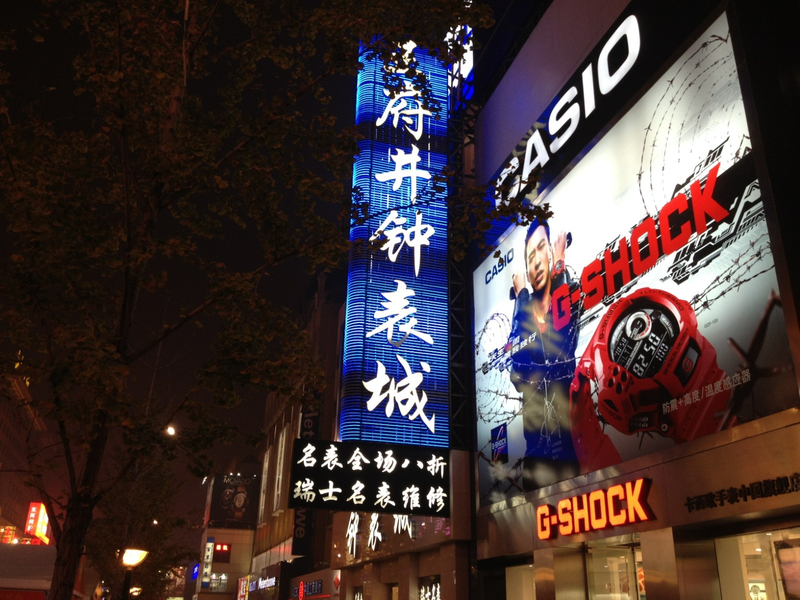 For as much as Shanghai’s lights beckon, I believe that Beijing’s city lights are highly under-rated and definitely worth admiring. 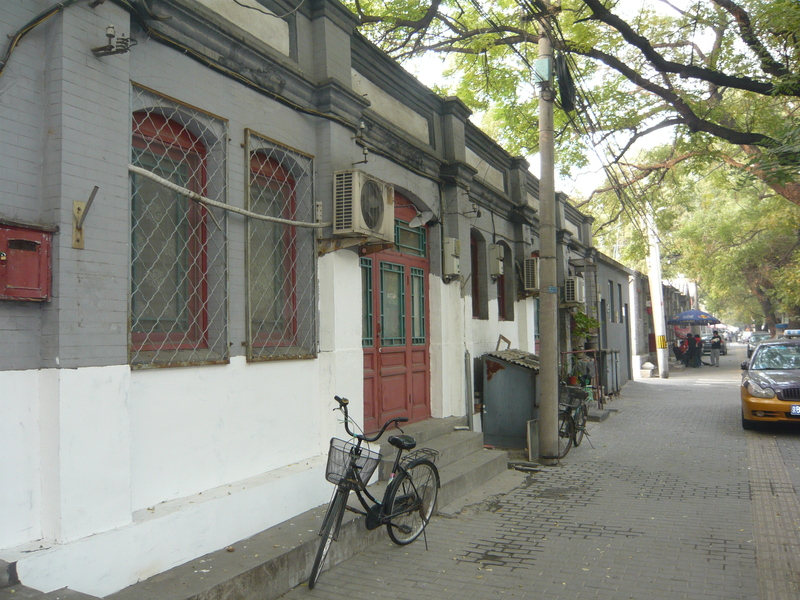 Maybe it is the old-world architecture that I fancy or perhaps the initial belief that Beijing would be uneventful. 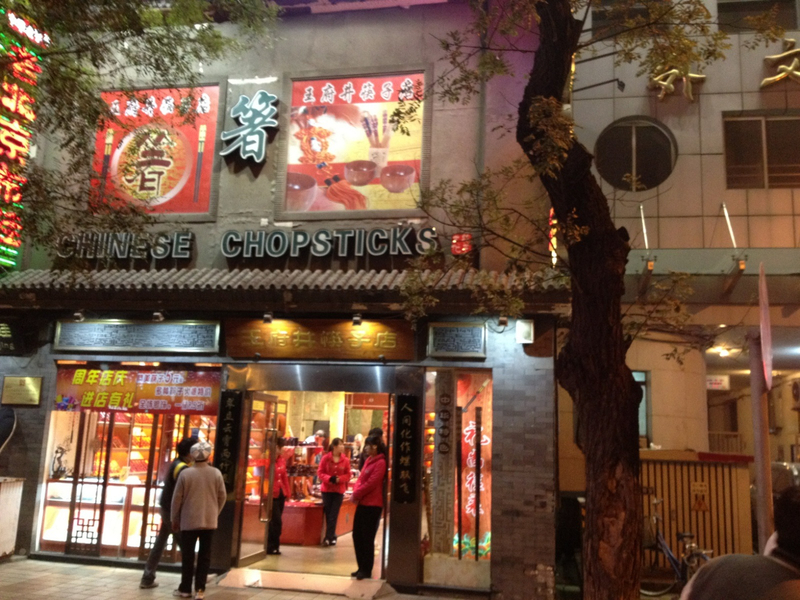 One night in Beijing proved that my assumptions were wrong. 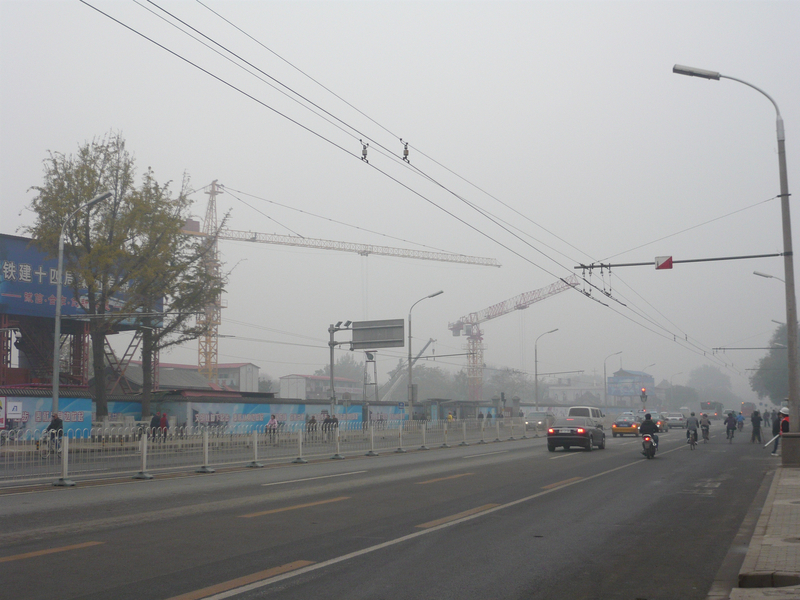 It was not a gray, dull, boring city. Instead, it is an ancient city beaming with life as soon as the sun sets. 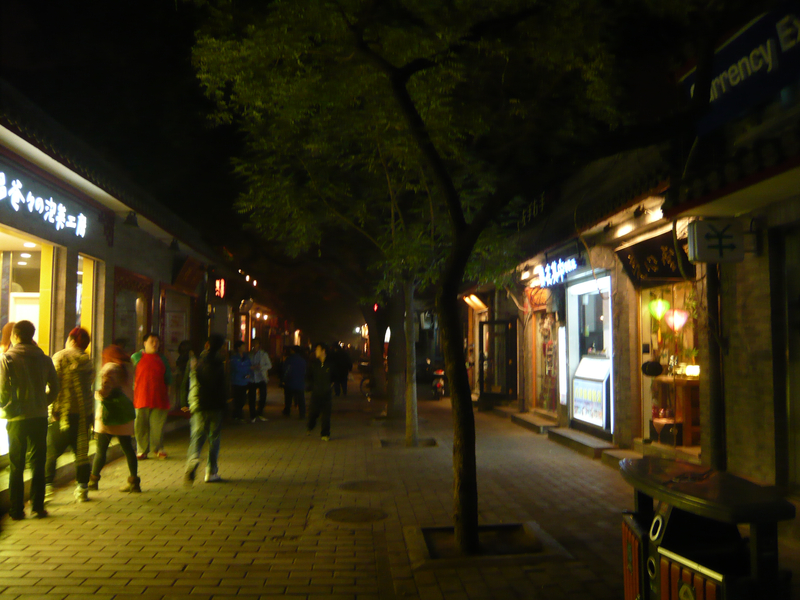 The beauty of Beijing at night can’t be denied. It is a place worth exploring with your eyes wide open…. 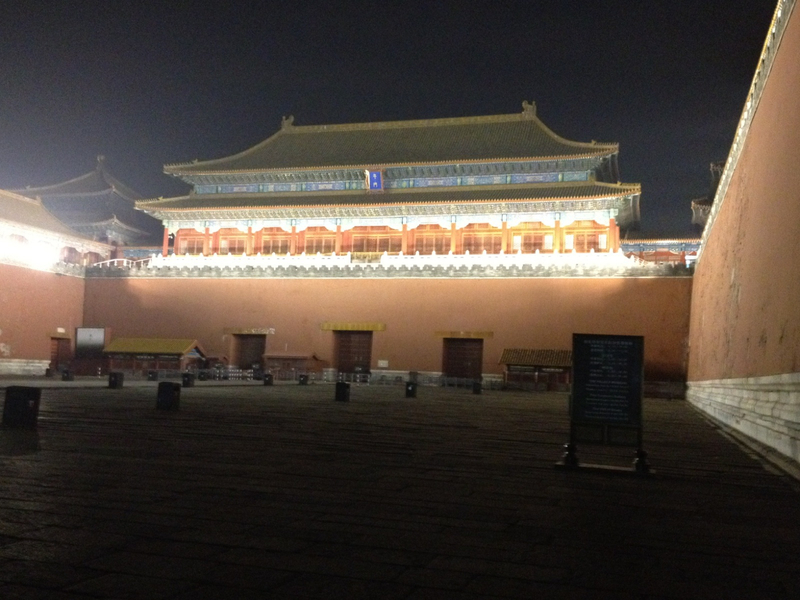 The Forbidden City at night is unbelievably spectacular. My only regret is that I’m not a better photographer as I was unable to truly capture the dreamlike nature of this place at night. View from the cab. I love this photo. 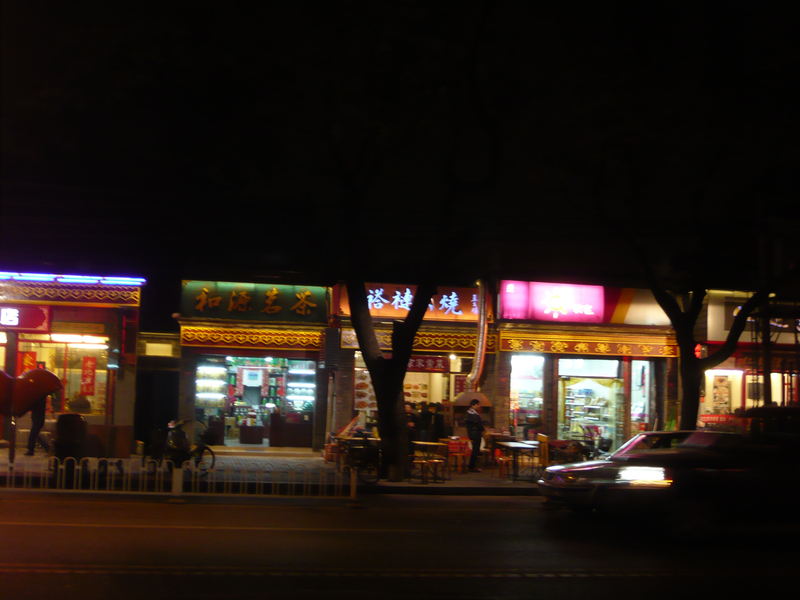 I feel that it captures the true energy of Beijing at night. 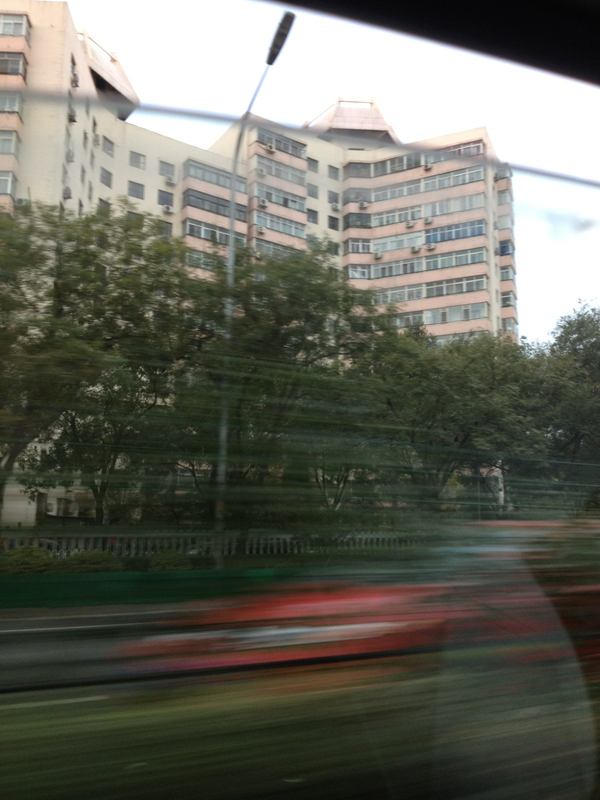 I took it from our cab window obviously while we were moving. 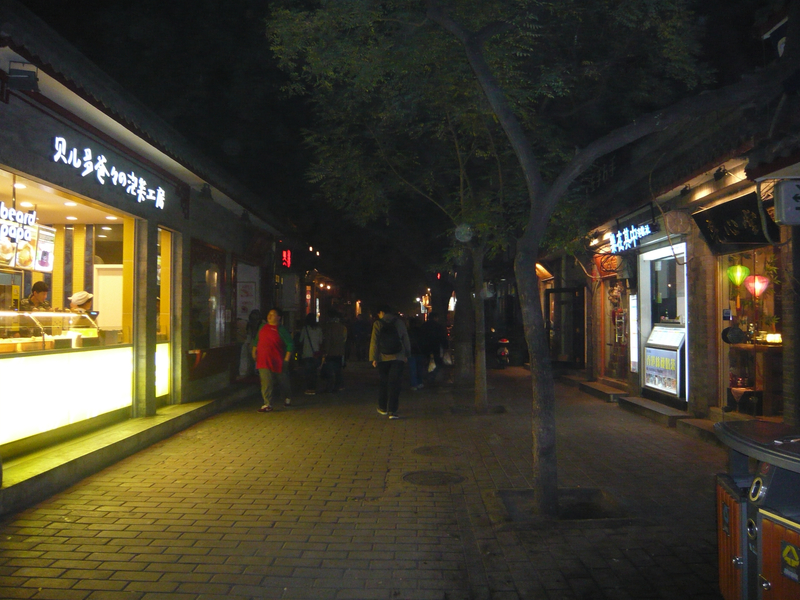 Picture of Ghost Street, the renowned street with any kind of Chinese food that your heart desires. 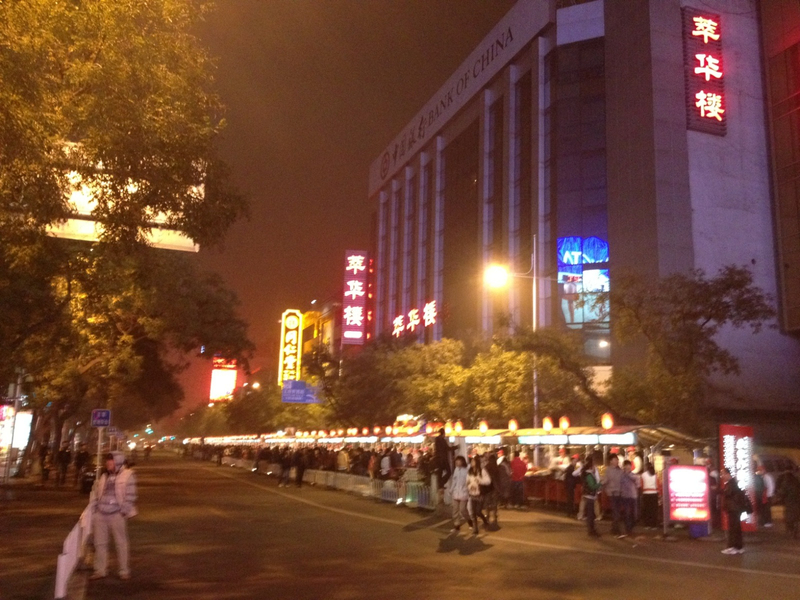 Right outside of our hotel was one of the largest street food venues I’d seen. 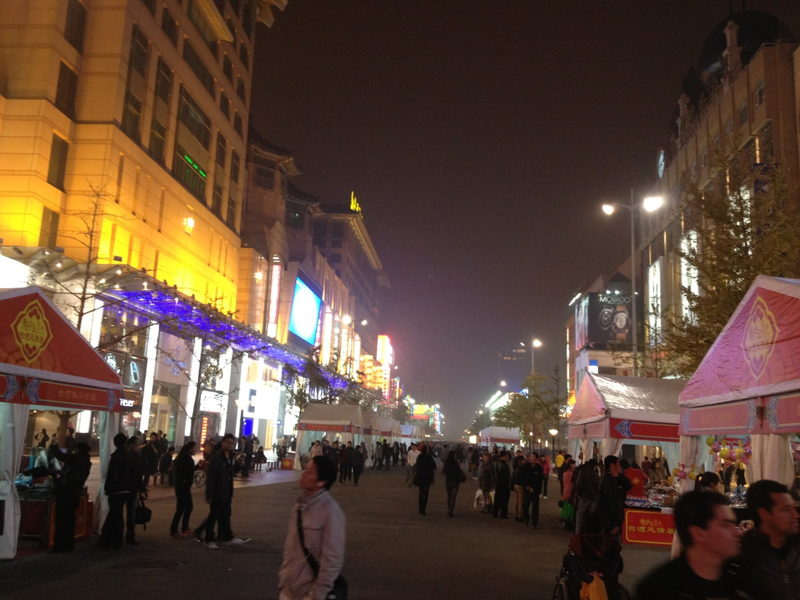 It was bustling with activity as soon as the sun set. Hungry customers lined up and ordered their meals on a stick to go (of course cooked fresh right in front of their eyes). 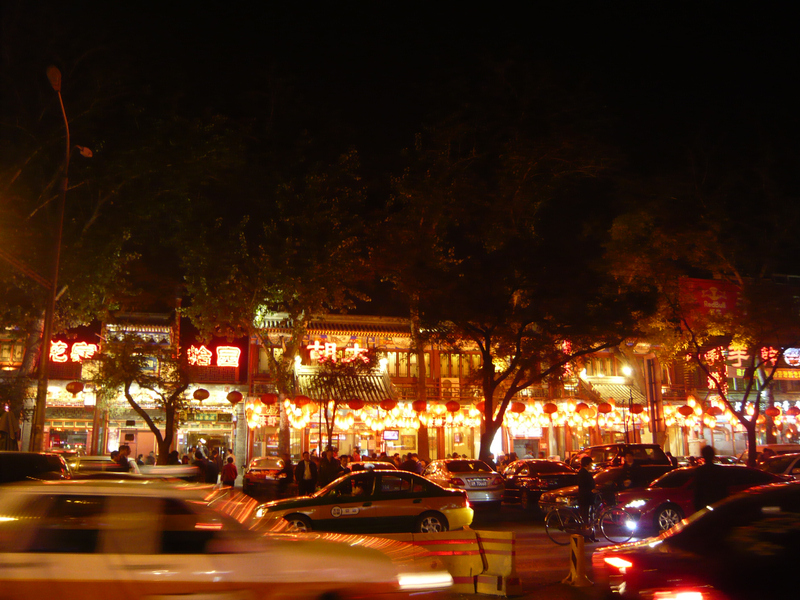 The main pedestrian street at night was filled with colors and entertainment. 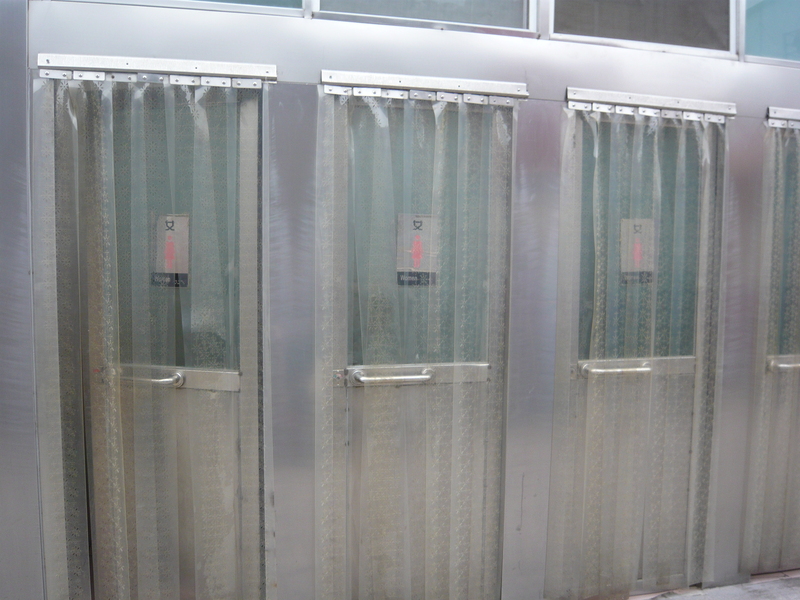 There were enormous flat screened TVs built into the sides of buildings. Kind of reminded me again of Vegas or New York. 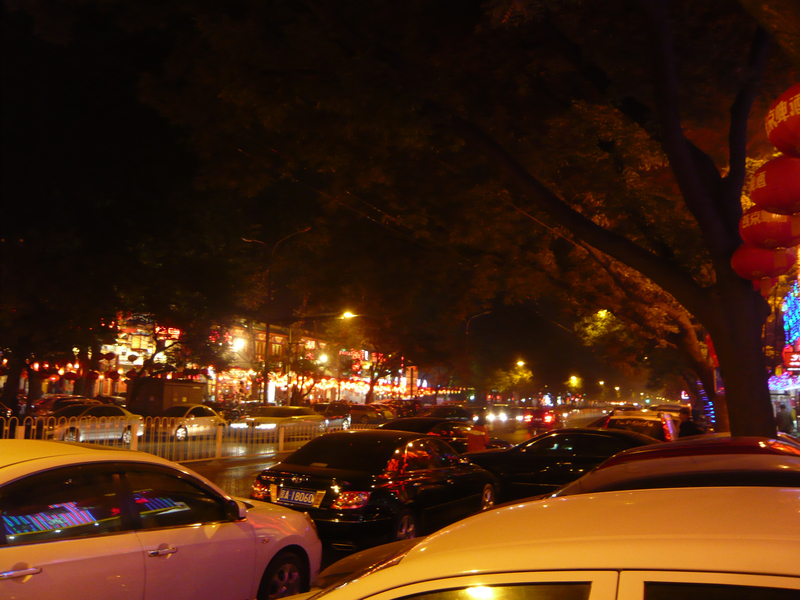 My only regret was that I was too tired from jet lag and walking eight hours throughout the day to stay up later and enjoy the sensational beauty of Beijing at night. For the city’s secrets are often revealed at night when it is quite, more peaceful and full of a different kind of life. Before visiting China, I had the amazing opportunity to hike the Annapurna Circuit trek in Nepal. As I’ve said time and time again in my blog and to family and friends, this was the one trip in my life that really touched my soul. It inspired me. It changed me. 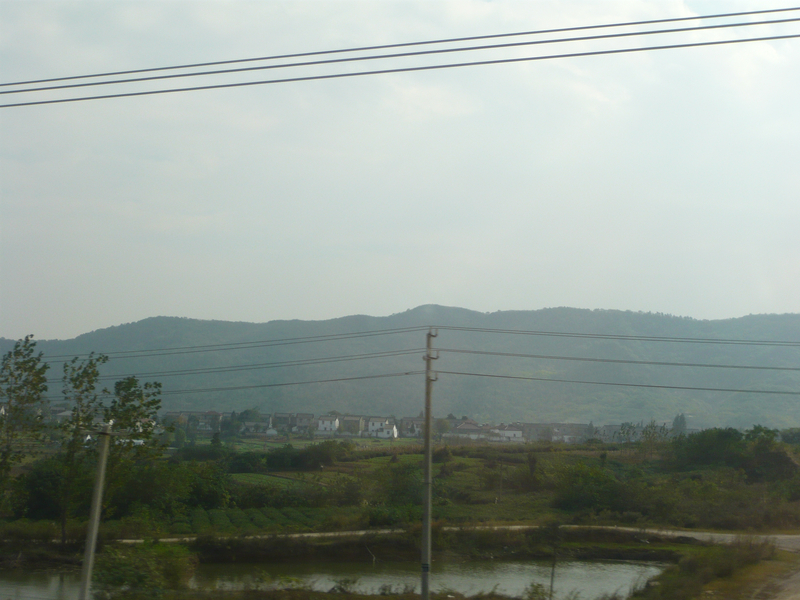 And most of all, it encouraged me to continue exploring as many far off destinations that I can possibly visit. My trip to Nepal was my first exposure to the Buddhist religion. Sharing a border with India, Nepal, a tiny mountainous kingdom, was exposed to two main religions: Hinduism and Buddhism, that grew and developed to become the two prominent religions in Nepal. During my trek through rural mountains villages in Nepal, I was blessed with one Buddhist village after another. 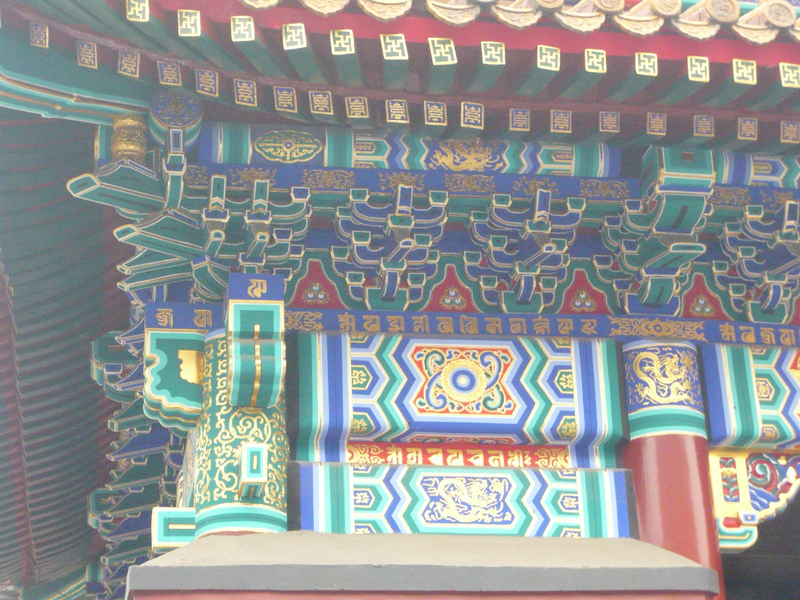 Temples, colorful prayer flags, gigantic prayer wheels and burning juniper incense infiltrated my heart and soul. 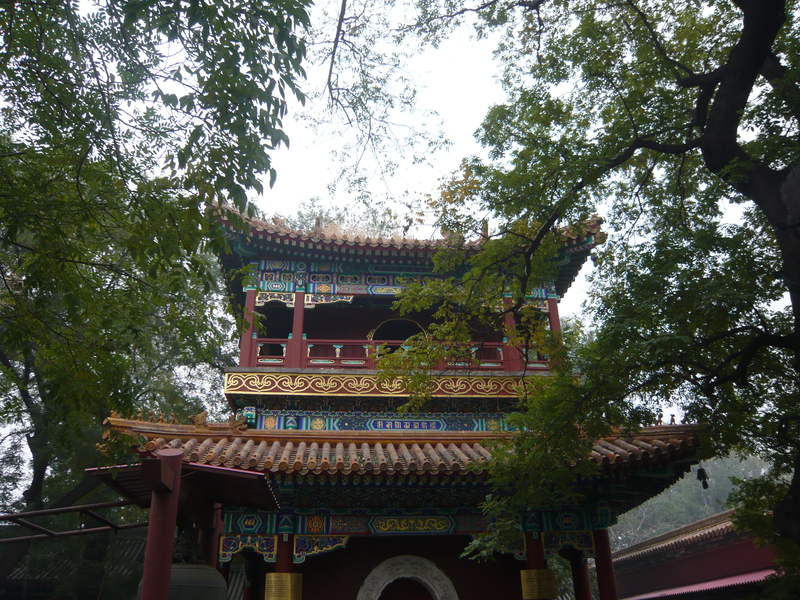 The monks dressed in maroon robes and praying softly was a pleasant, peaceful experience. I instantly purchased the Dalai Lama’s famous autobiography when I got home. I felt inspired by this magical religion and wanted to learn more. I read his book, appropriately titled “Freedom in Exile: The Autobiography of the Dalai Lama“, and felt an anger and shock burning inside my soul that drove me mad. 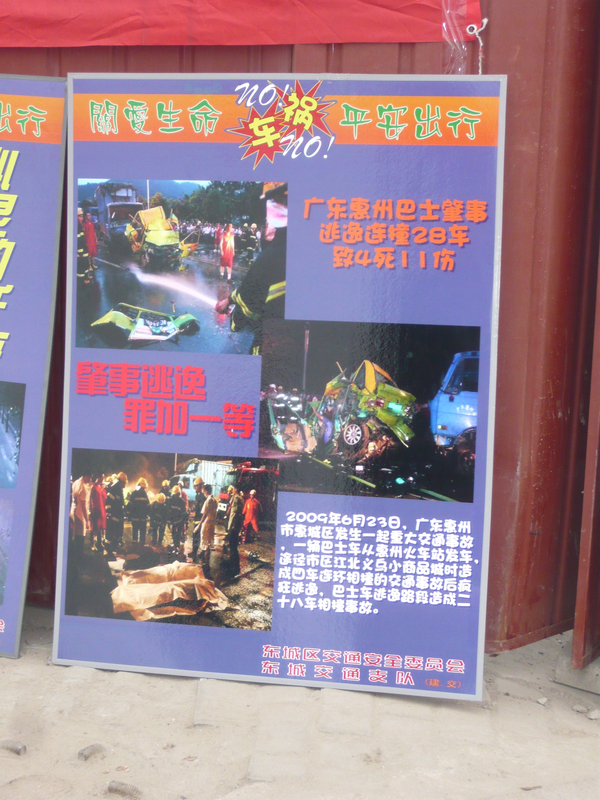 I could not believe what the Chinese government had done. It was tragic, sad and terrible. Yet, it was a story that had been repeated all too frequently in our world’s history. America and the injustice done to the Native Americans. The “colonization” of South America. The tearing apart of Africa. And the list goes on. 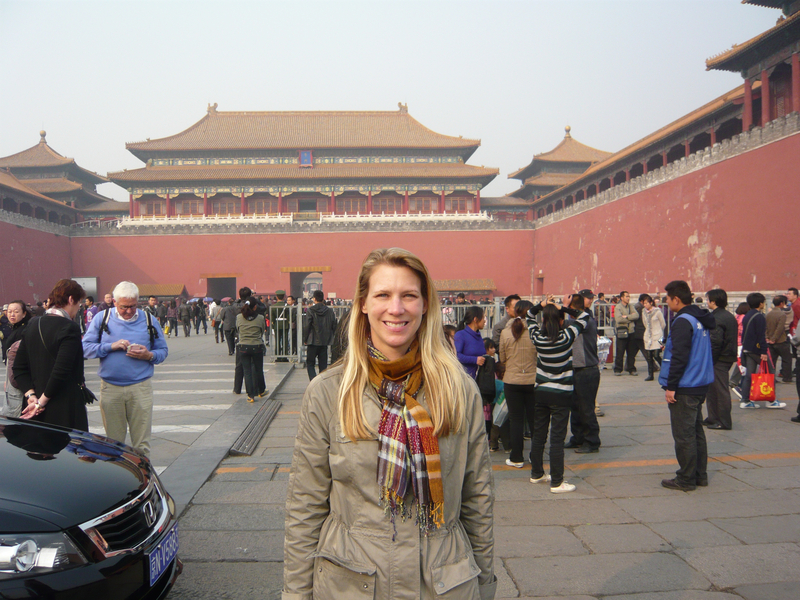 What I had a hard time coming to terms with after reading this book was my feelings on traveling to China. 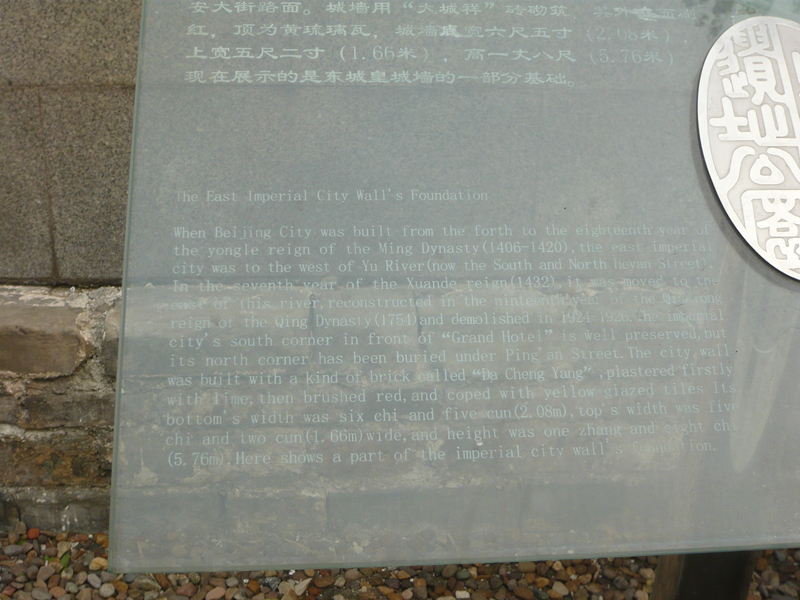 I understood that human rights were far from being achieved by the Tibetans as well as most of the population of China. Would I be ok with that? Driving around town in the Twin Cities (the local term here for Minneapolis and St. Paul area) I grew accustomed to seeing “FreeTibet” bumper sticks on many cars. I knew that the Dalai Lama had recently come here to speak with his people, the local Tibetans who have come here in exile to start a new life. 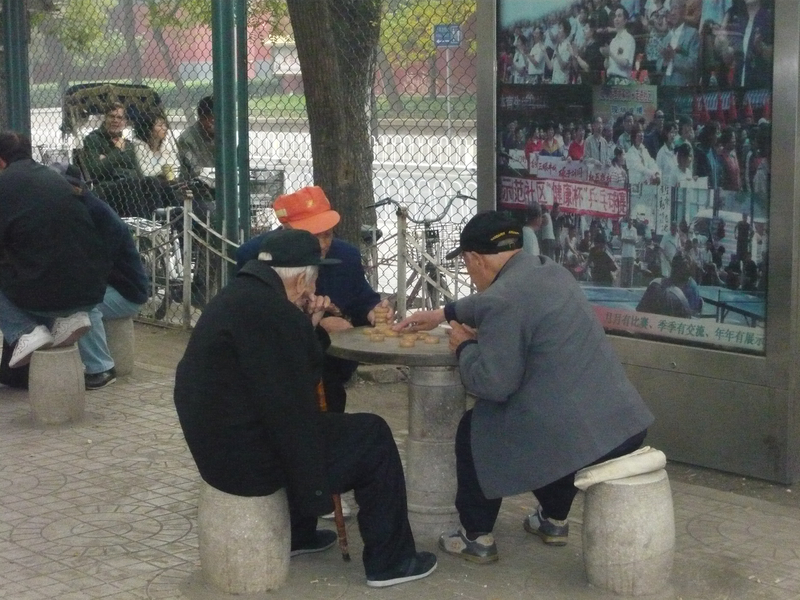 What do they think of the Chinese government? I wondered but felt like I knew. 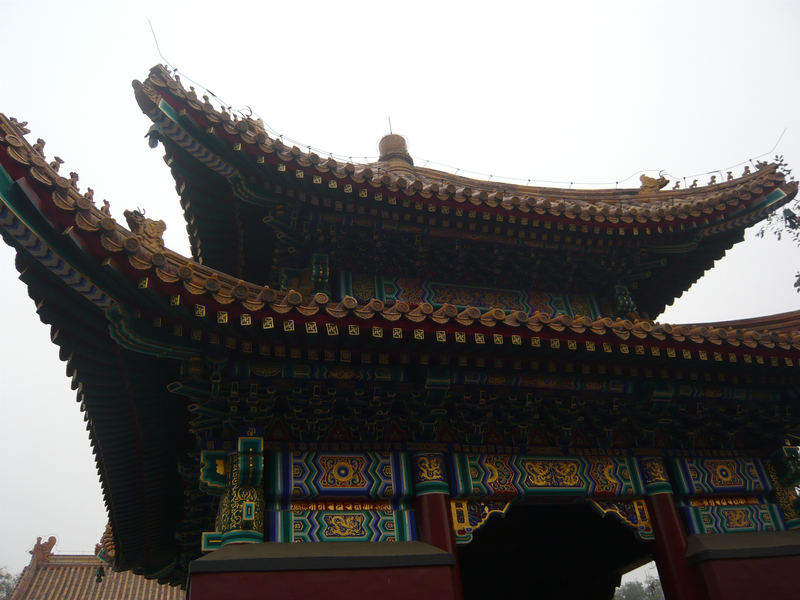 I wouldn’t find my answer of course until I was in China, looking around, visiting Buddhist temples and talking to people. 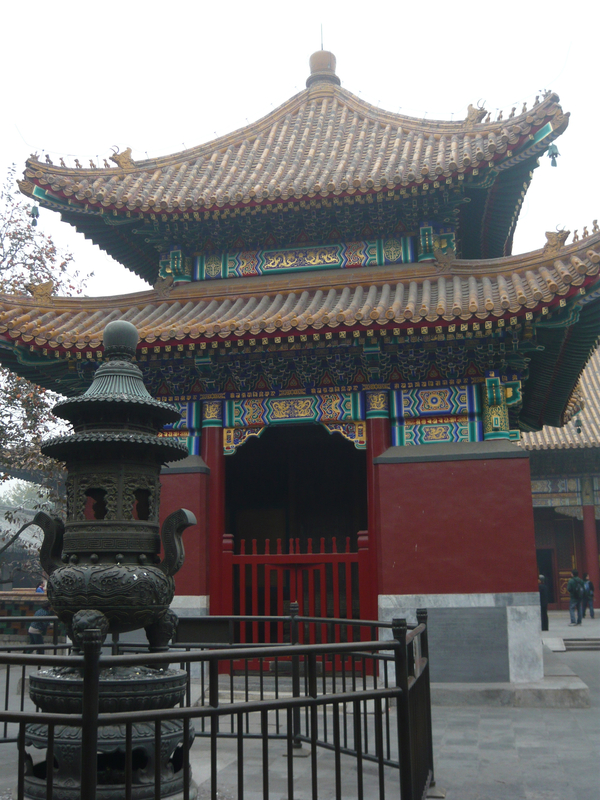 The first stop in my quest to understand Buddhism in Beijing was the most revered Buddhist temple outside of Tibet: The Lama Temple. 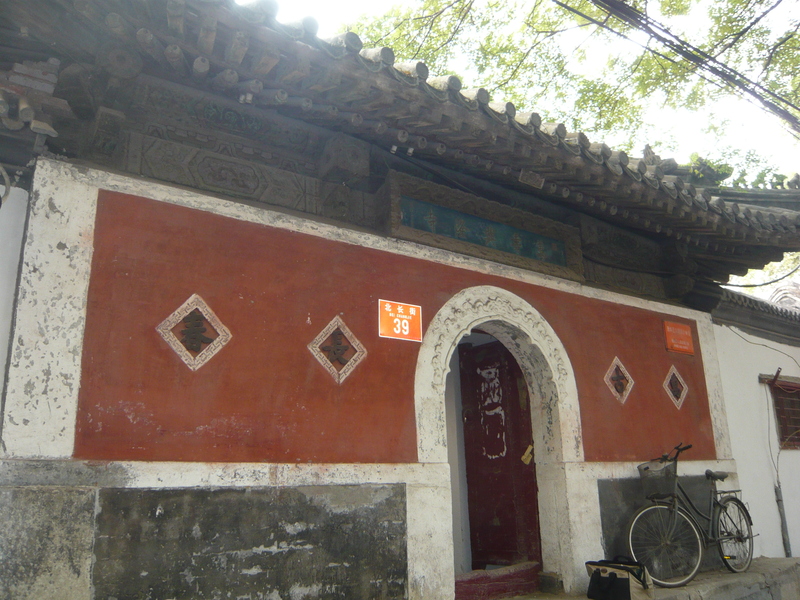 Originally built in 1694 during the Qing dynasty it was used as a palace and later changed to lamasery in 1744 by Emperor Qianlong. 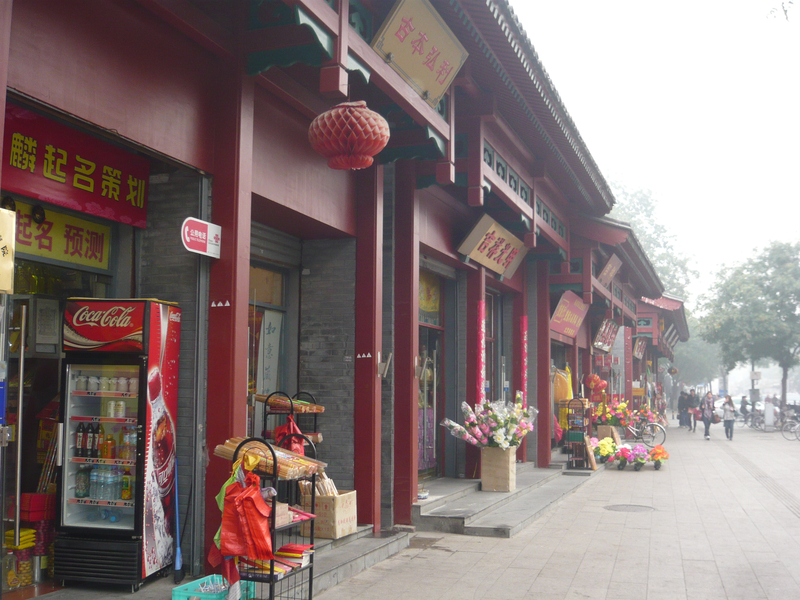 Today it is the largest, most well-preserved lamasery outside of Tibet and is a renowned place of worship, pilgrimage and importance in the heart of China’s capital. 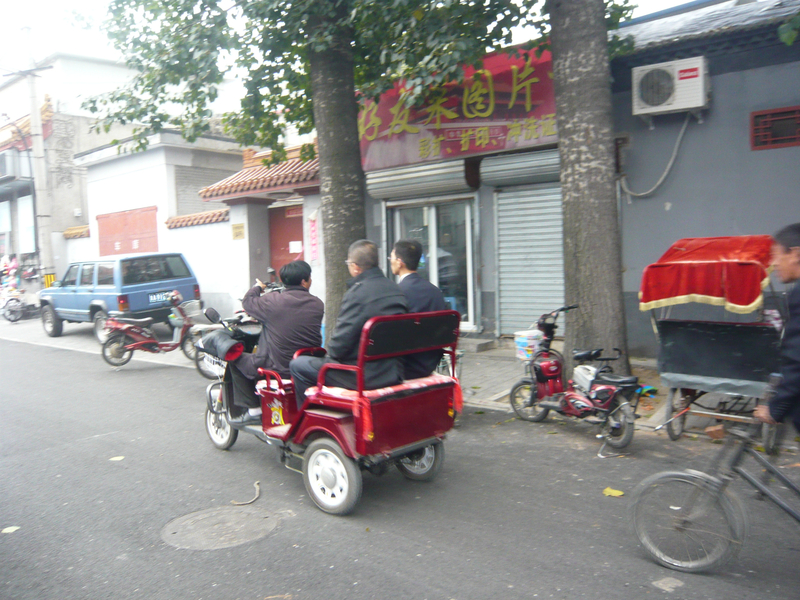 We set off on our last afternoon, walking, to the Lama Temple. 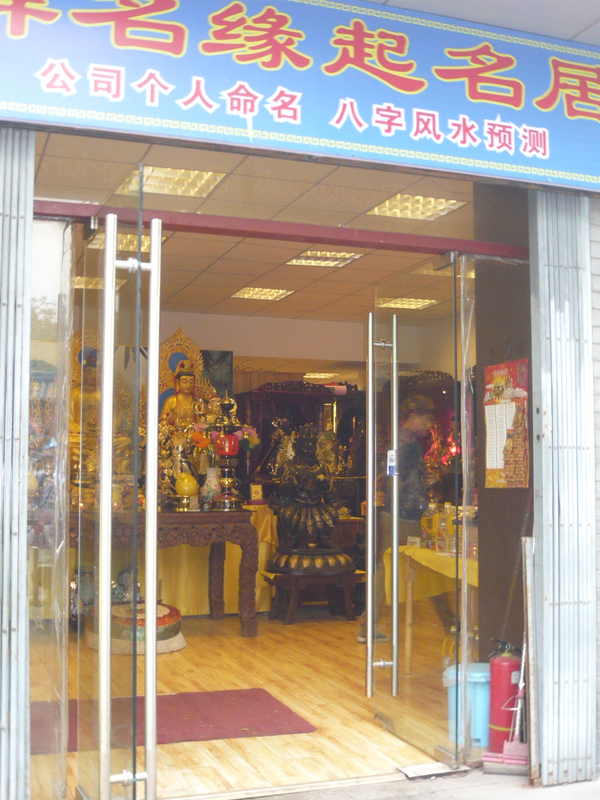 After reading the Dalai Lama’s tragic account of events, I wasn’t sure what kind of religion I’d find in China. 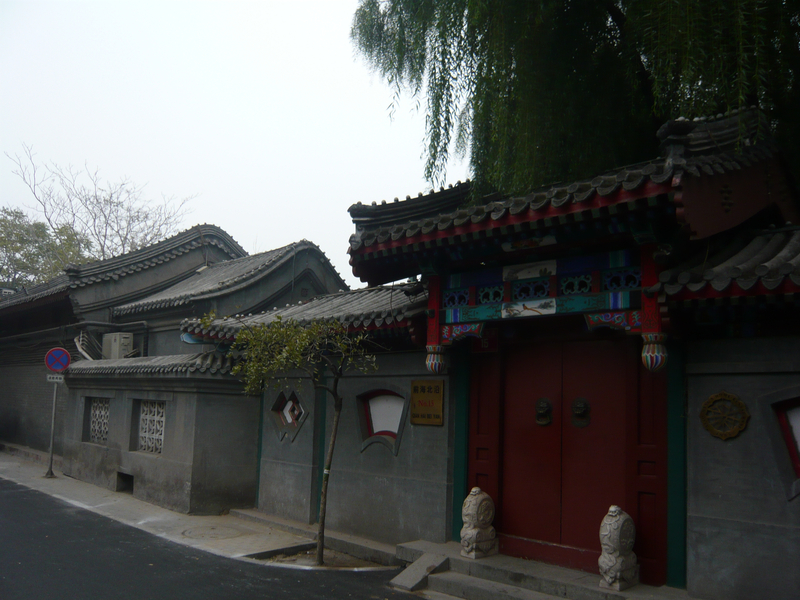 I understood that the Communist Party of China had no official religion yet tolerated religious practice to some degree. 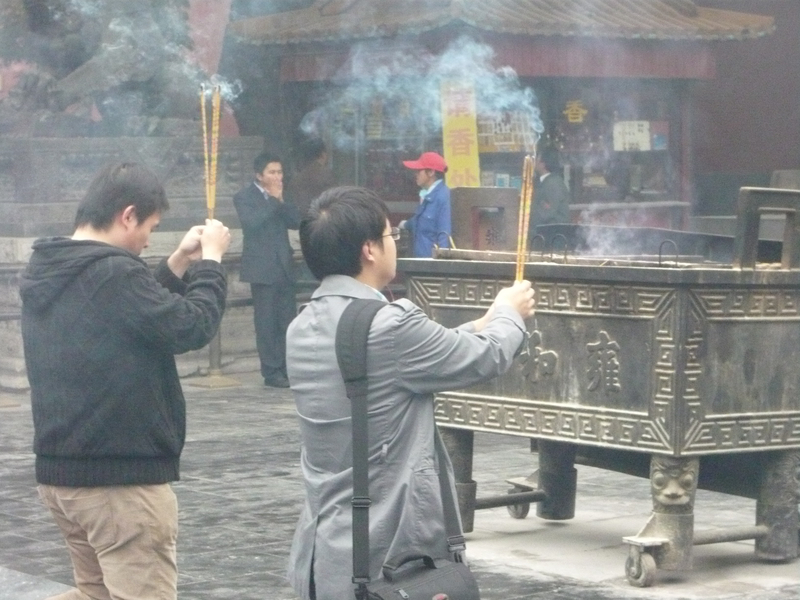 Yet it was hard to get a sense of how religious the Chinese are overall since many prefer to keep their religion private. 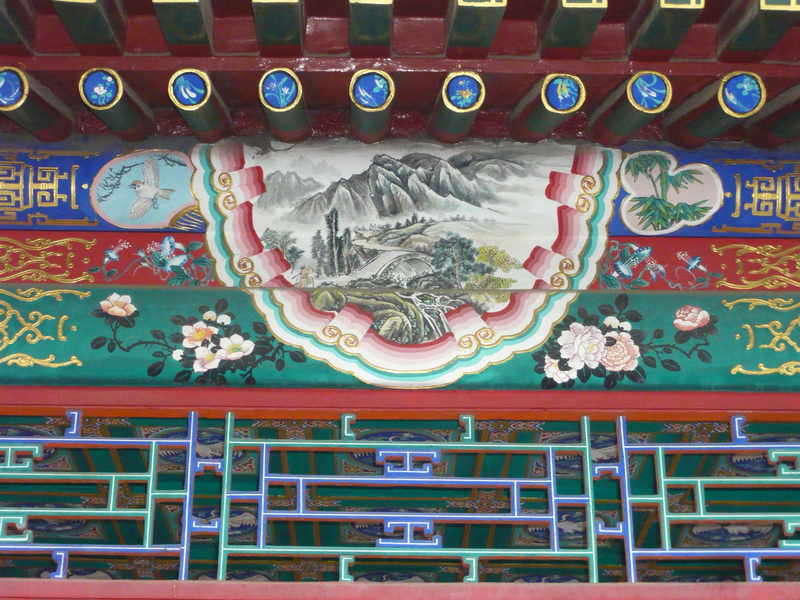 Some estimates state that there are approximately 100 million Buddhists in China. It is the most prevalent religion, followed by 18 million Muslims, 10 million Protestants, and 4 million Catholics (Facts from “Culture Smart China: The Essential Guide to Customs and Culture” 2010 edition). Yet in a land of 1.3 billion people, these numbers lead me to believe that there are a lot of people who do not practice a religion or chose not to tell anyone that they do. 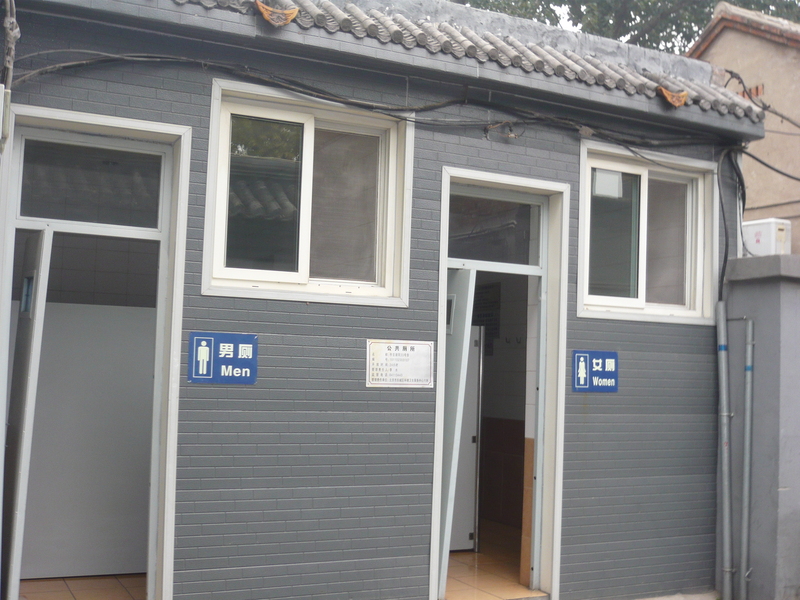 Like most statistics in China, it is hard to get a clear picture. 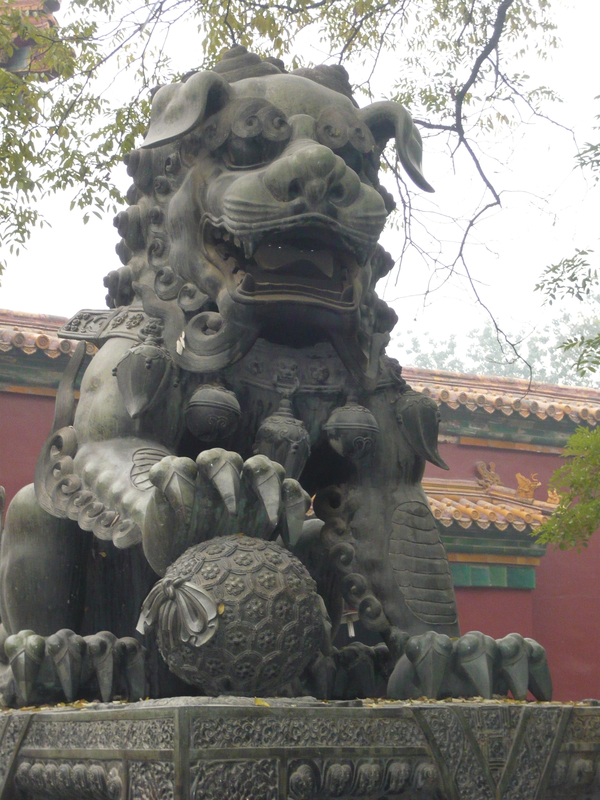 Regardless, Buddhism has a strong cultural importance in China as it has been inside the country for thousands of years since its introduction from India via the Silk Road. 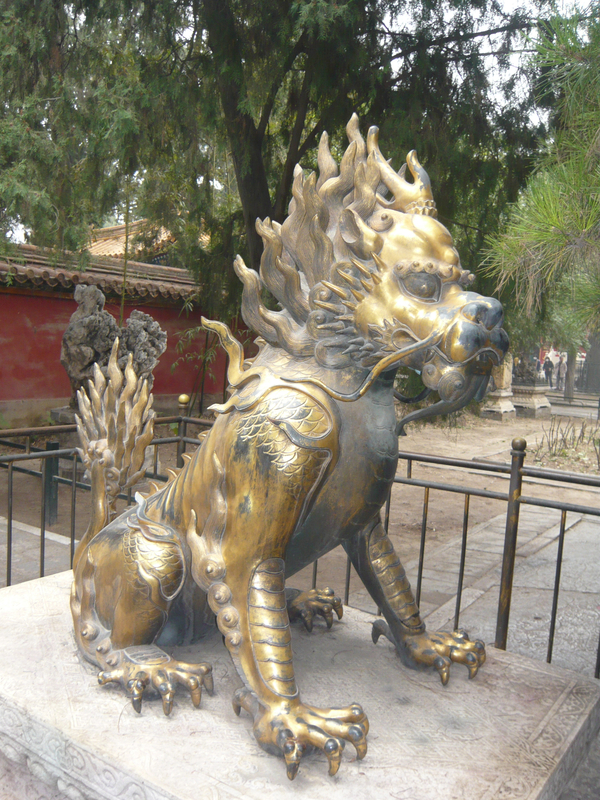 I was keen to visit the Lama Temple and see what it was all about. 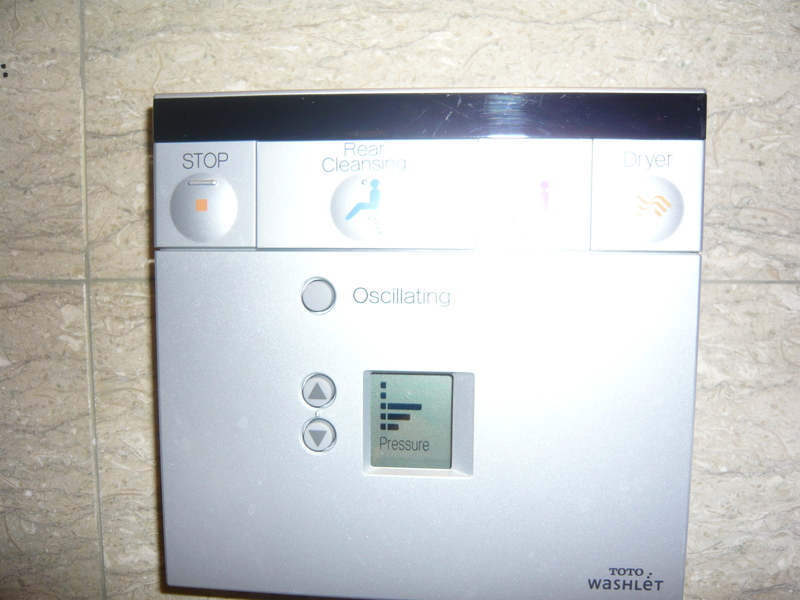 After visiting this lovely place, I was even more confused than ever. 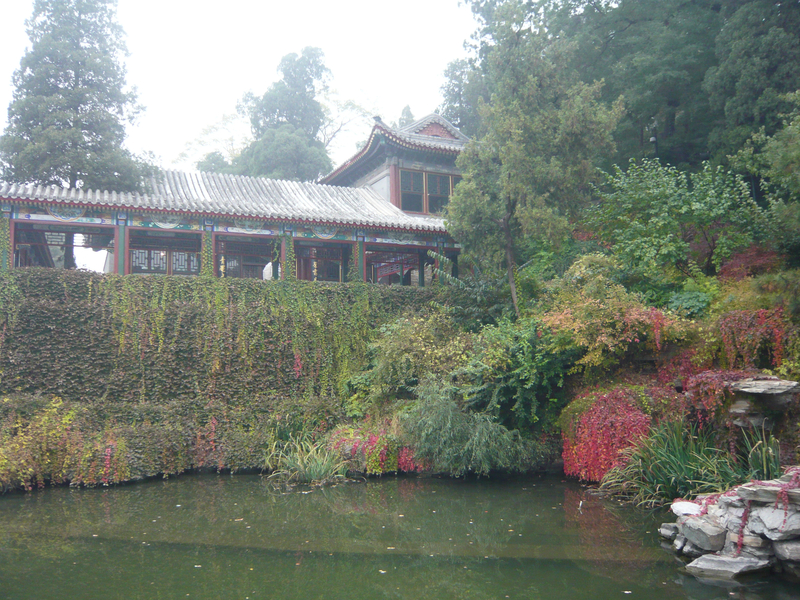 For it was simply serene and the devoutness of the practicing Chinese Buddhists was deeply touching. 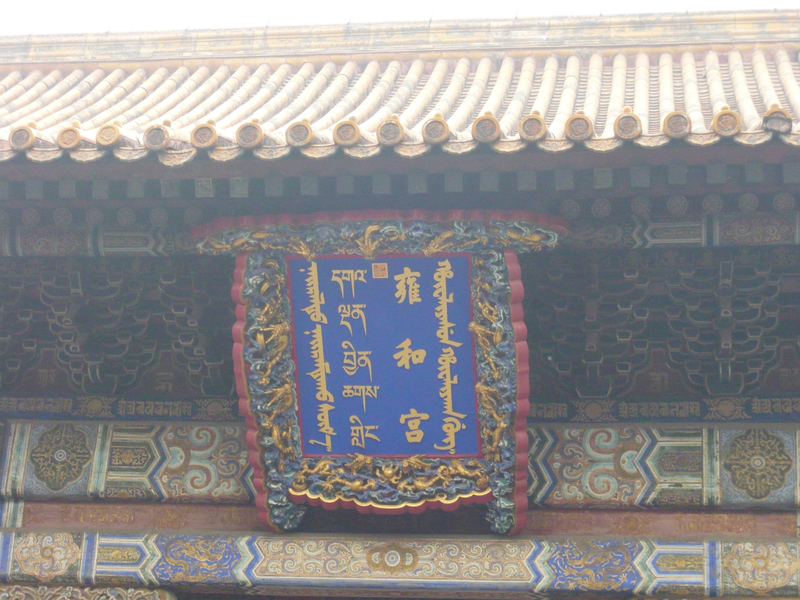 It didn’t make sense to me what had happened and why Tibet cannot be free. 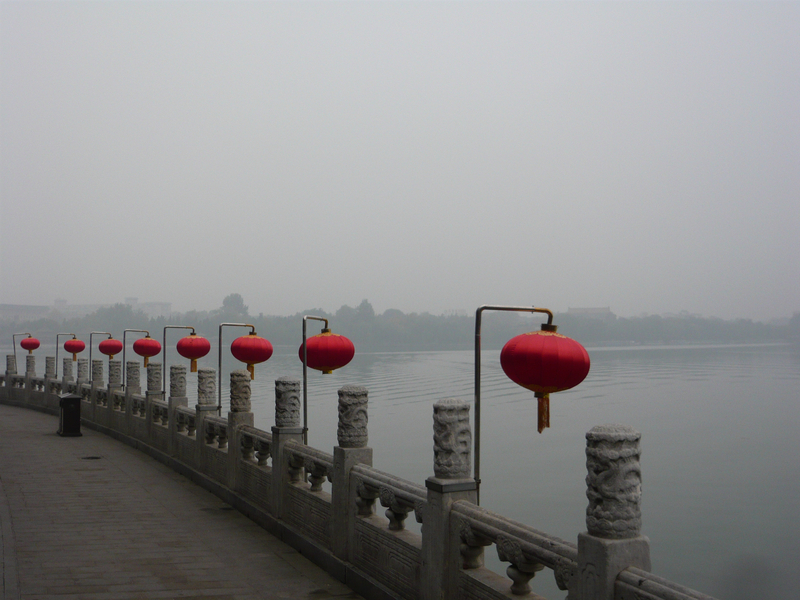 Like most of my trip to China, it proved that it is a land of paradoxes and contradictions that a foreigner may never fully understand. There are many questions in life that will remain forever unanswered. Perhaps this is one of them. 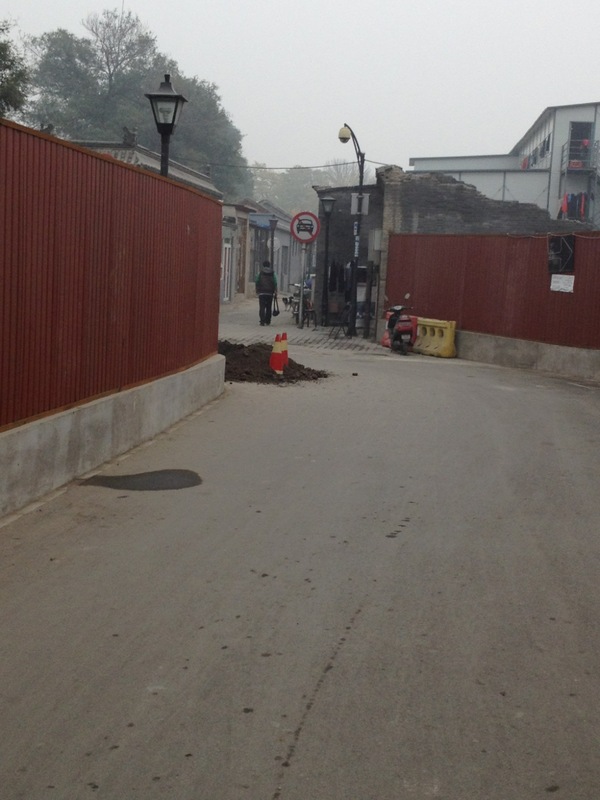 Here are my pictures and commentary from my visit. 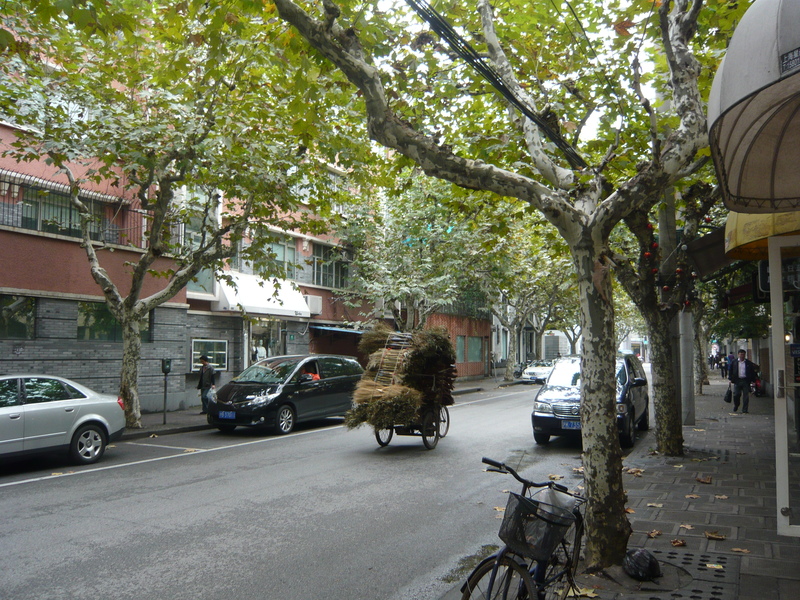 The walk from our hotel near the Forbidden City took us over an hour passing through main thoroughfares, small streets and plenty of interesting things to take pictures of. 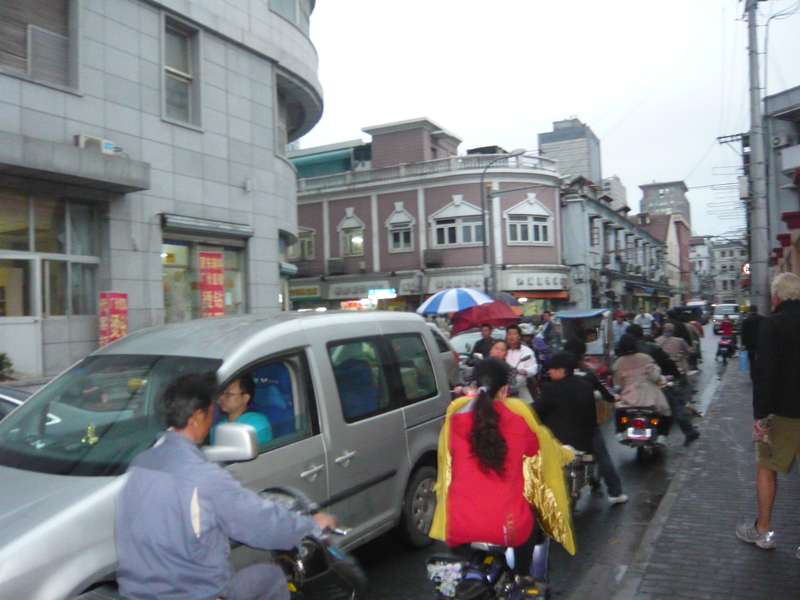 We knew that we were finally getting closer to the Lama Temple when we reached this street packed full of Tibetan shops. 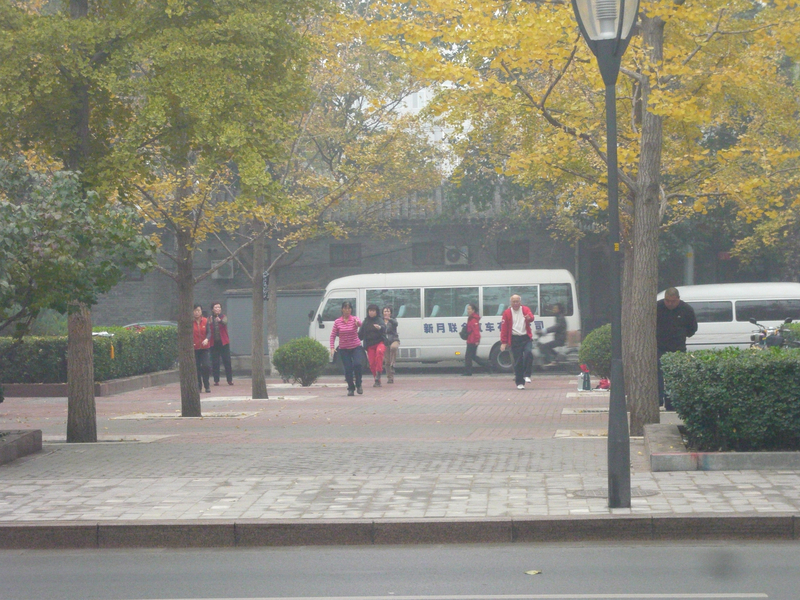 Suddenly gray dull Beijing came to life with color, smell and sounds as we entered the Buddhist district near the Lama Temple. 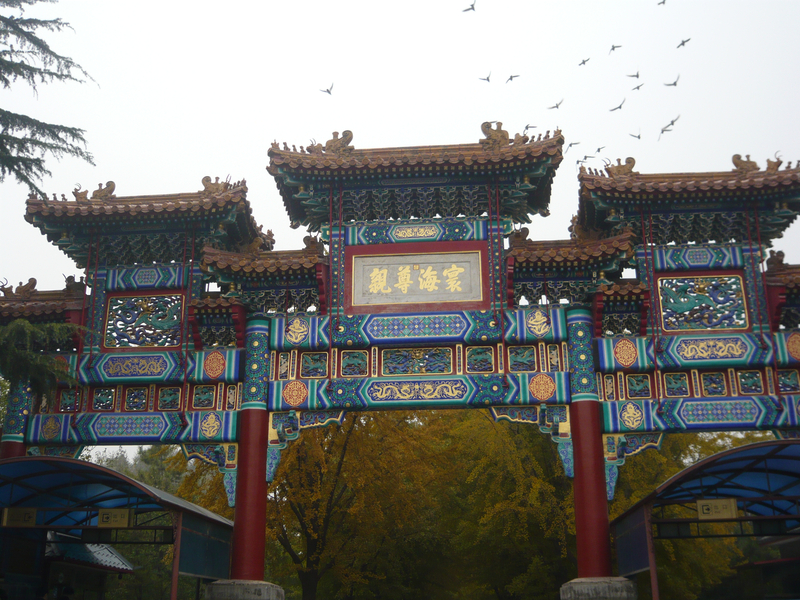 The majestic archway leading into the Lama Temple. 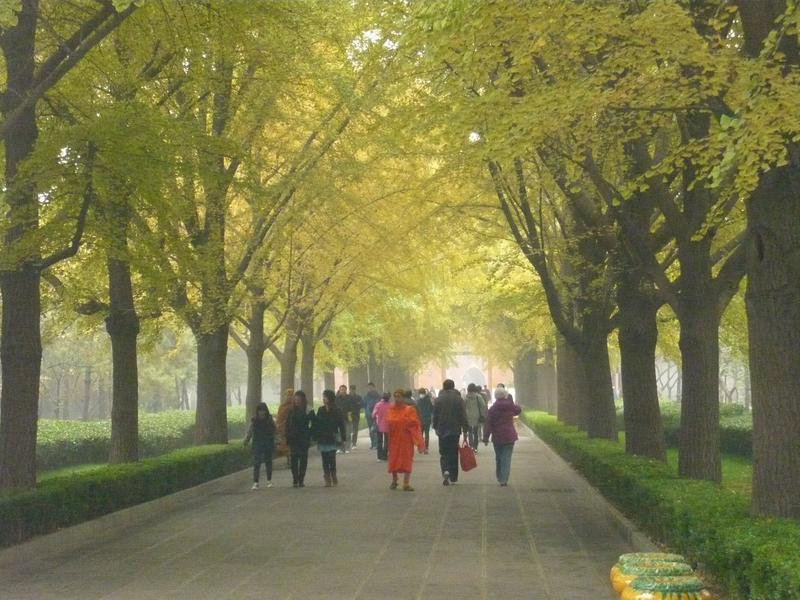 The walkway to the temple was beautifully adorned with shade trees that cast a peaceful glow on the area. 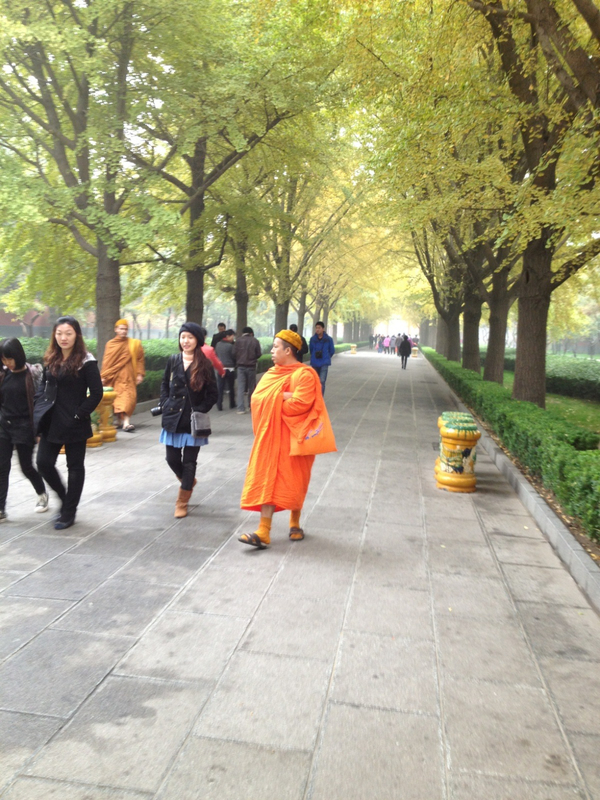 There were plenty of monks dressed in brilliant orange. 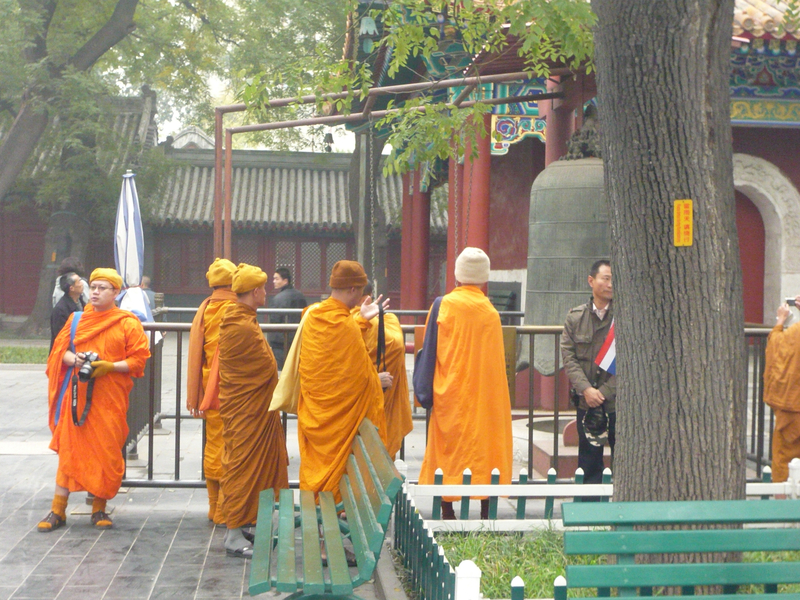 Some monks had obviously come from far to pray and also be like a tourist and snap some photos. 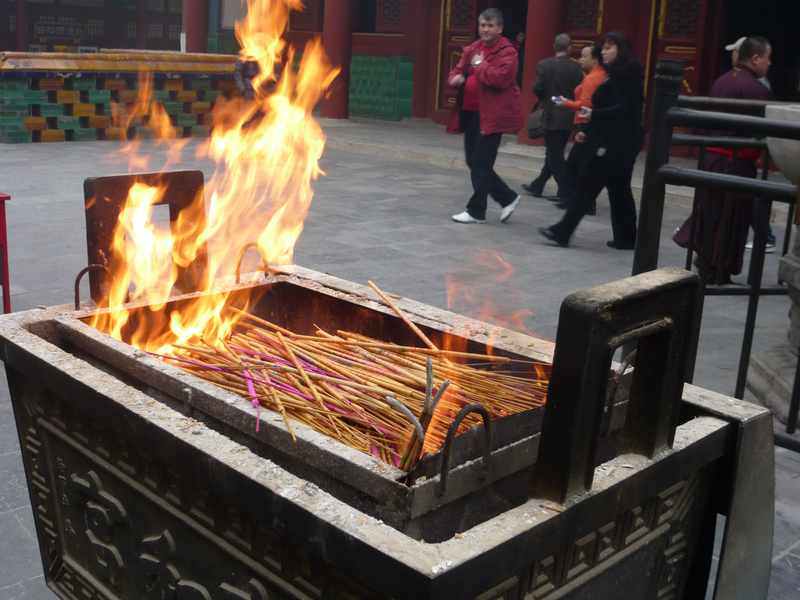 When you were done with your incense, you placed them in the fire pit to burn. 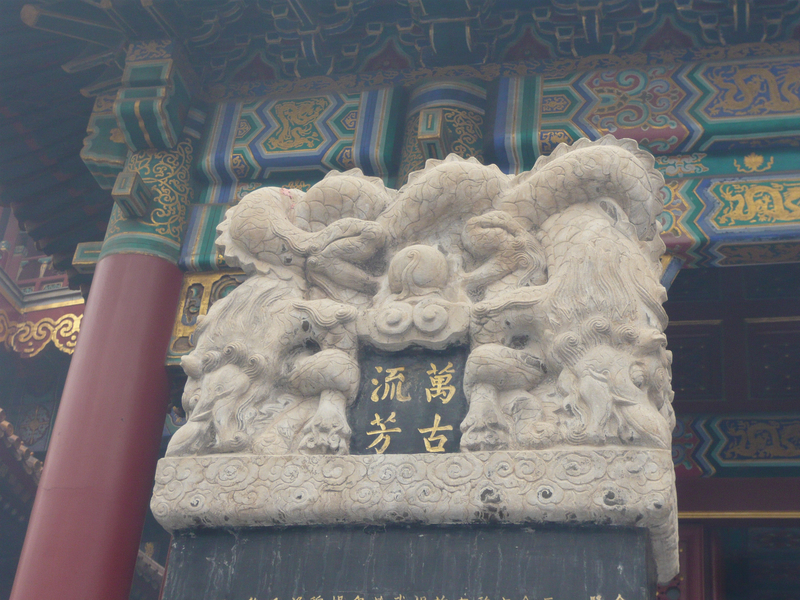 As always, there were lions protecting the temple. 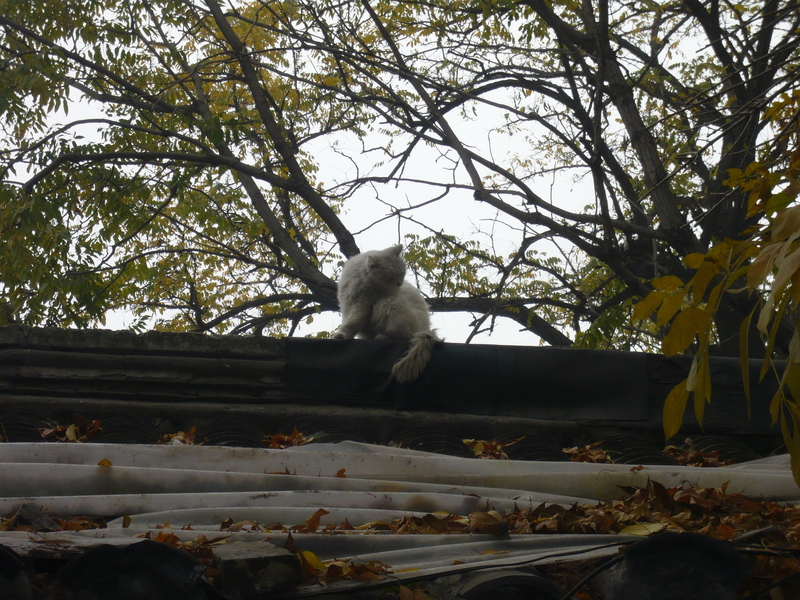 This one is a male with its location on the east side of the building and grasping a ball. 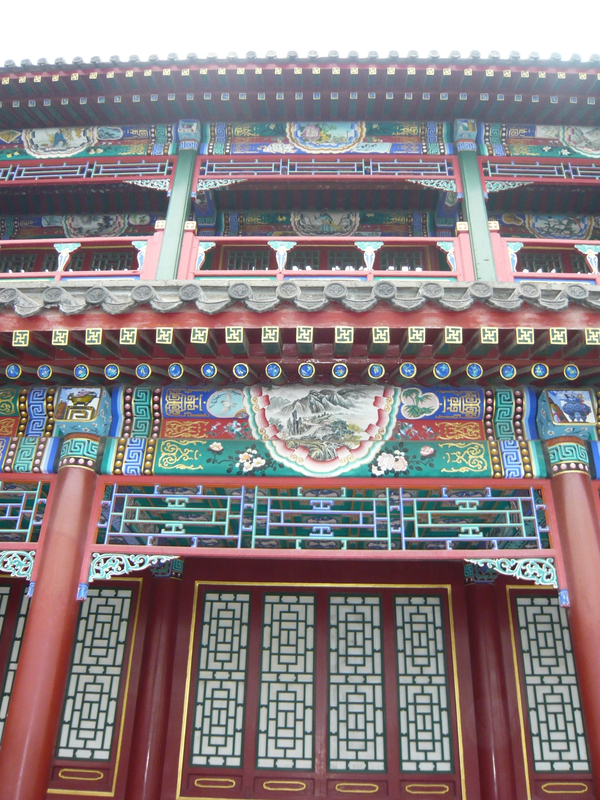 The breathtaking architecture of the temple reminded me of the palaces in the Forbidden City. 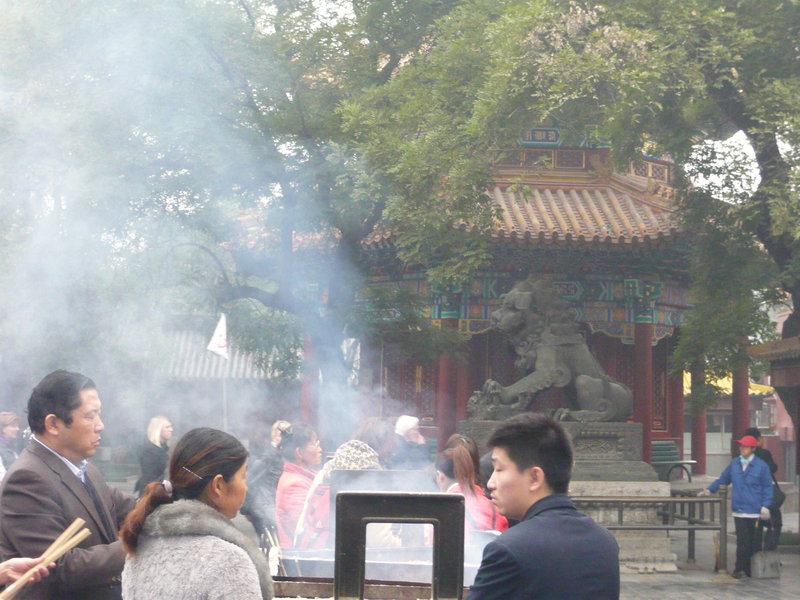 Yet the smoke-filled air from the burning incense gave the Lama Temple a much more mystical feel. Perhaps there was too much smoke in the air to take this picture but I still enjoy the close-ups of the incredible art and detail of the buildings. 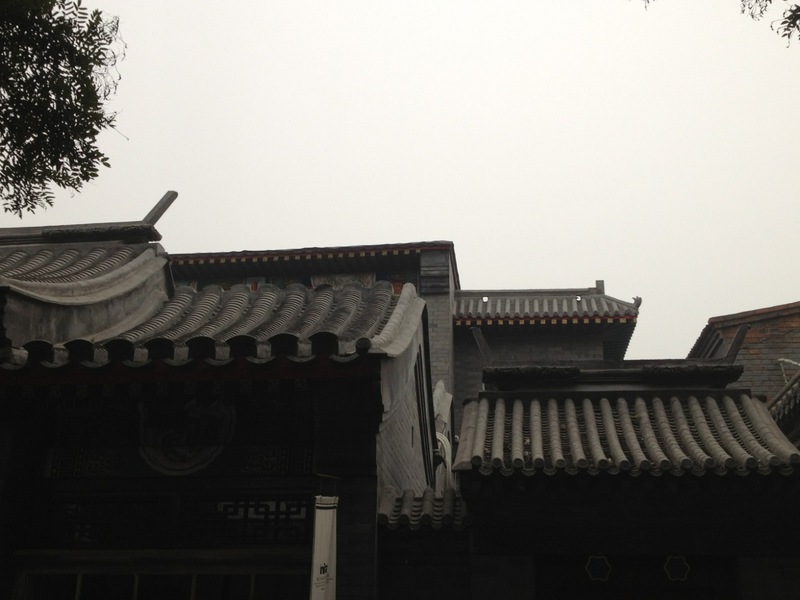 I left the Lama Temple feeling relaxed and peaceful. 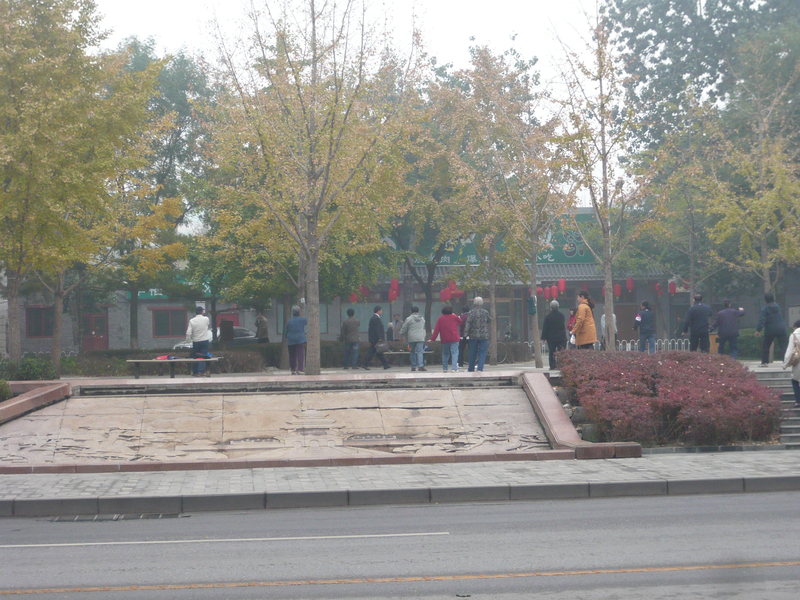 It was such a special place and I was relieved to see so many ordinary Chinese there practicing their religion openly. 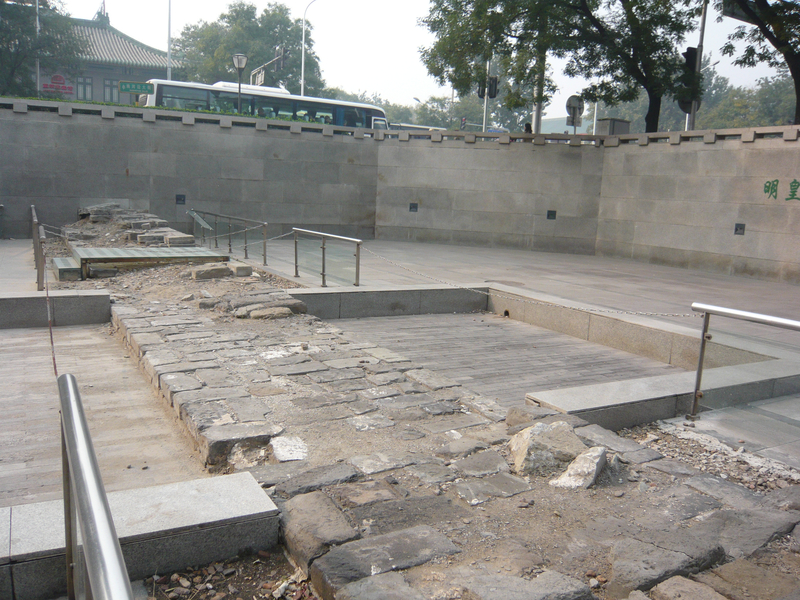 It is estimated that hundreds of Buddhist temples were destroyed after the revolution in China in 1949. It is a pity that they no longer exist. 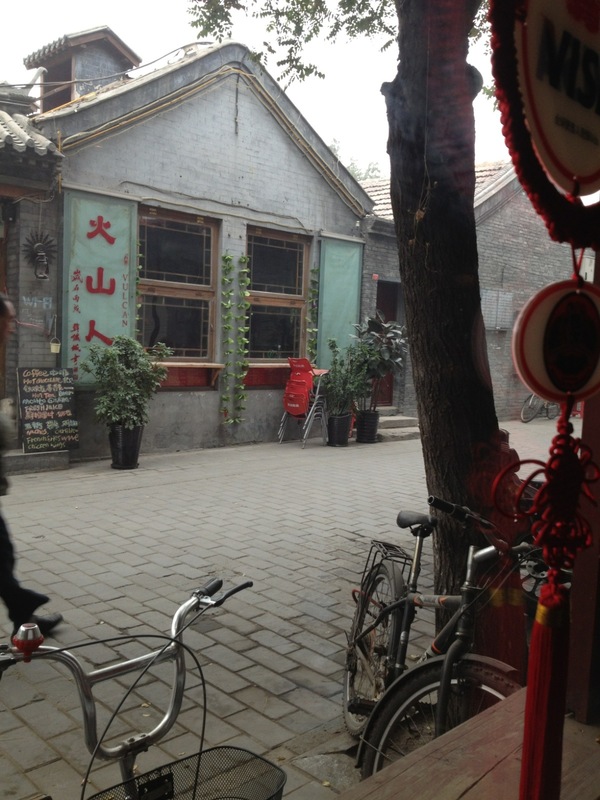 Stay tuned..Next stop is “Everyday life in Beijing”. 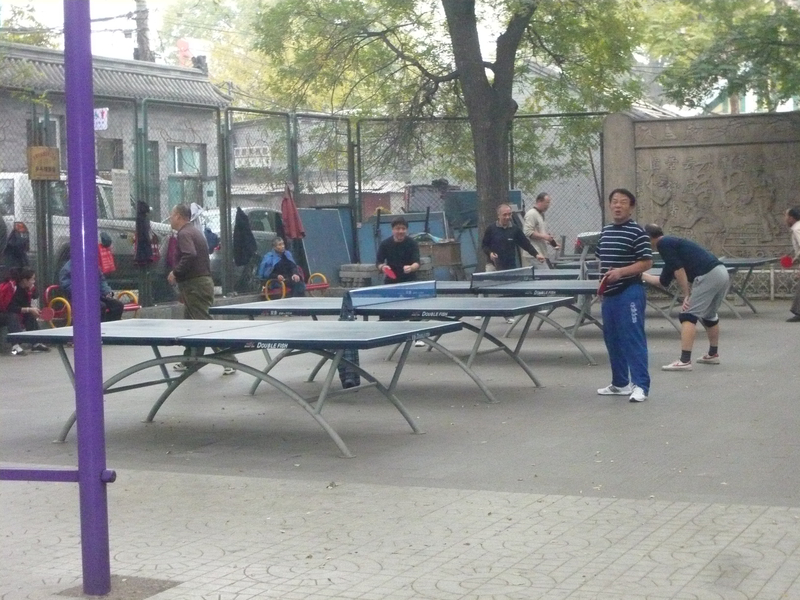 It is my last post on Beijing and a compilation of tons of great photos I haven’t shown yet. Thanks for reading ! While waiting in the American Airlines lounge at Chicago O’Hare to catch our international flight to Beijing, we found ourselves talking to a China “travel warrior”, one of those successful American businessmen who had either the luxury or the headache (depending on how you view things) of traveling overseas constantly to Asia. Since I never got his name, I’ll call him the Chinese Travel Warrior as it seemed to fit. 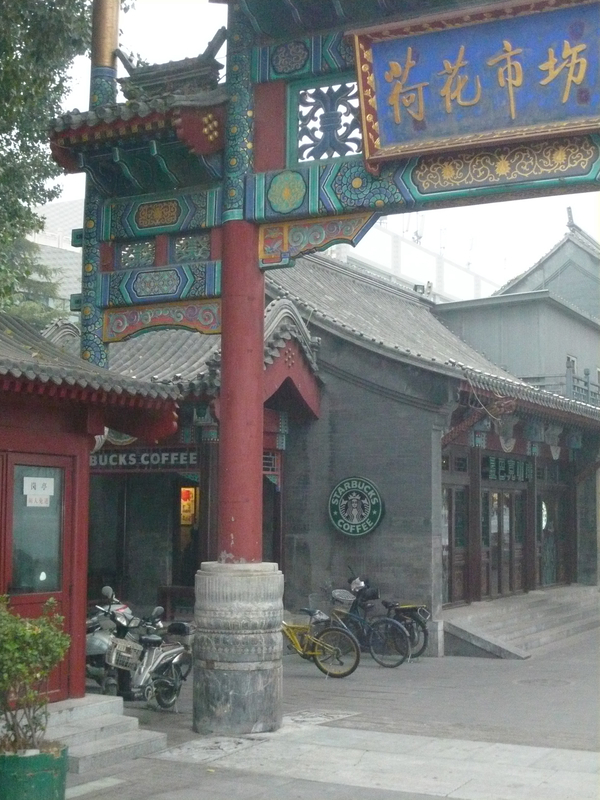 He’d been to China at least 40 times and was well versed in the ins and outs of traveling and doing business there. 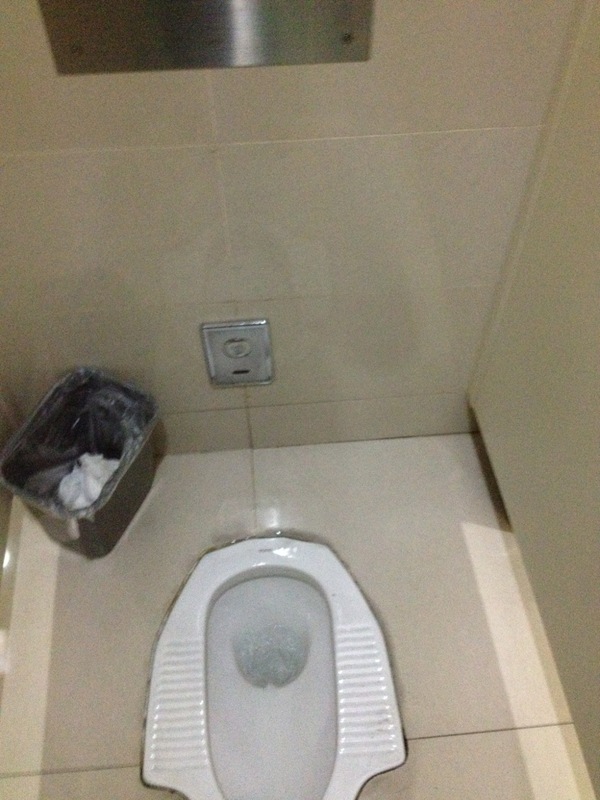 He’d informed me gleefully about the preparation of Peking duck as well as showed me a picture on his cell phone of what you’d get in China if you ordered Chicken Soup (yes, a real dead chicken foot sprouting out of the top). He told me the good and the bad, the nice and the dirty and helped get me excited about the adventure ahead. 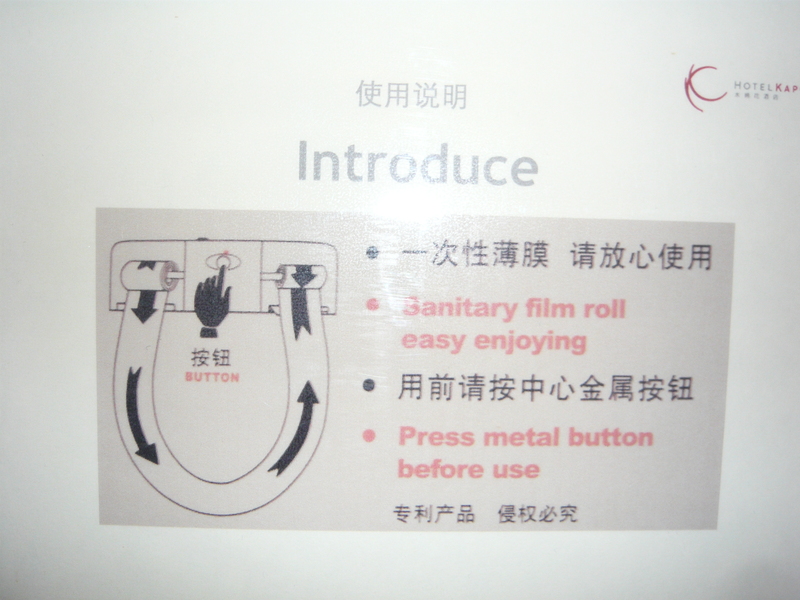 Probably the best piece of advice that the Chinese Travel Warrior gave me, however, had to do with sightseeing. 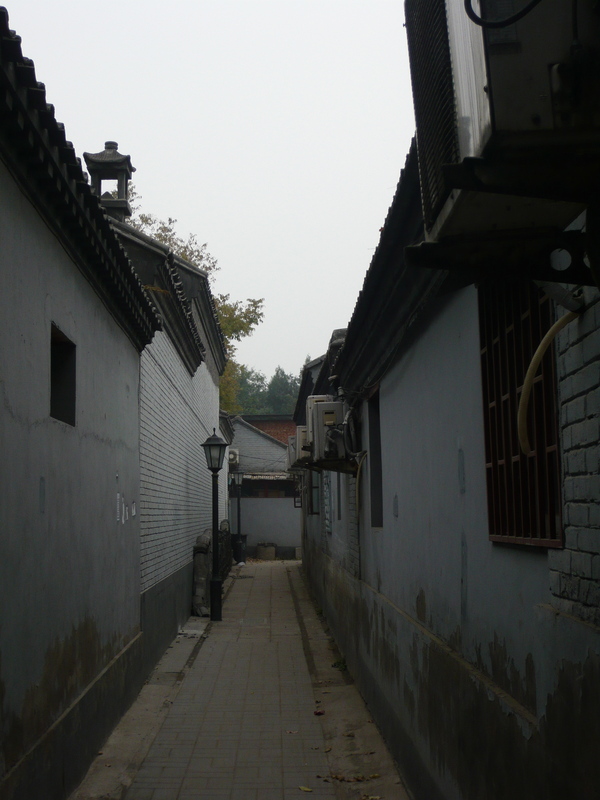 He told me that I had to spend some time in Beijing’s infamous Hutongs or “narrow alleyways” that mysteriously thread through the heart of old Beijing. 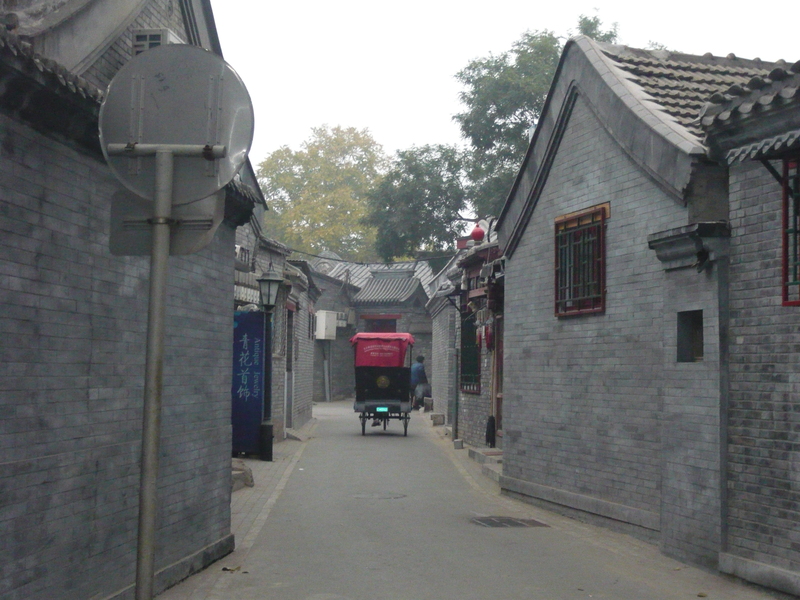 He told me that the Hutongs are where the history, culture and life of old China can be seen, if that is, you can find them. 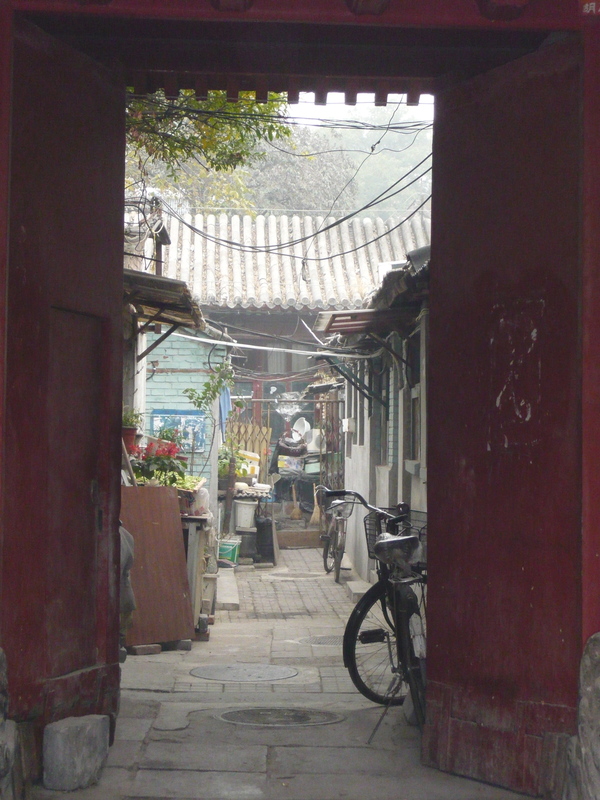 The spirit and soul of the city lives and breathes among these charming and ragged lanes where a warm sense of community and hospitality survives. 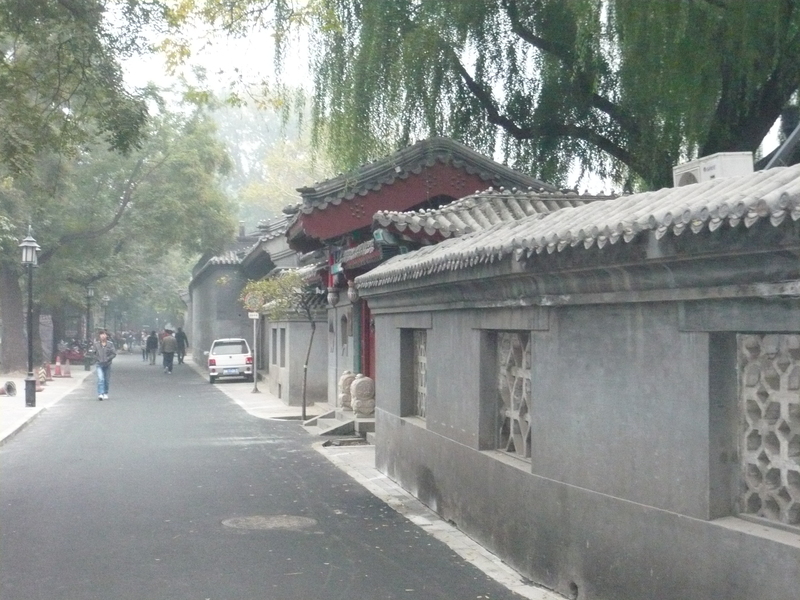 Criss-crossing chunks of Beijing within the Second Ring Road, the hutong link up into a huge and enchanting warren of one-story dwellings and historic courtyard homes. 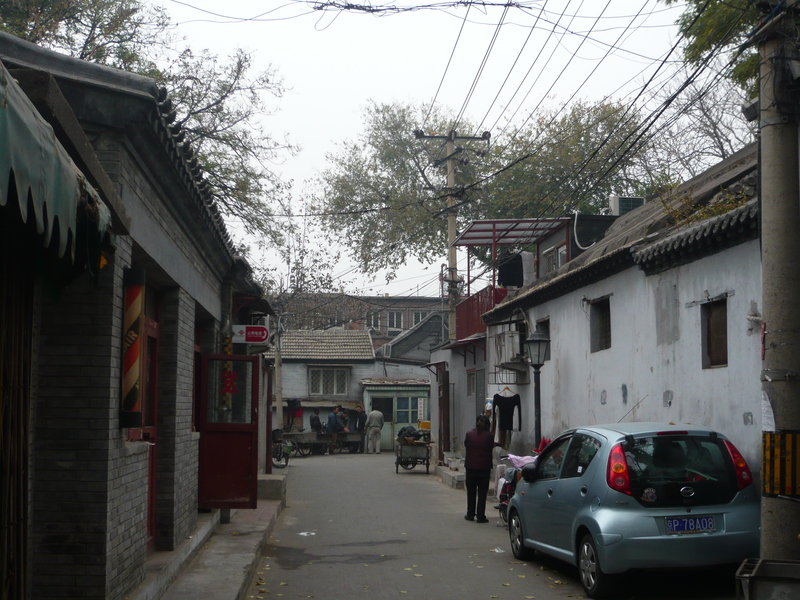 Hundreds of hutong survive but many have been swept aside in Beijing’s race to build a modern city. 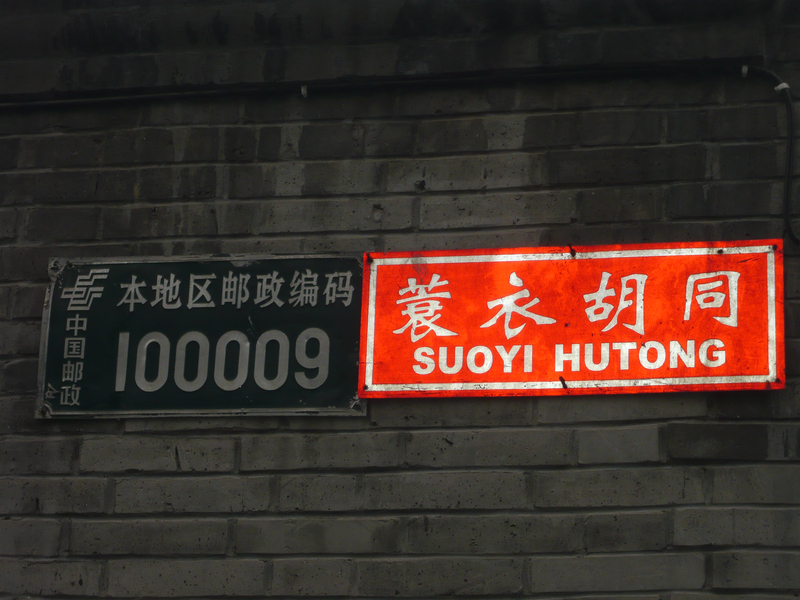 The description of the hutongs obviously grabbed my attention and lead my father and I on a three-day search in finding the best and the most colorful hutongs in all of Beijing. 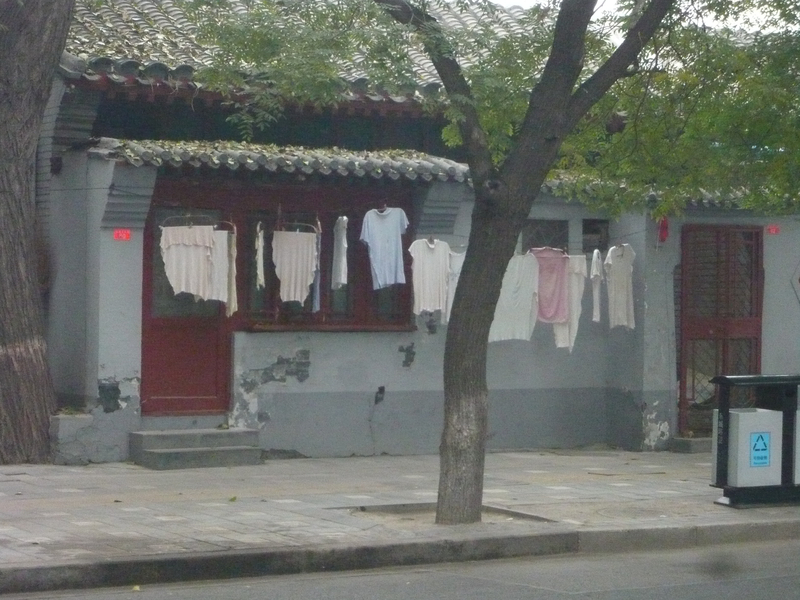 Here is a collection of my photos taken during our explorations of Beijing’s Hidden Hutongs. 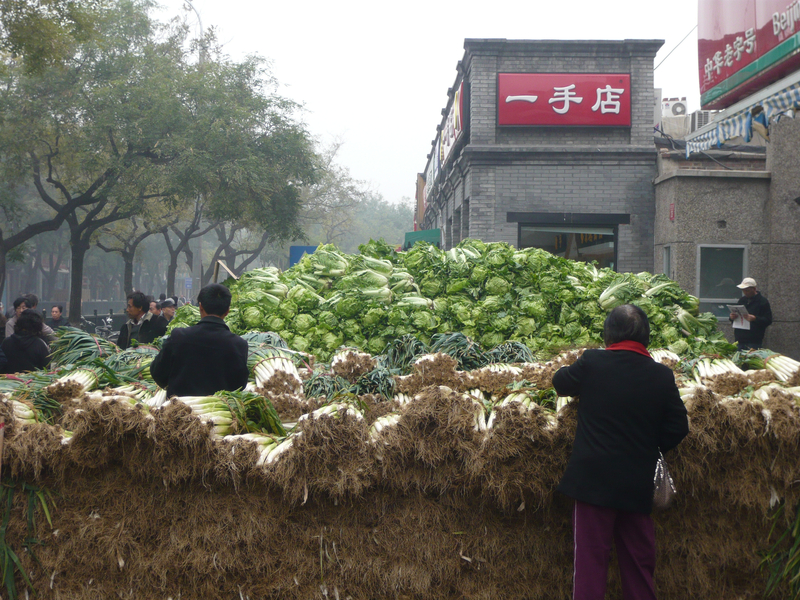 Finding the Hutongs was half the battle and half the fun. 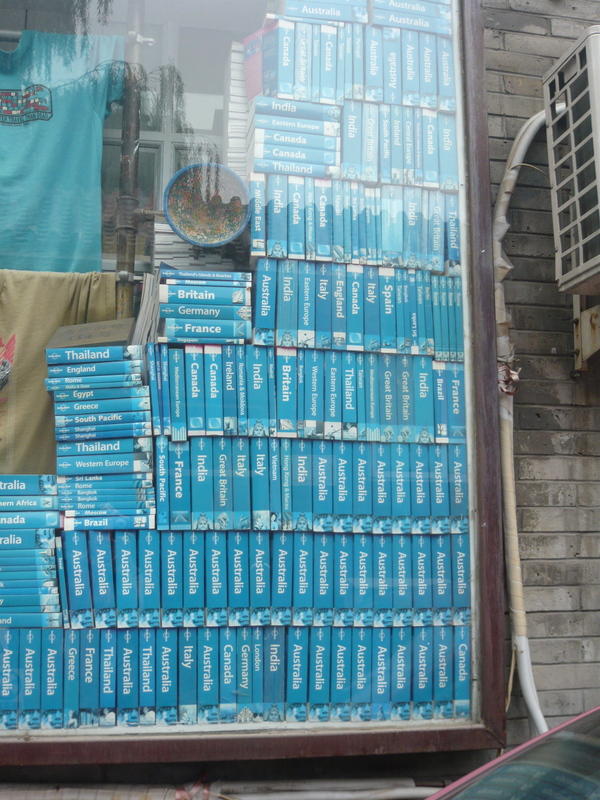 Our first day in Beijing, I was on a mission to find them. 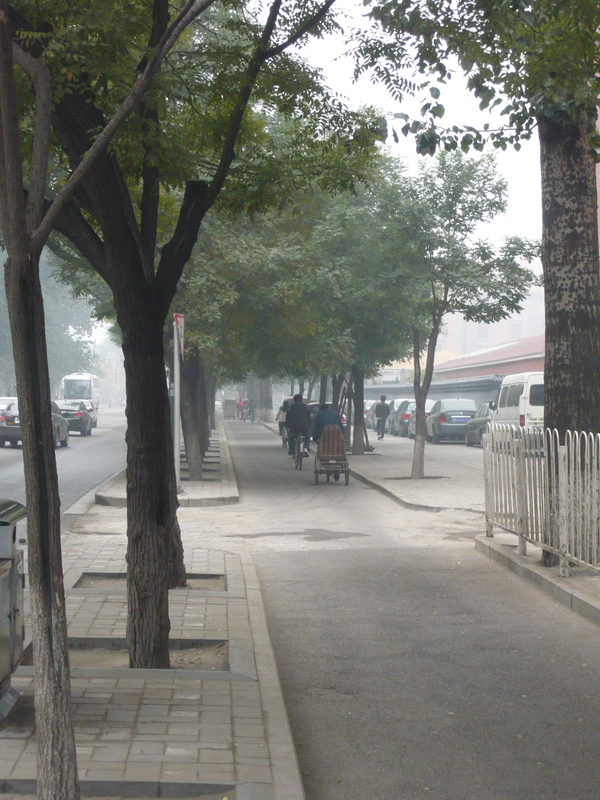 We walked until we dropped, for over eight hours, pounding the pavement of Beijing. 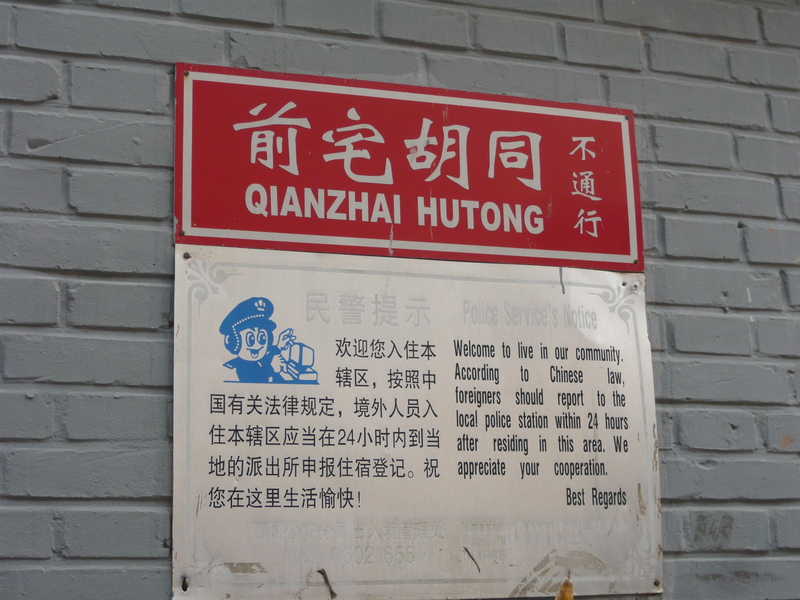 I had read in Lonely Planet that all the Hutongs are marked with a historic sign. Yet finding them on a map was another challenge all together. 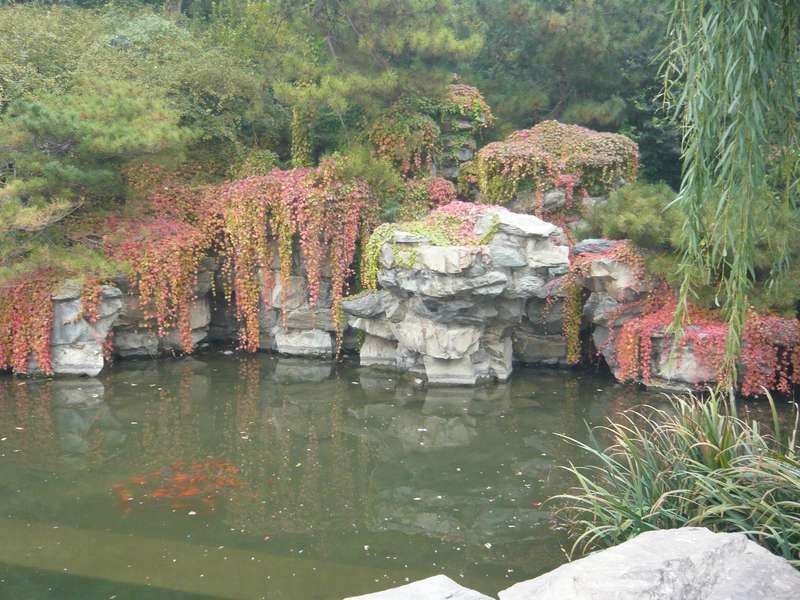 We realized that the best way to find these hidden treasures was to walk without a map and explore. 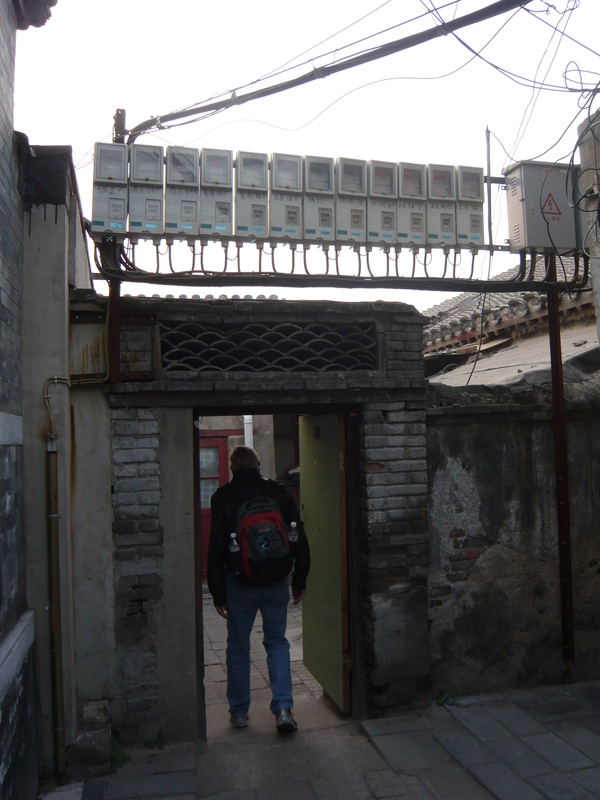 Eventually after lunch we found our first section of Hutongs located directly behind the Forbidden City. 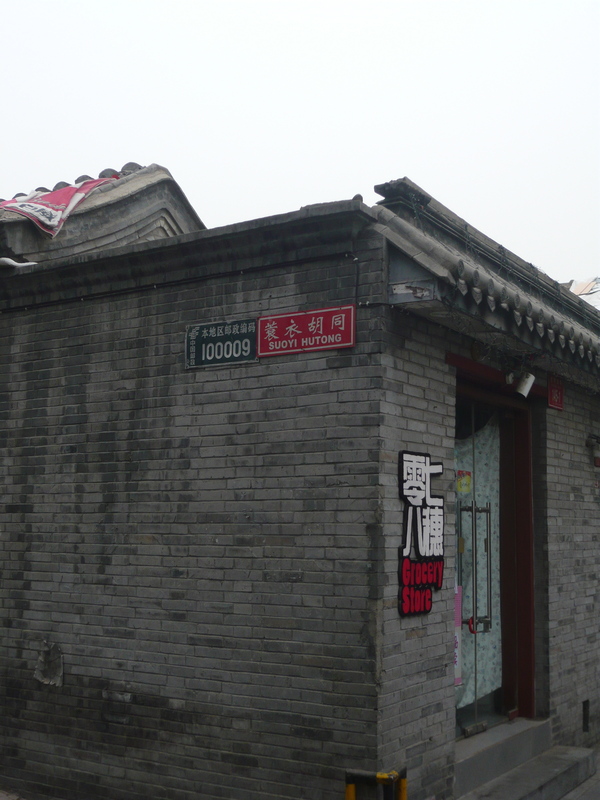 Before I saw the red sign (photo below), I noticed a dramatic change in the architecture of the buildings and most notably the roofs (photo above). 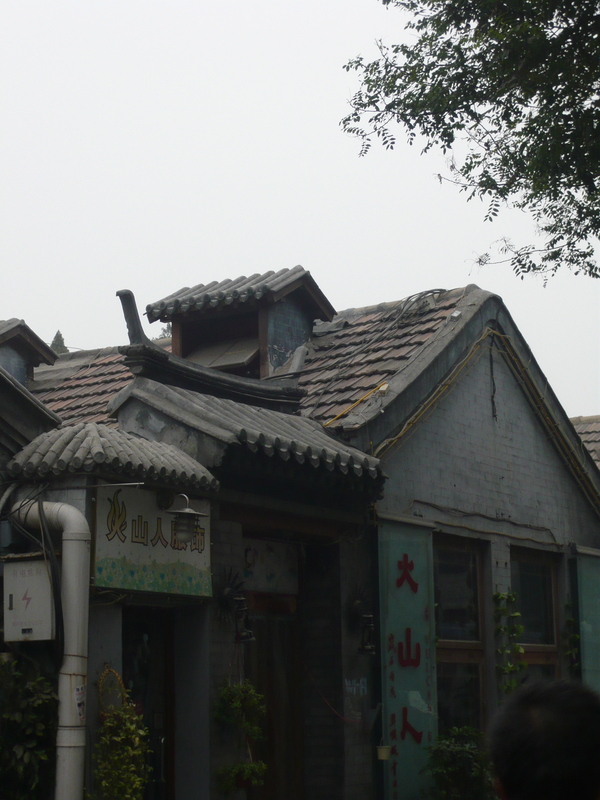 They looked old.…could these be part of the Hutongs I was searching for? I wondered. 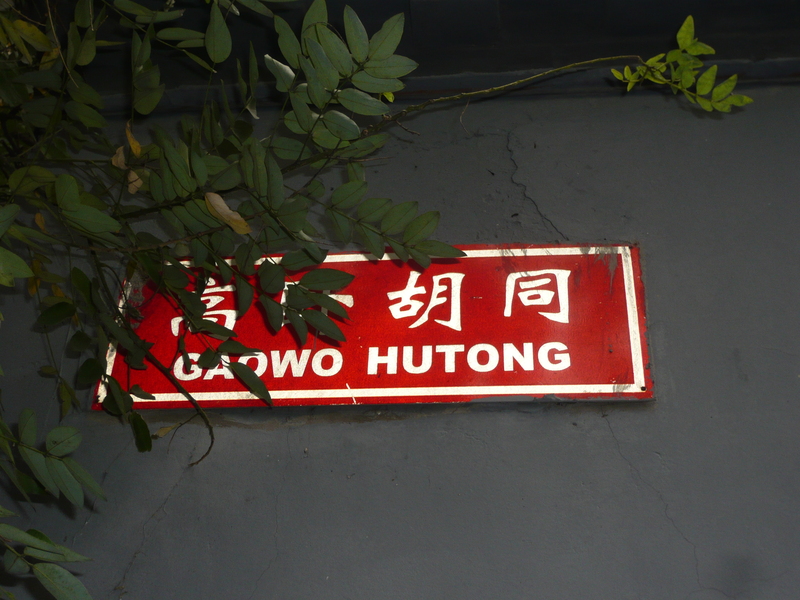 This sign confirmed it: Our first Hutong spotting! 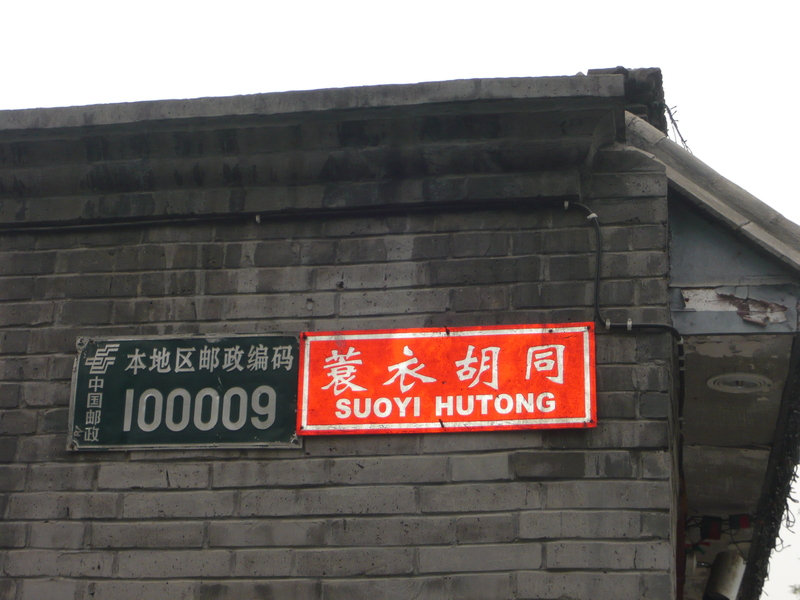 Yet this Hutong wasn’t too inviting. Perhaps it was being renovated? We decided not to walk down and explore it much further than this picture. I knew there would be more. Many more. We would just have to find them! 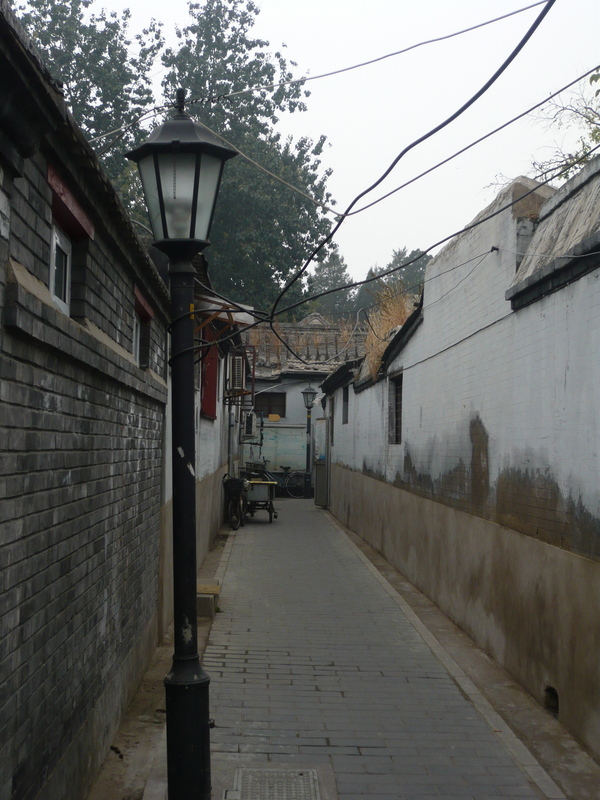 We continued our walk down Beichang Jie, one of the main drags located behind the Forbidden City, in search of more Hutongs. We saw lots of interesting photo shots like the one above which I adore. 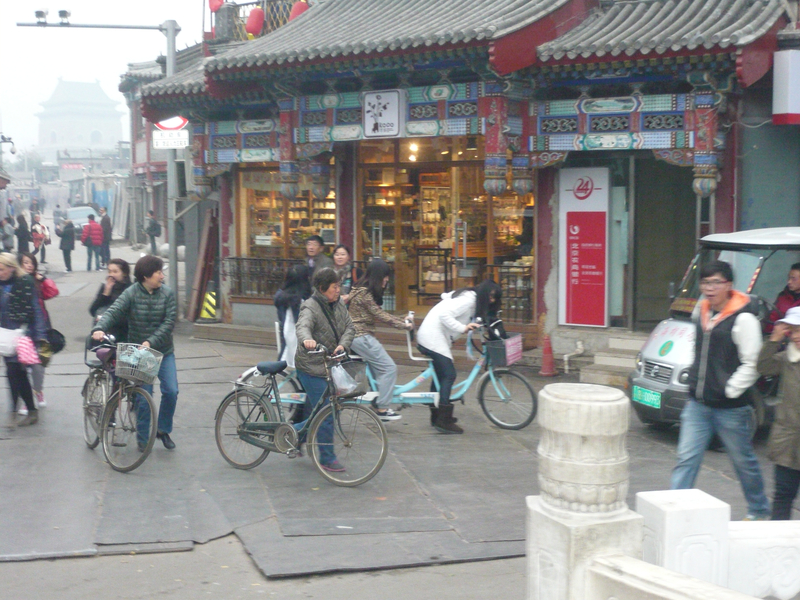 I love the old bicycles and the cool buildings. 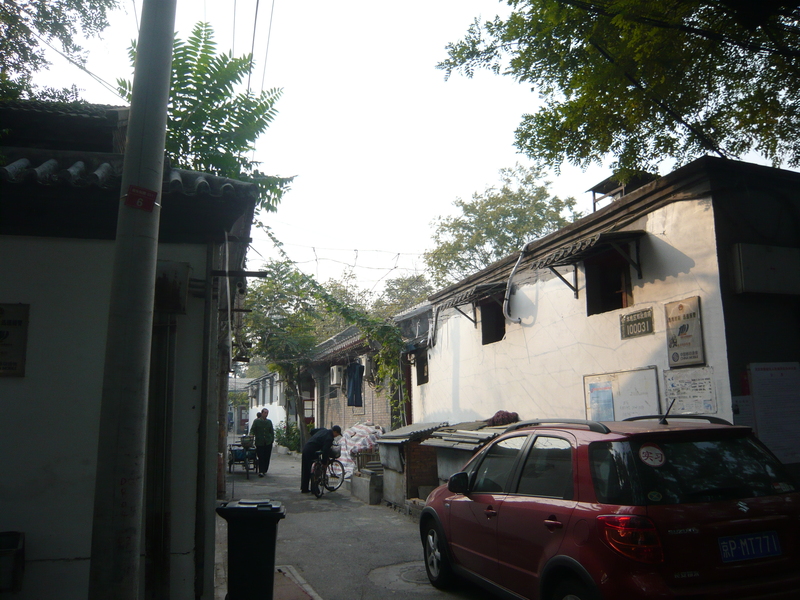 We walked a little further and came across this lovely Hutong. 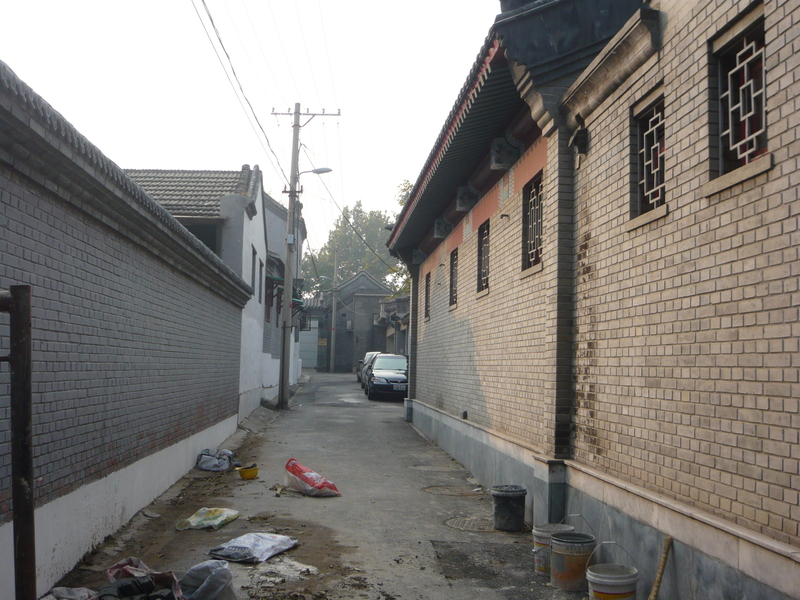 I found a splendid alleyway but there was not much else back there but quiet courtyard homes. 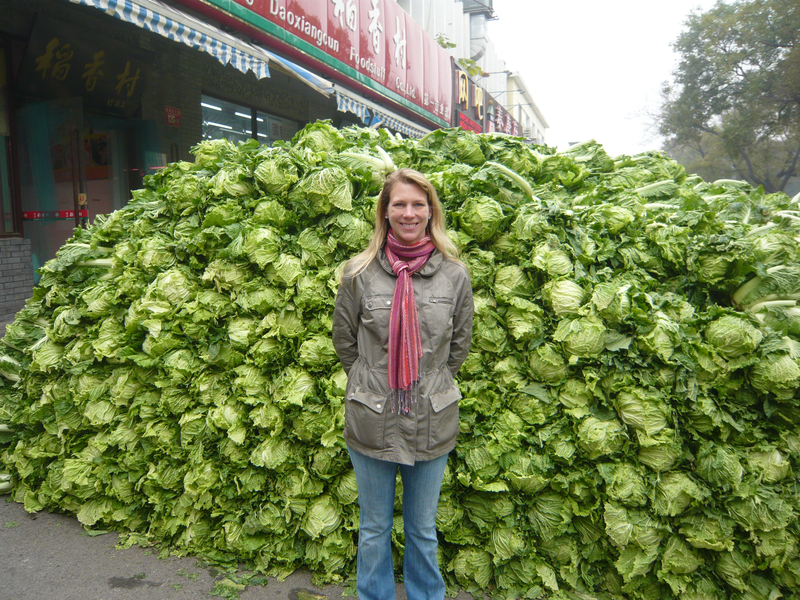 I was fascinated by the Hutongs and could have explored them all day long! 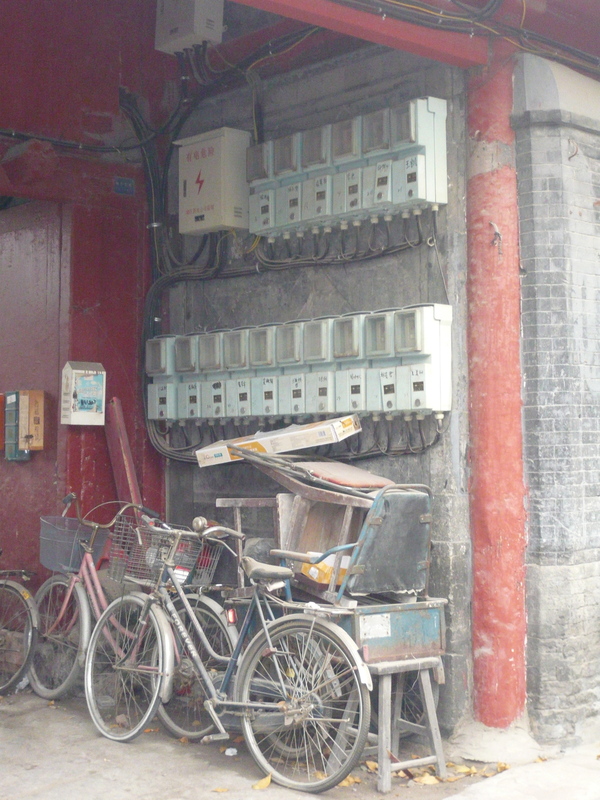 Here is my dad going under the electrical boxes that provide electricity to these ancient homes. 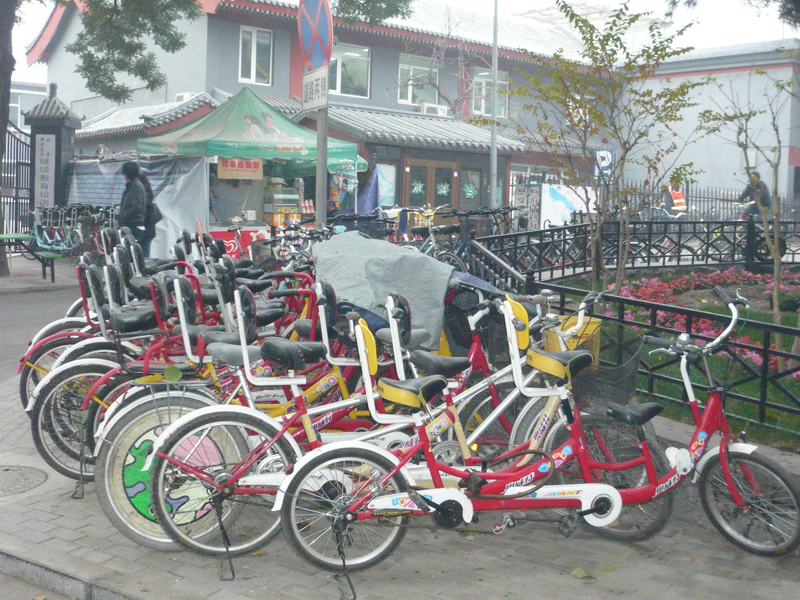 The Hutongs are narrow thus all bicycles are normally parked outside the entrance. I love this picture. For some reason, it is one of my favorites from the trip. 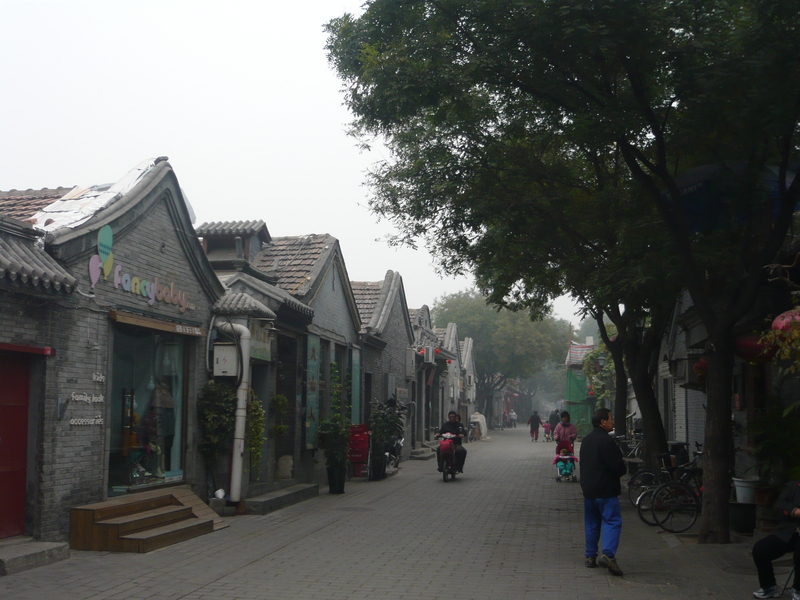 During our second day in Beijing, we discovered an entirely new area of Hutongs located by Qianhai Lake in North Dongcheng. 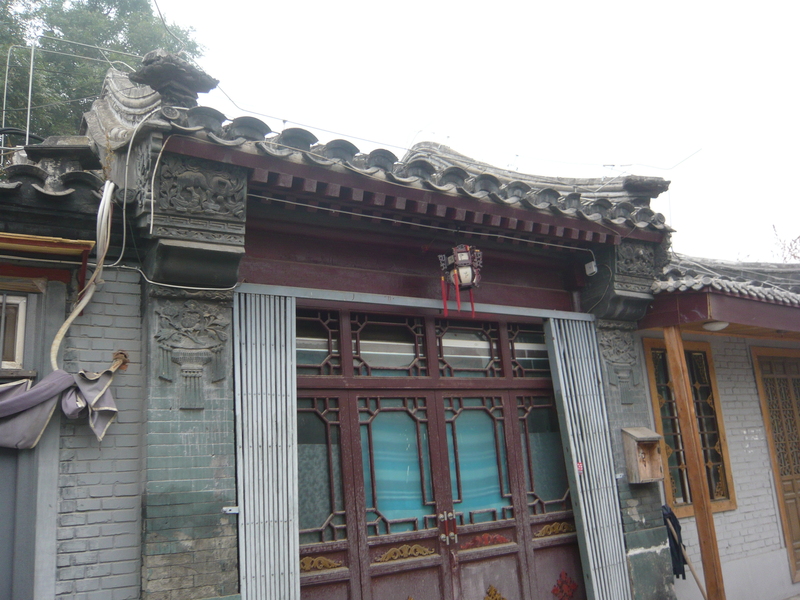 These Hutongs were more than residential and had stores, bars, restaurants and even chic boutique designer shops. 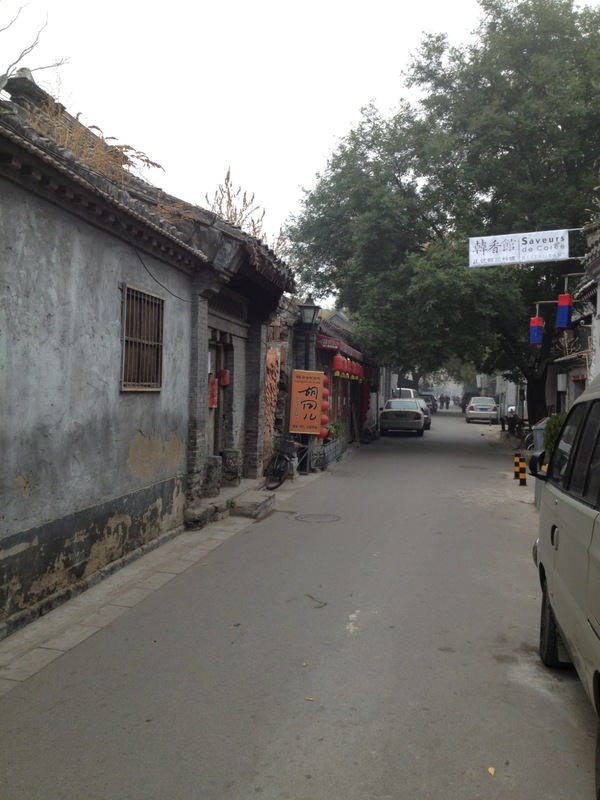 Here is a more lively Hutong that we found the second day which snaked around in many different directions. I found it hard to not get lost. 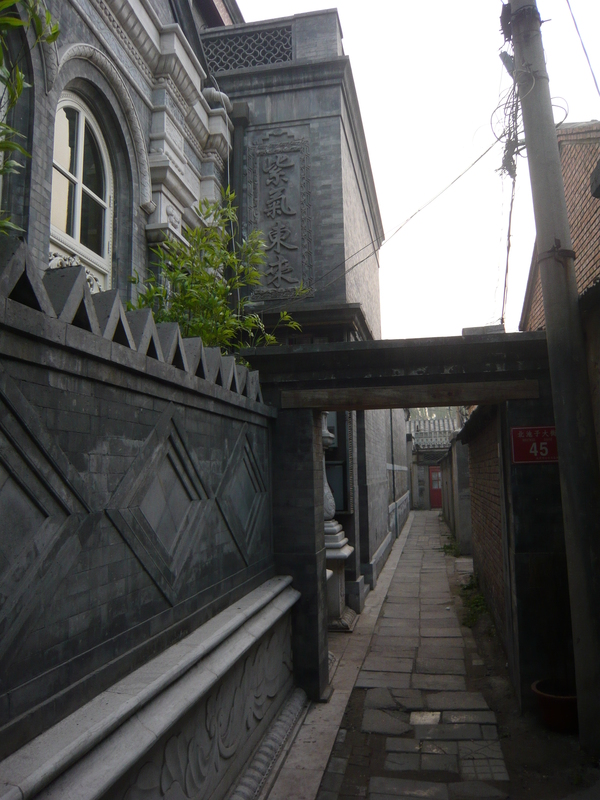 Yet getting lost was probably the best aspect of our search for the hidden Hutongs. That meant you discovered new things that you probably would have missed. Sometimes traveling without a map is the best way to travel. 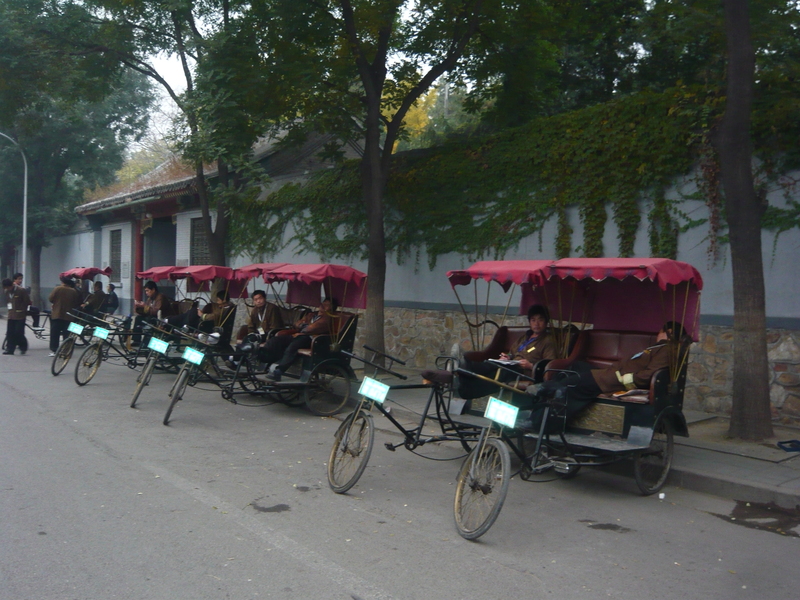 If you did get lost or not want to get lost, you always had the option of hiring a rickshaw to show you the way. 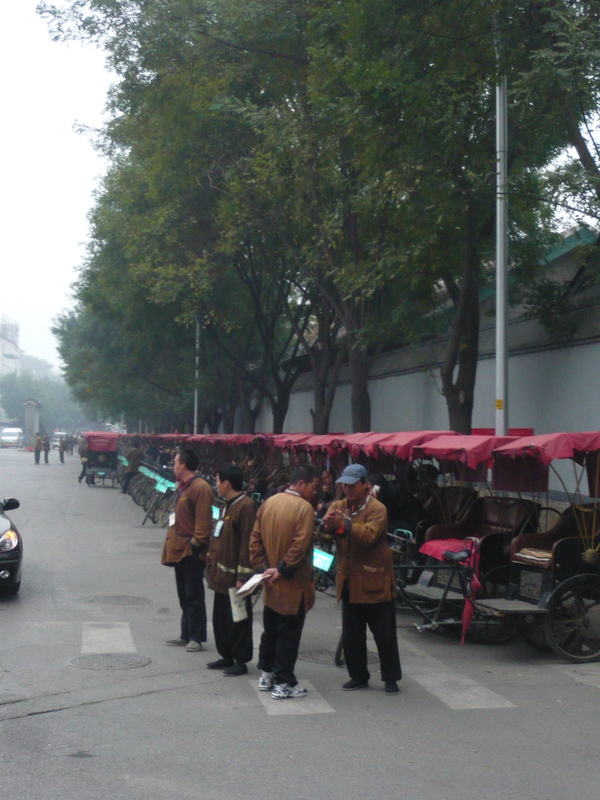 We found this line up of eager rickshaw guides in a more touristy section of Hutongs (now what it was called still remains a mystery to me! 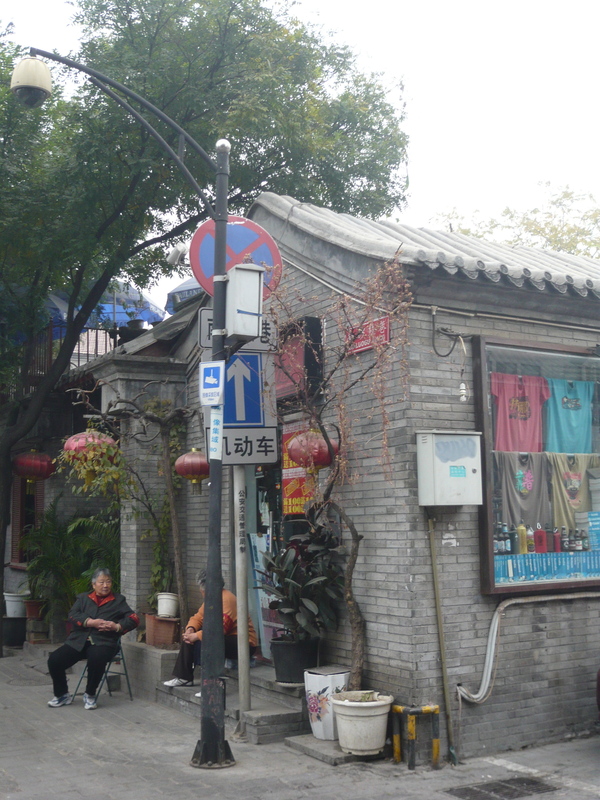 Again, it is a hutong that we managed to stumble upon and never found it again!). Comparing notes and trying to work a deal. 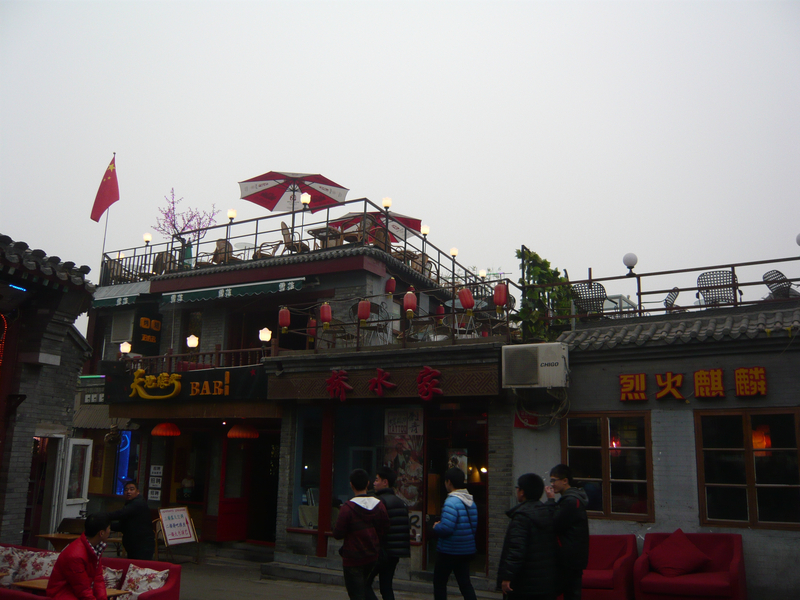 After hours of walking and exploring, we finally came across this trendy Hutong that had tons of cool bars, restaurants and shops. This time we made a note on how to get there and find it again! 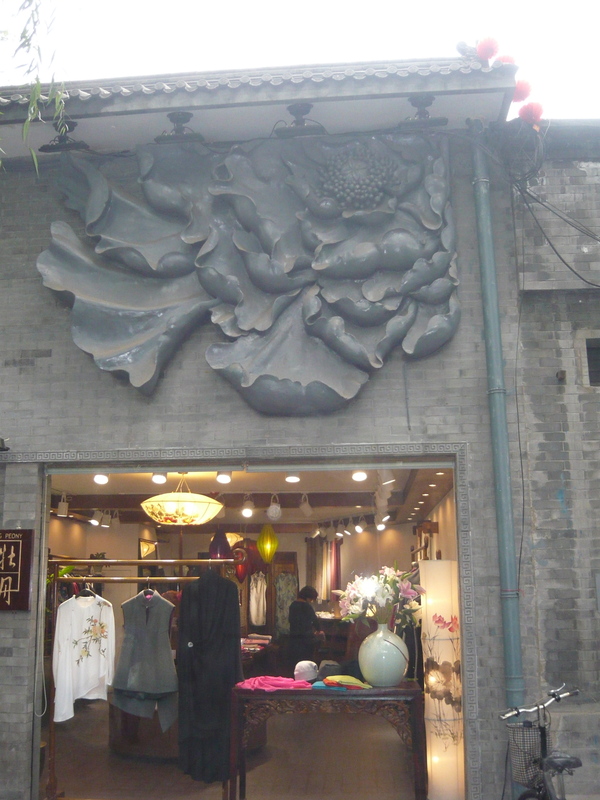 Some of the beautiful boutique shops found in the Hutong. 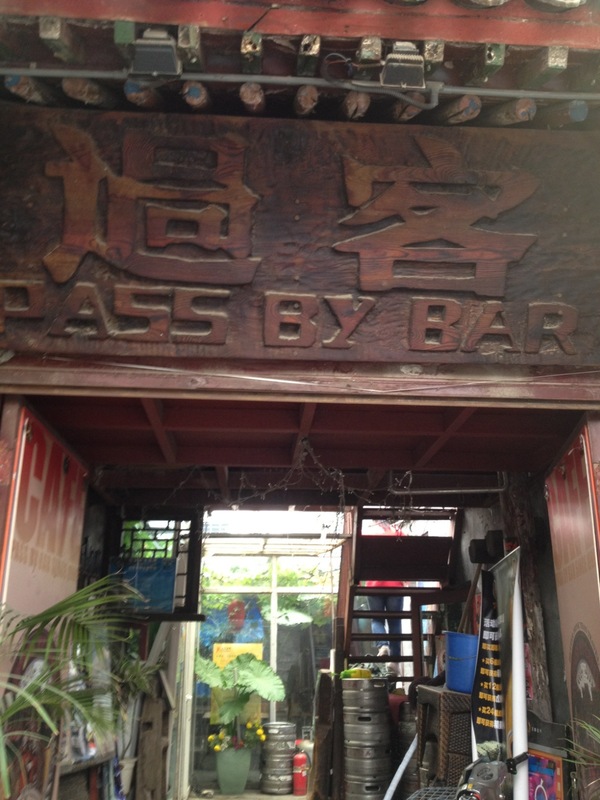 By lunch time, we were ready to take a rest and found the perfect place, The Passby Bar, located on Nanluogu Xiang, which was a great place to eat and watch the world go by. Above is a picture of all the restaurant’s Lonely Planets! 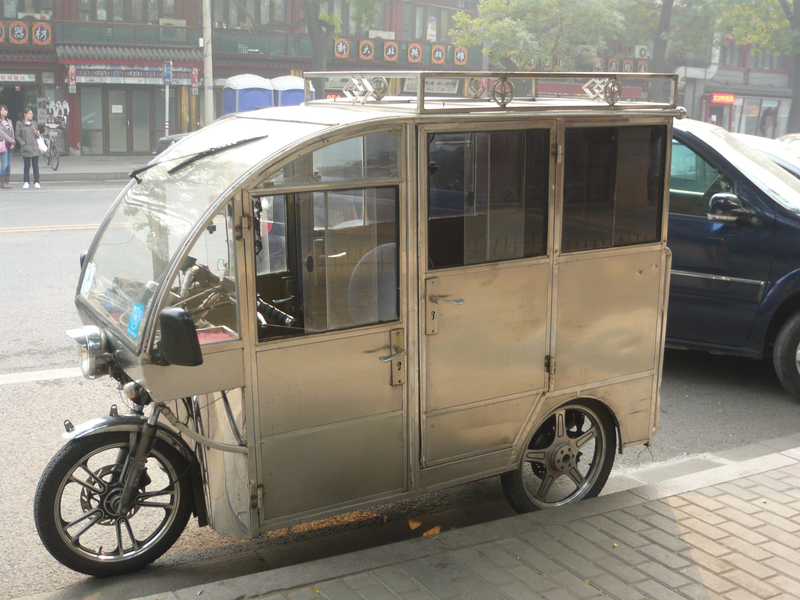 Apparently the owner is an avid world traveler! 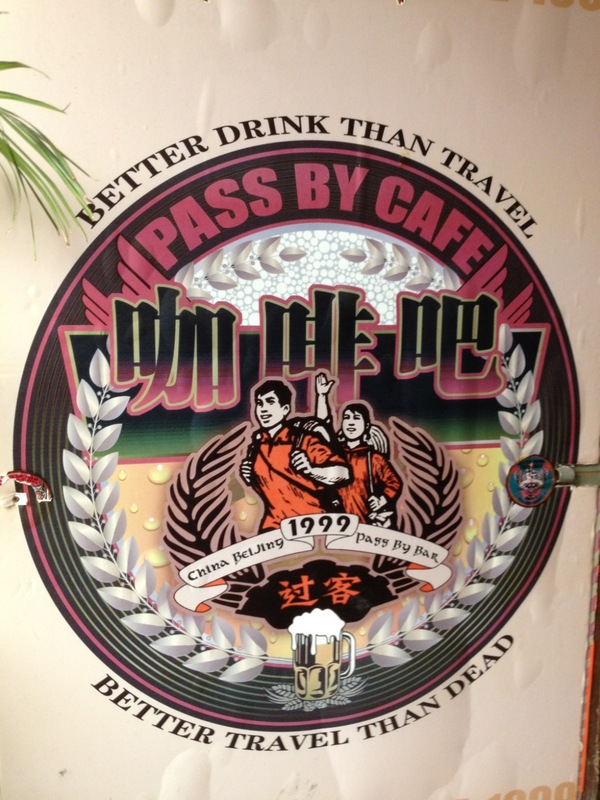 As we entered the Passby, it felt like entered some kind of English pub. 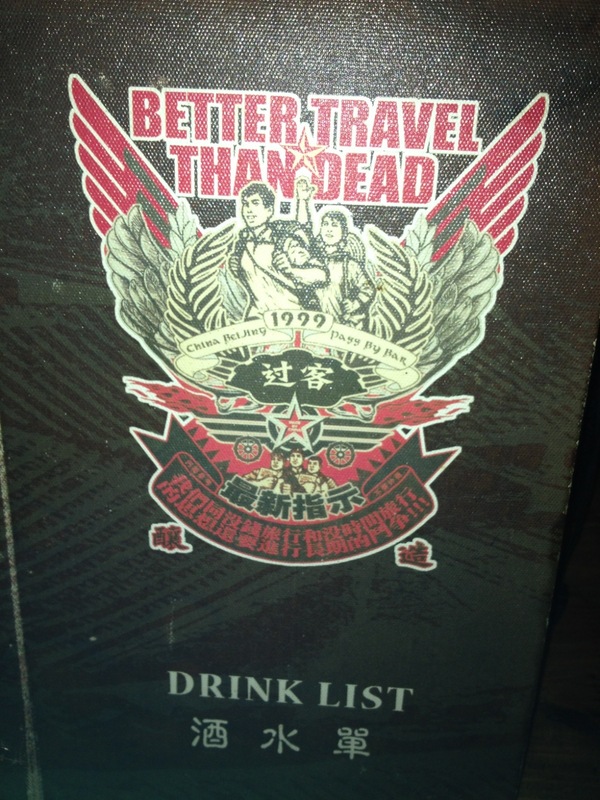 I LOVED their motto: BETTER TRAVEL THAN DEAD! It seems like it was written for me! After a delightful lunch with of course a glass of wine, it was back to it. 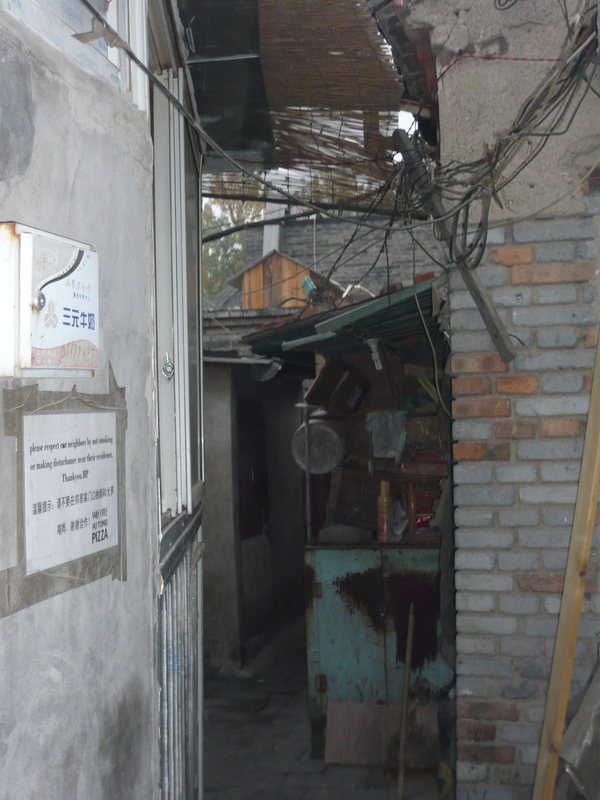 I was determined to find more of Beijing’s hidden Hutongs and the more we walked, the more we discovered. The architecture was a photographers dream. 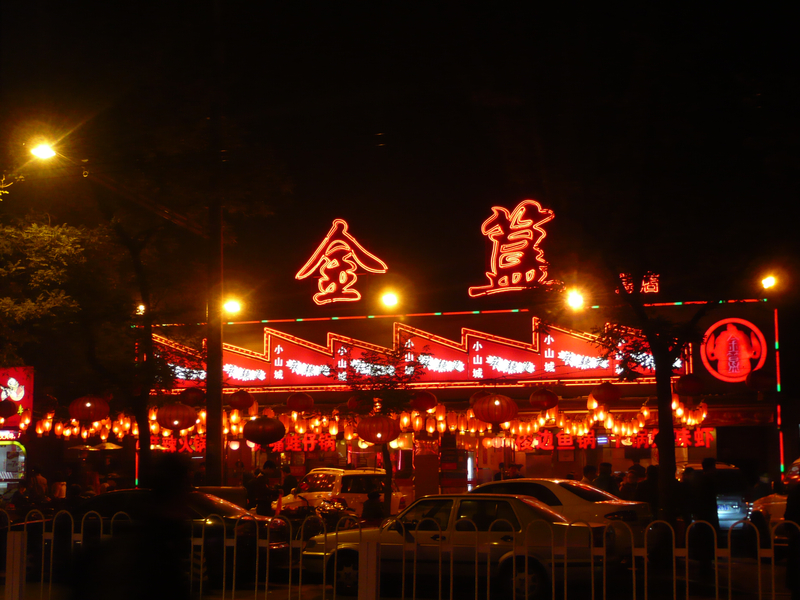 We left the Hutongs feeling excited about what we’d seen and looking even more forward to coming back to experience them at night, when they come to life with people, lights and mystery. 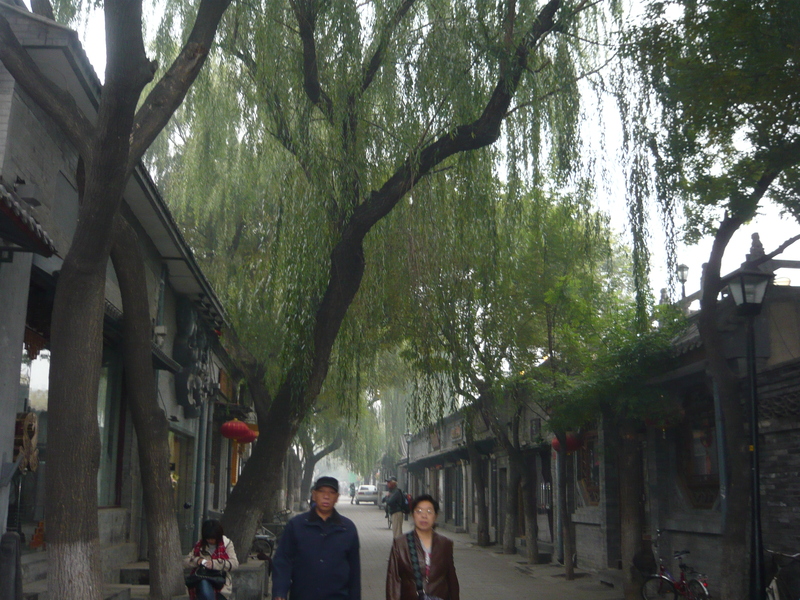 The Chinese Travel Warrior was right….you can’t possibly see Beijing without finding the hidden Hutongs which are the true heart and soul of the city and its magical past. 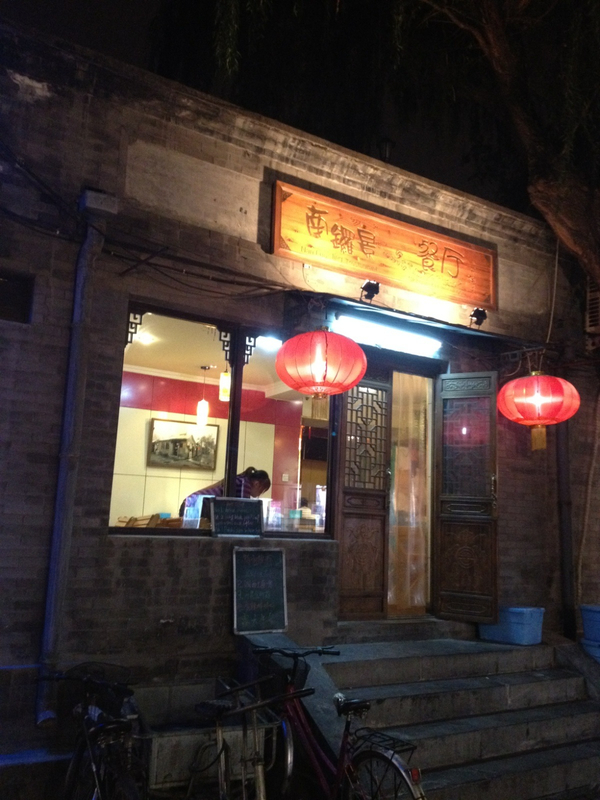 Stay tuned…next post will be on Beijing’s Hutongs at night!